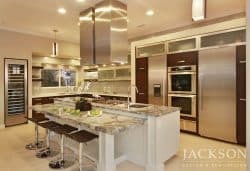 Kitchens have become a focal point in today's home, a central area for cooking, entertaining, doing homework and spending time together. 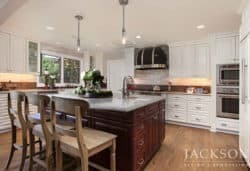 When you embark on a kitchen remodeling project, working with a professional team ensures you will be happy with the results of your kitchen remodel for years to come. 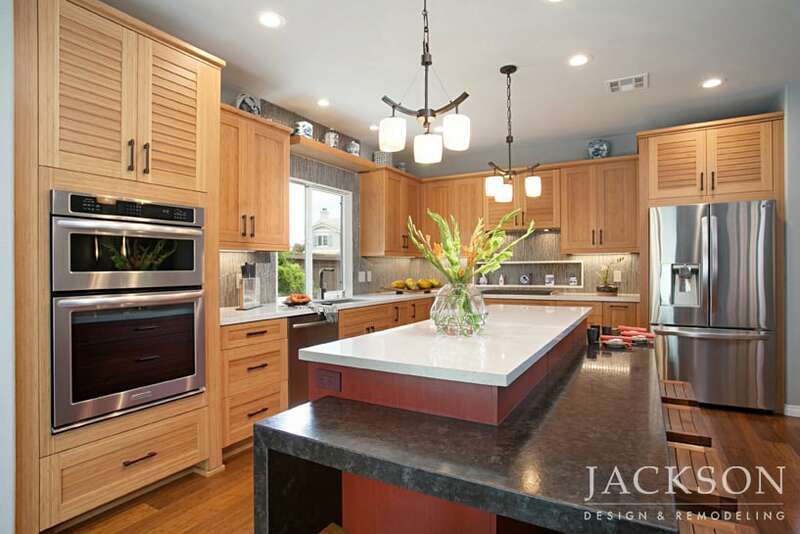 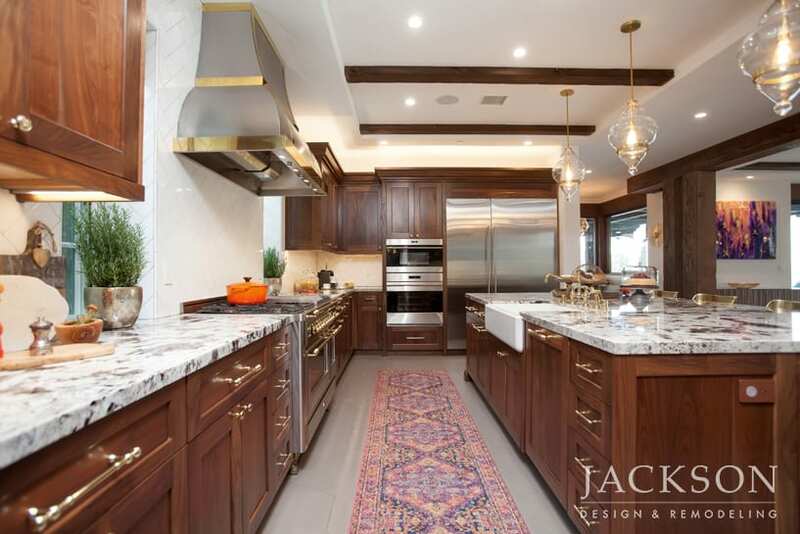 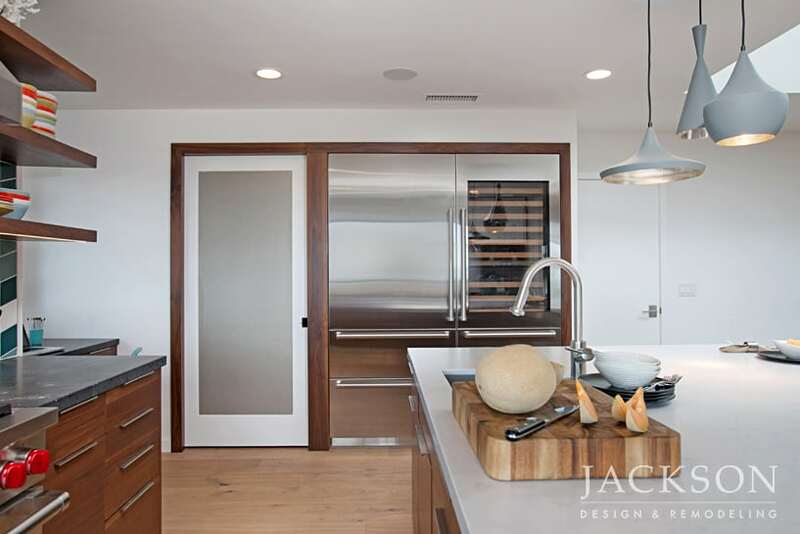 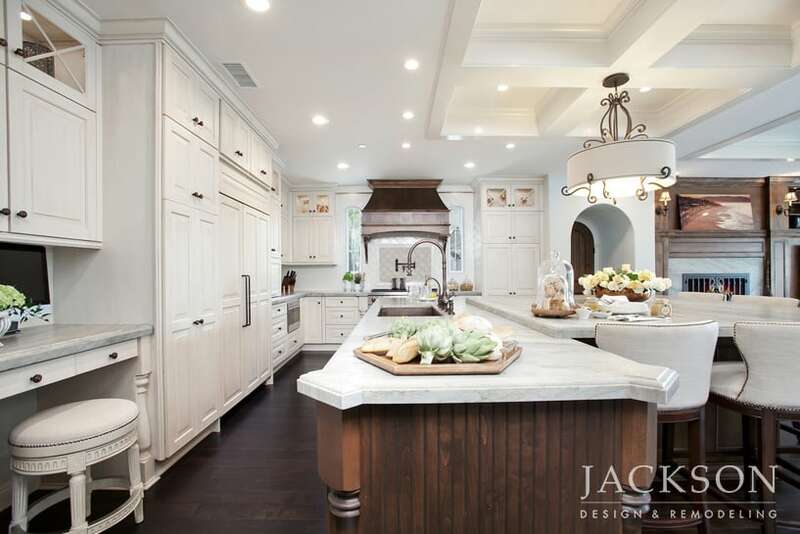 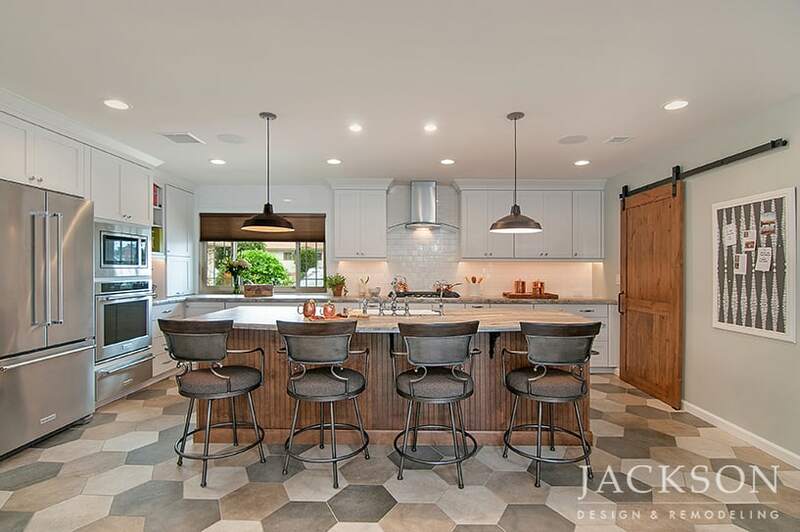 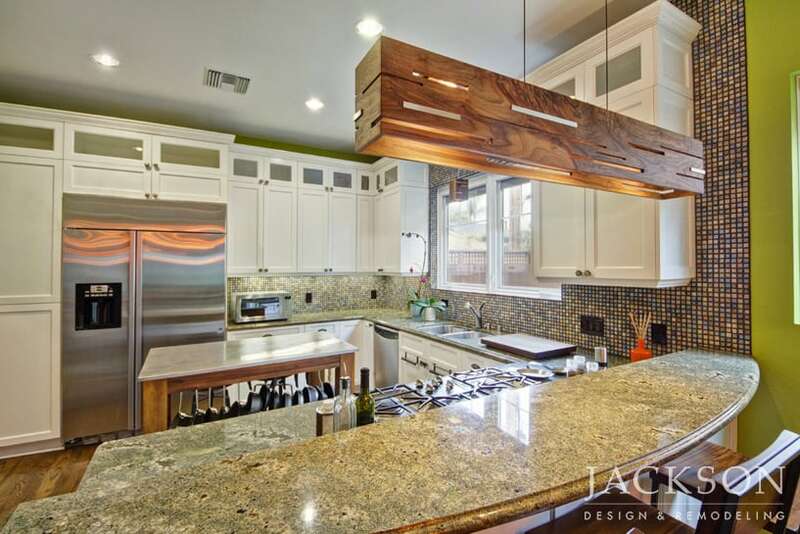 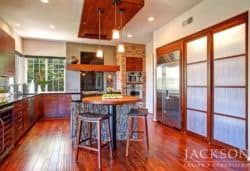 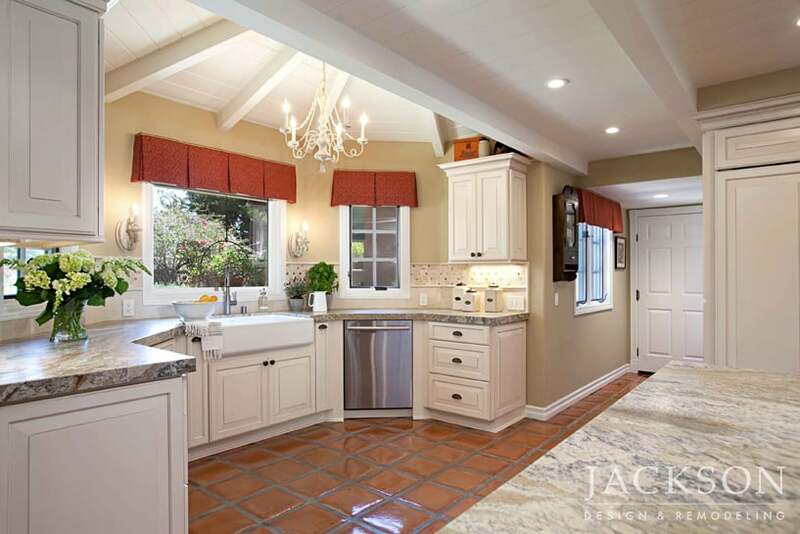 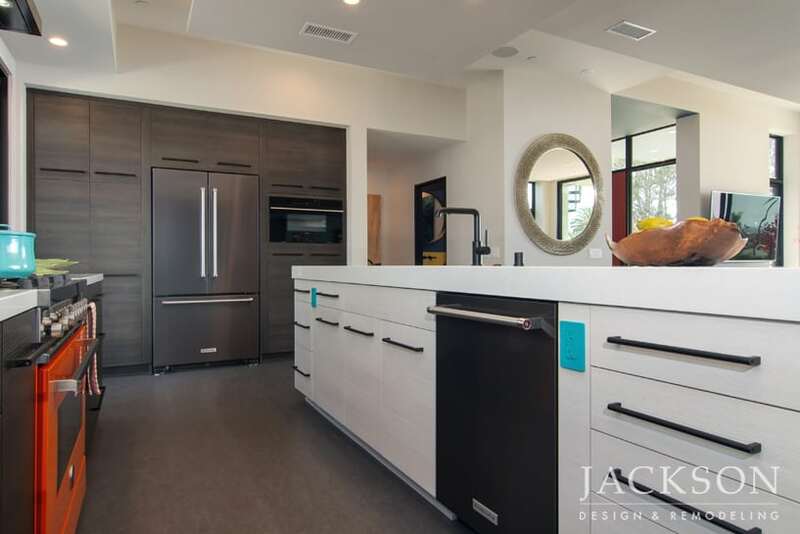 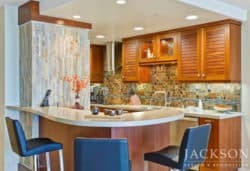 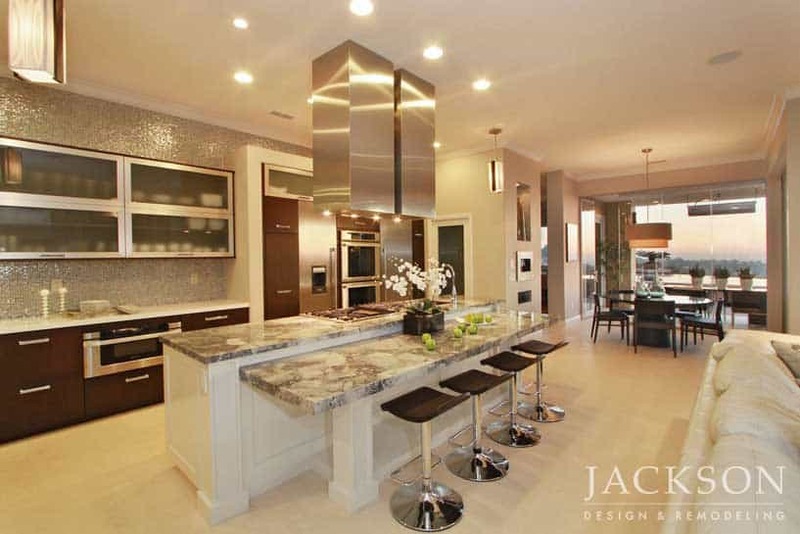 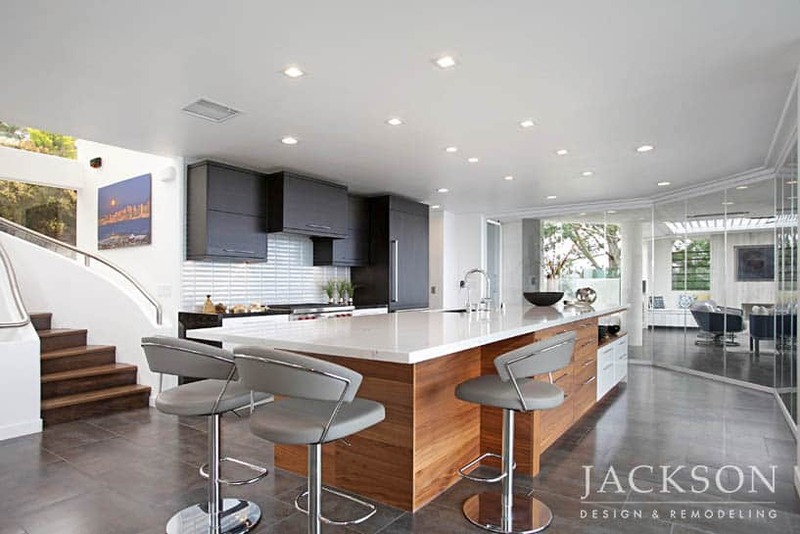 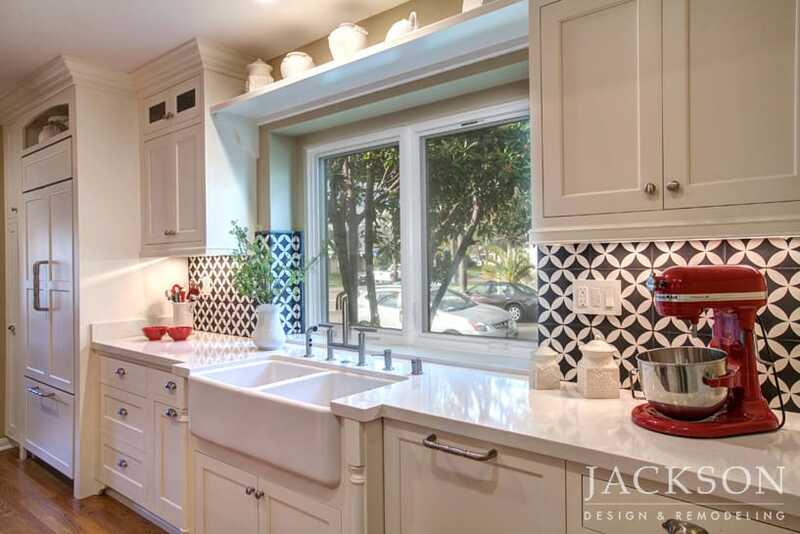 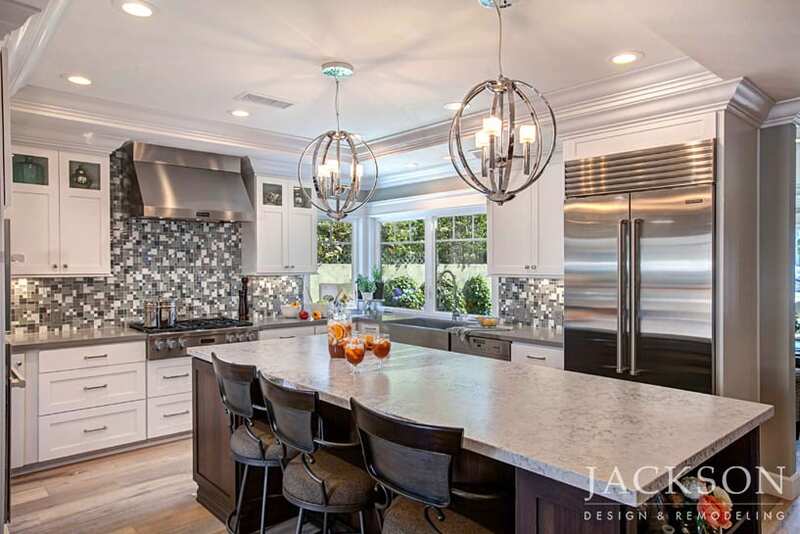 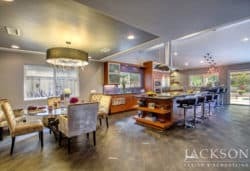 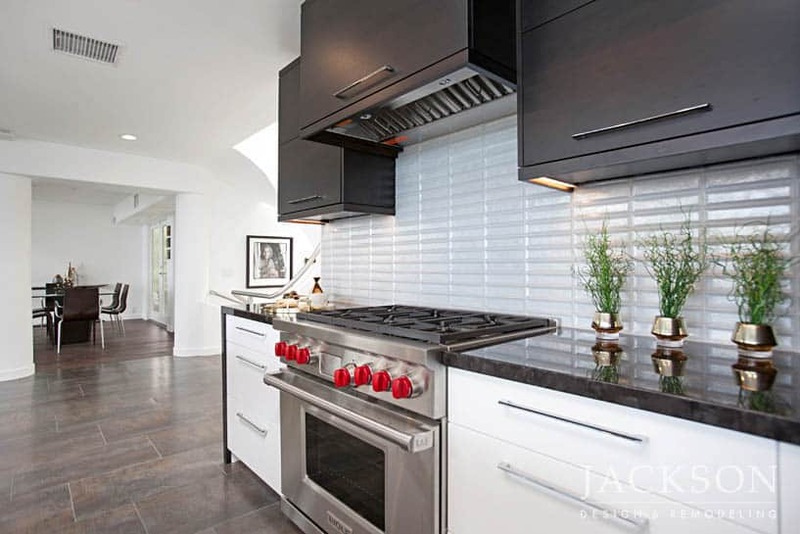 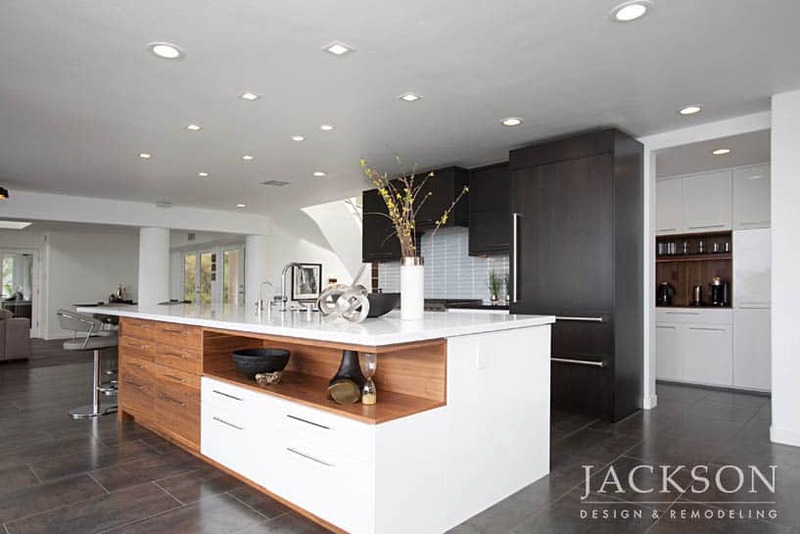 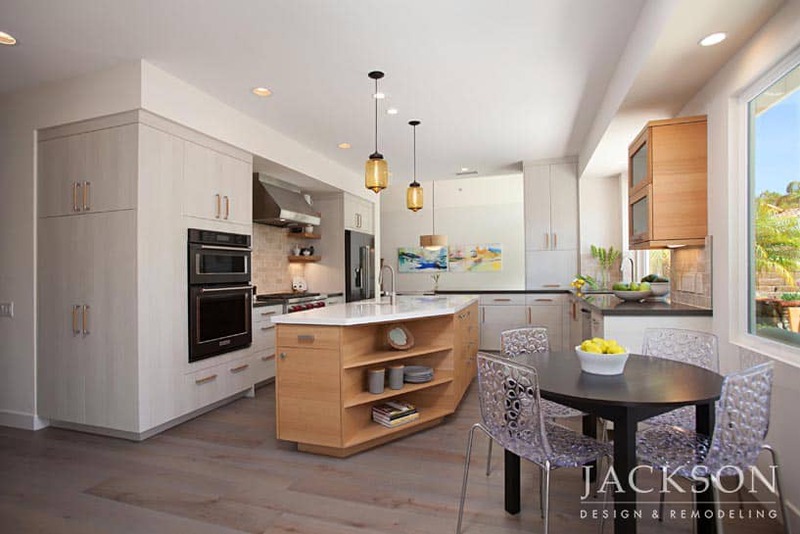 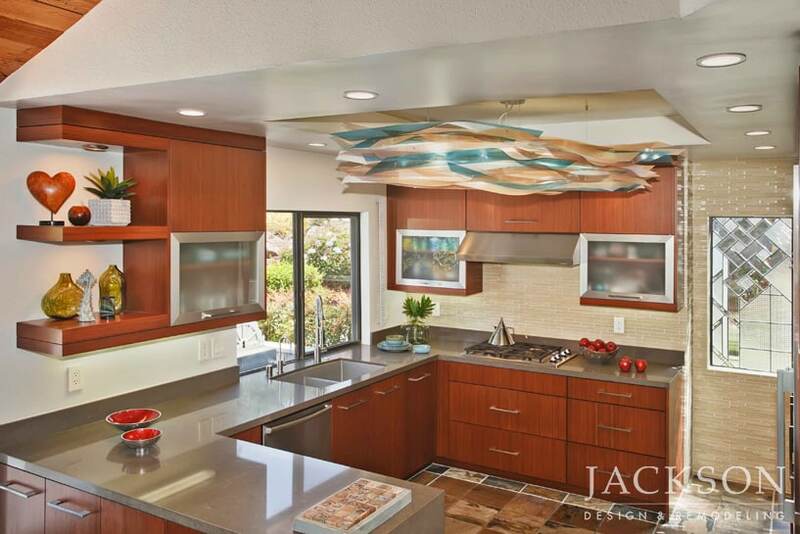 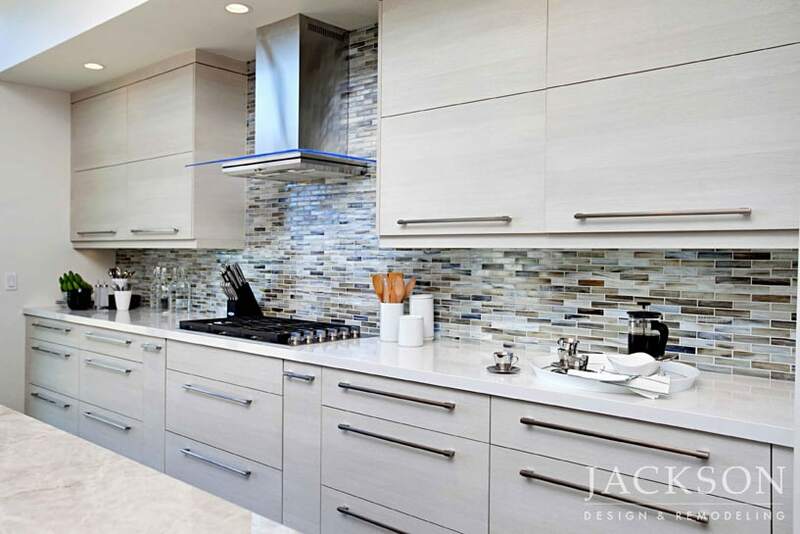 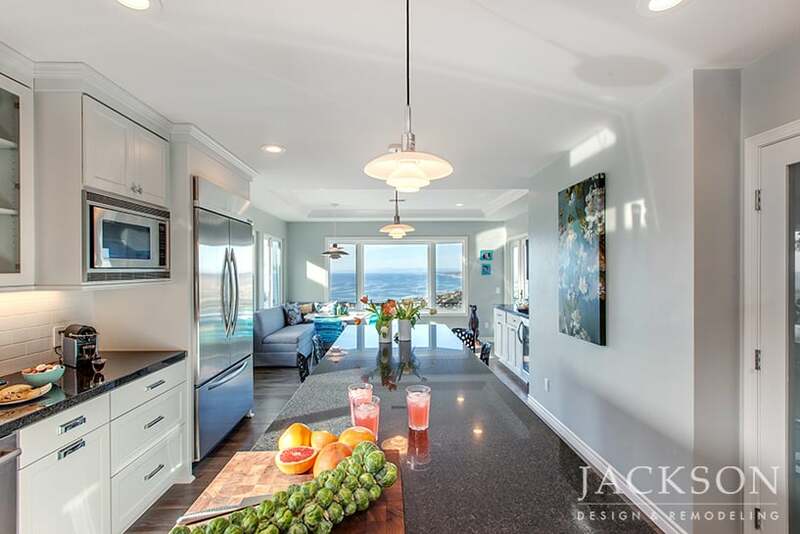 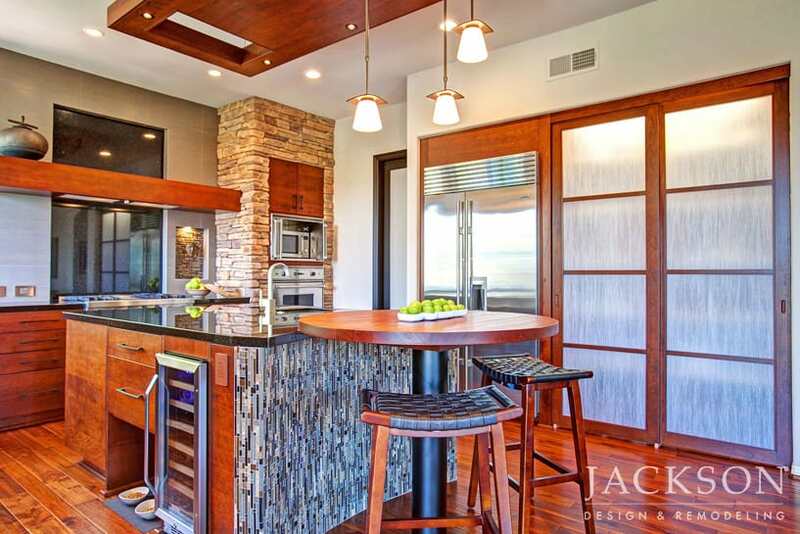 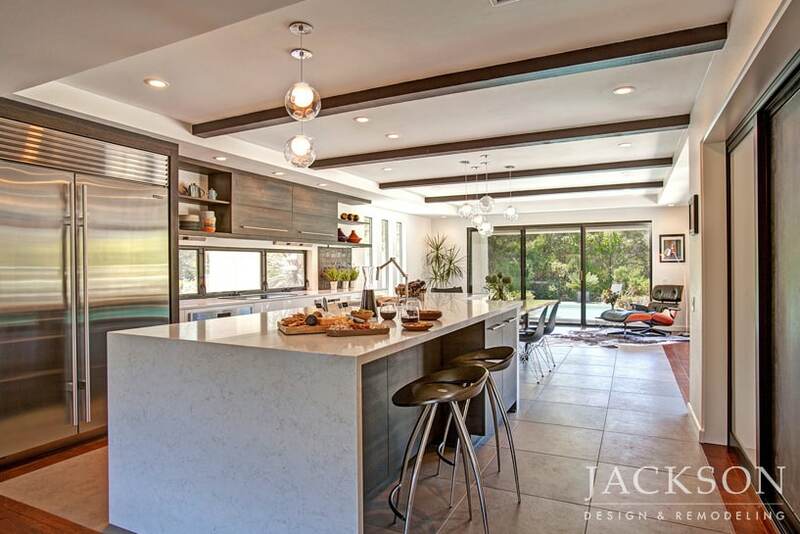 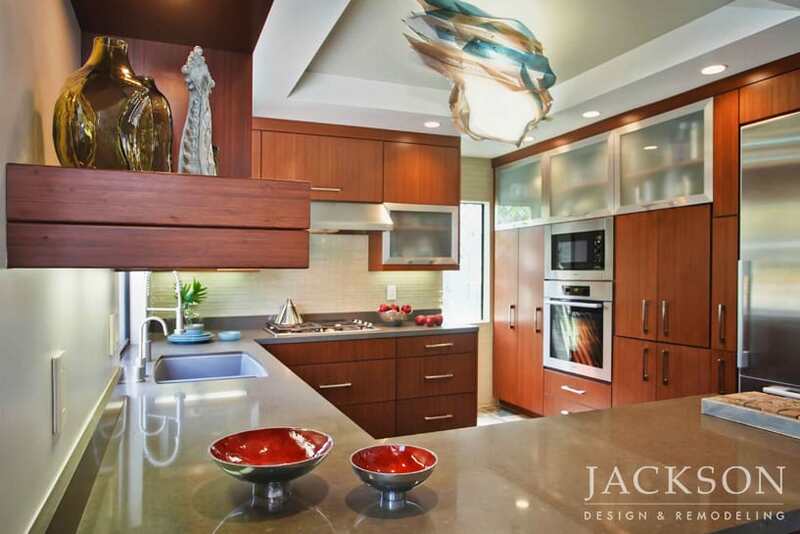 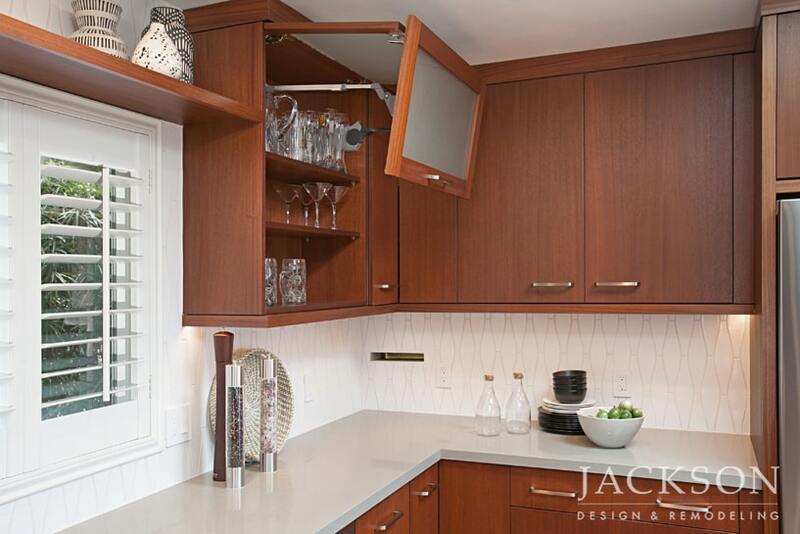 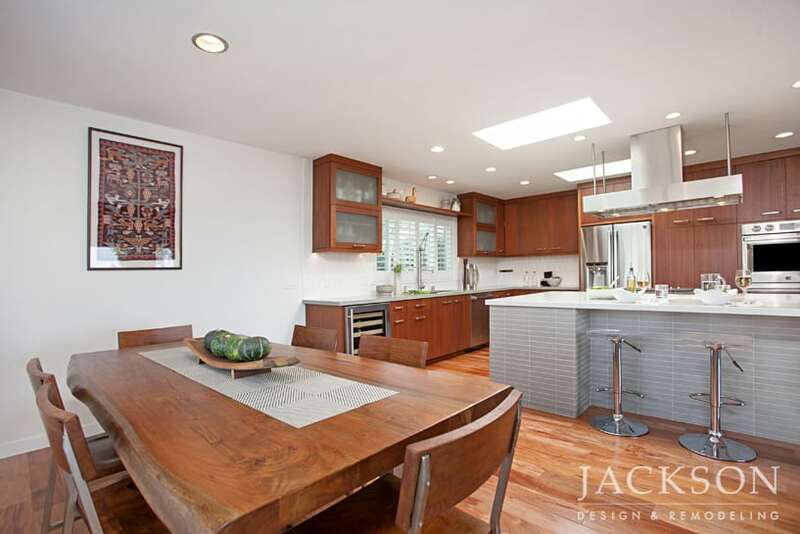 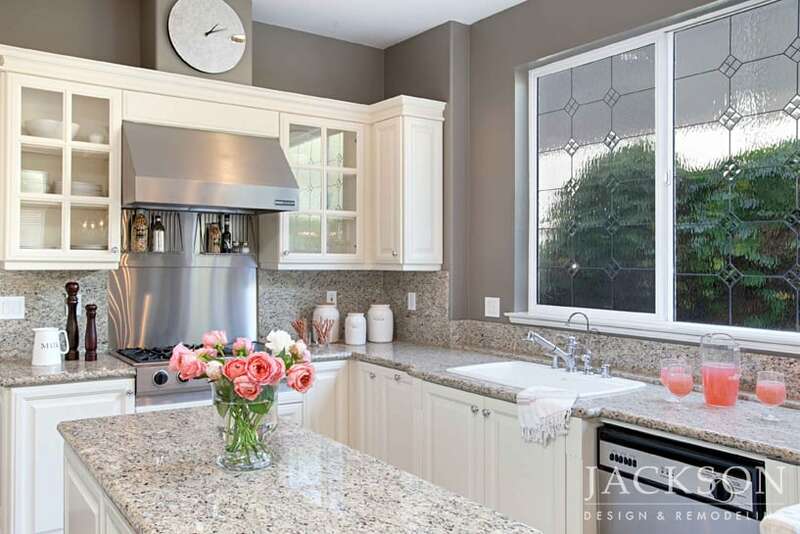 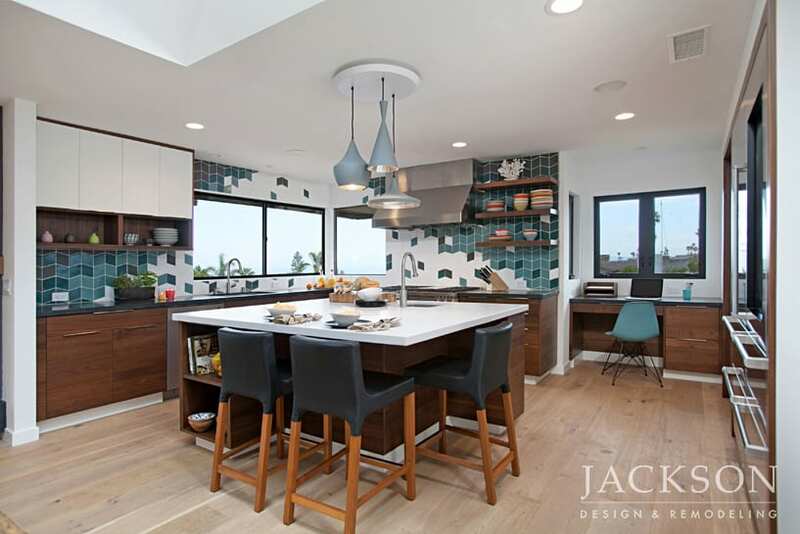 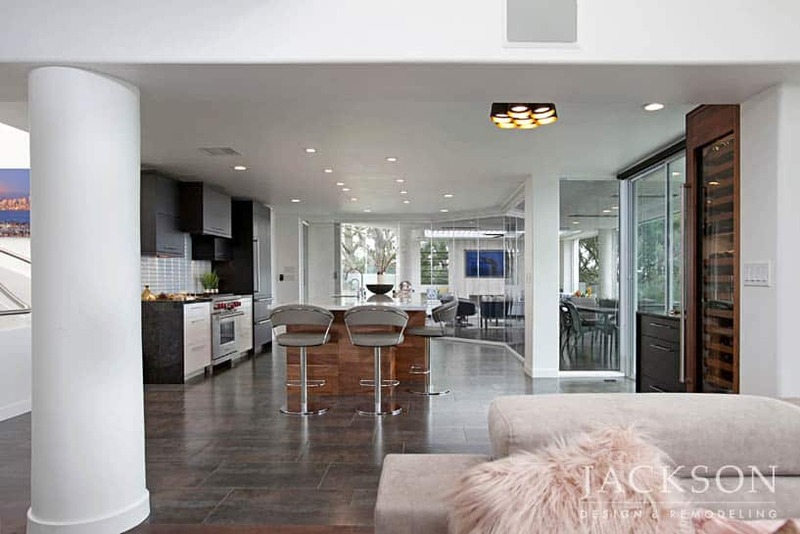 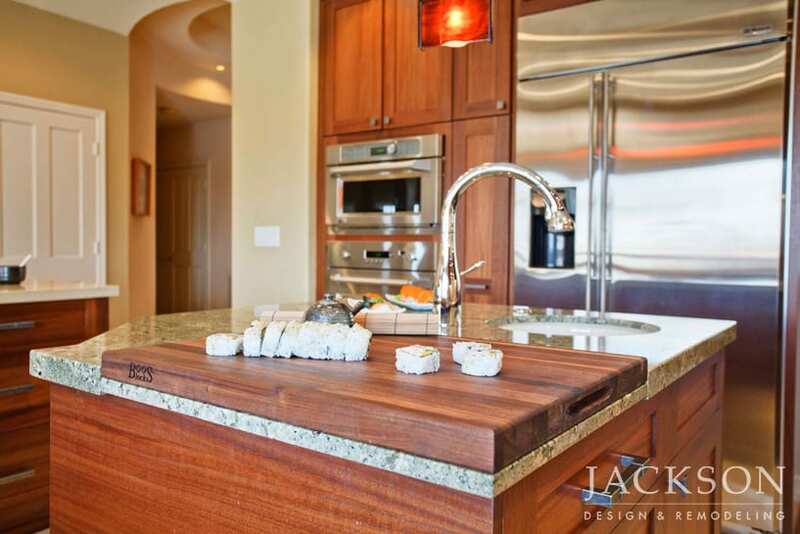 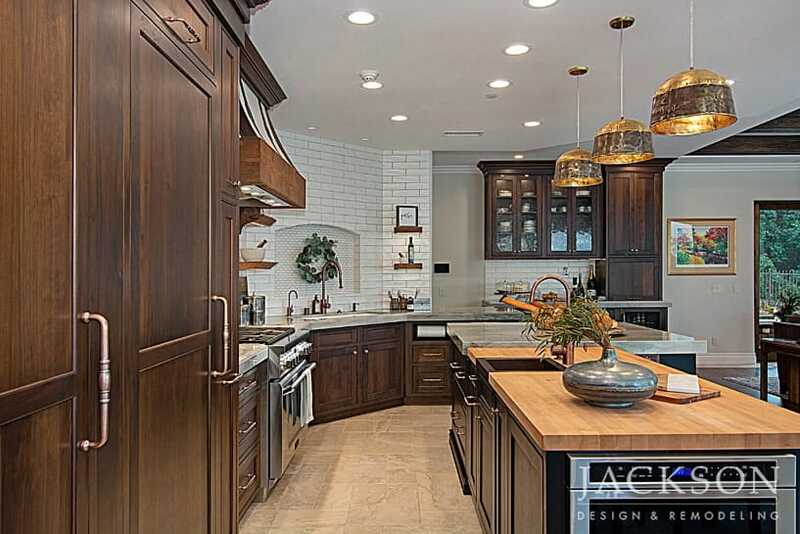 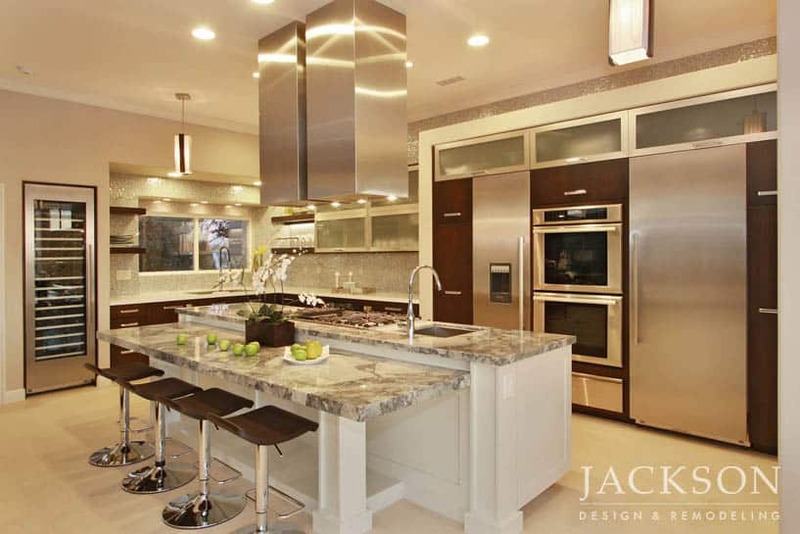 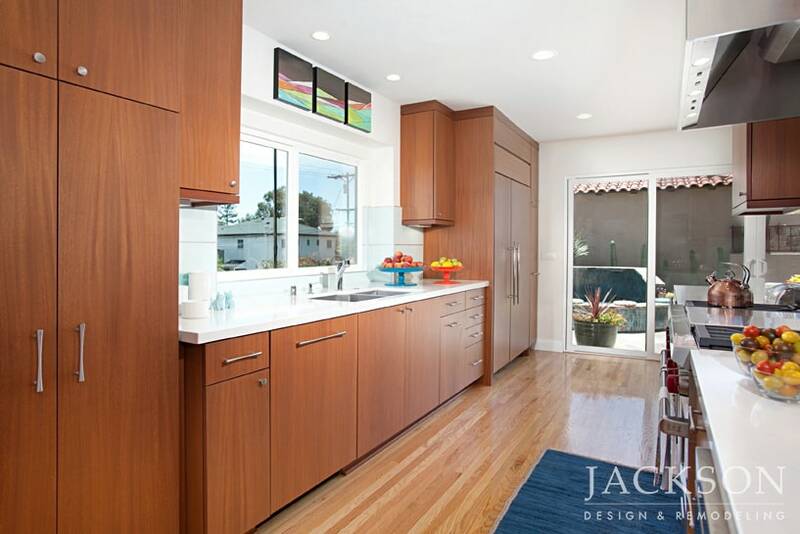 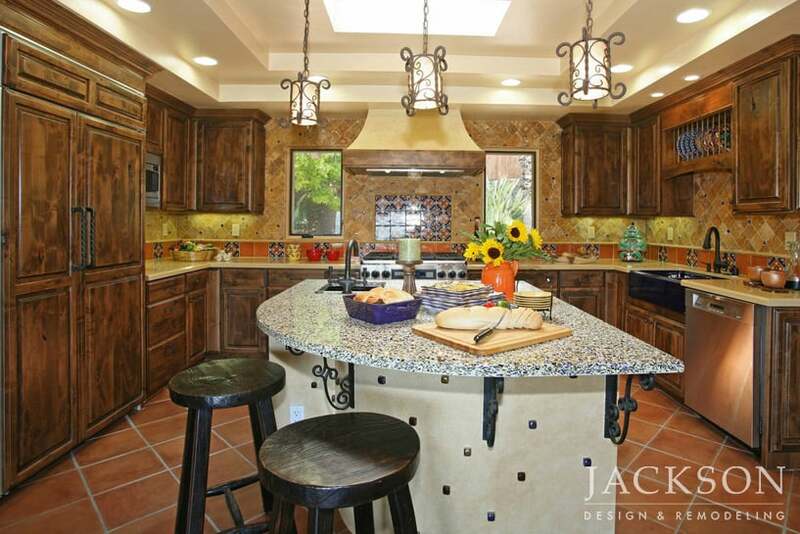 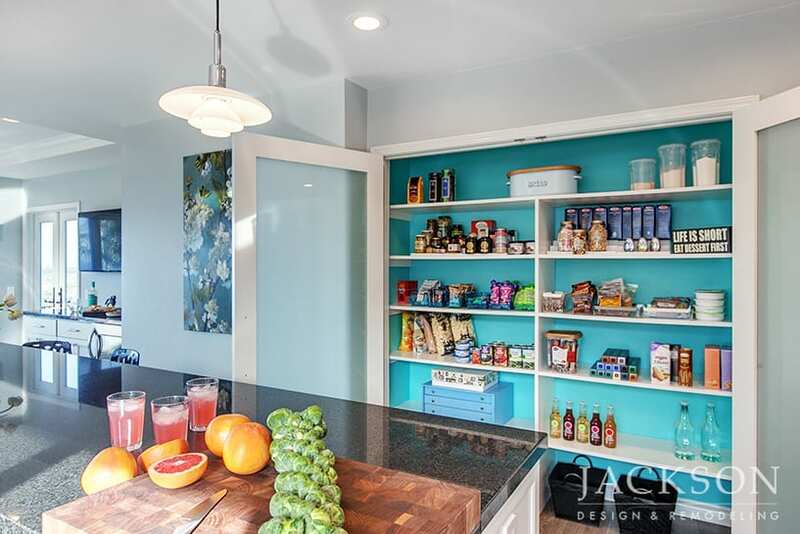 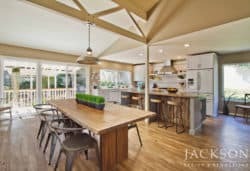 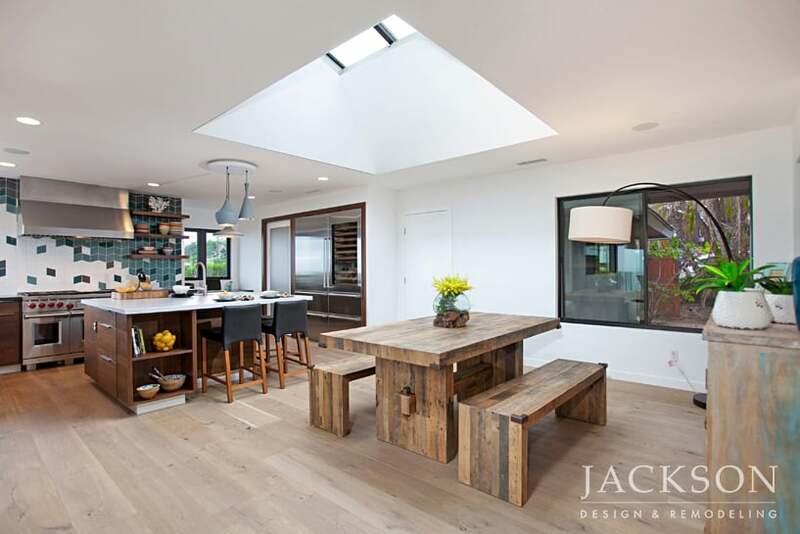 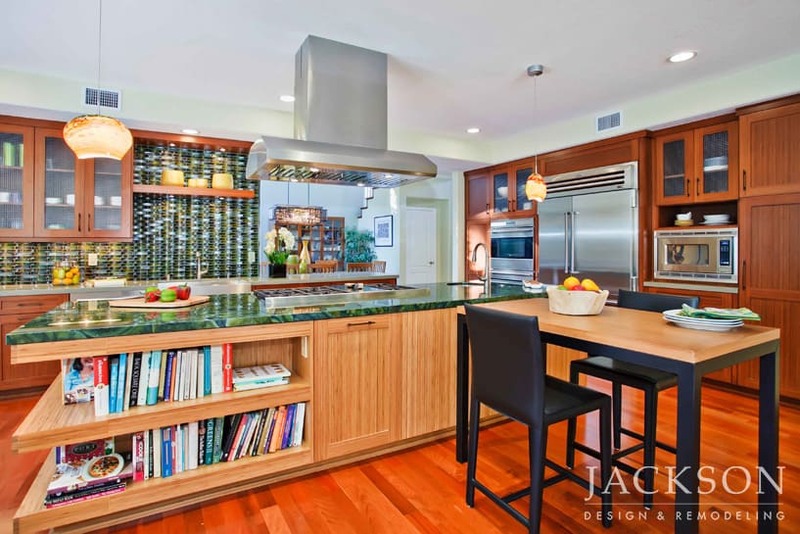 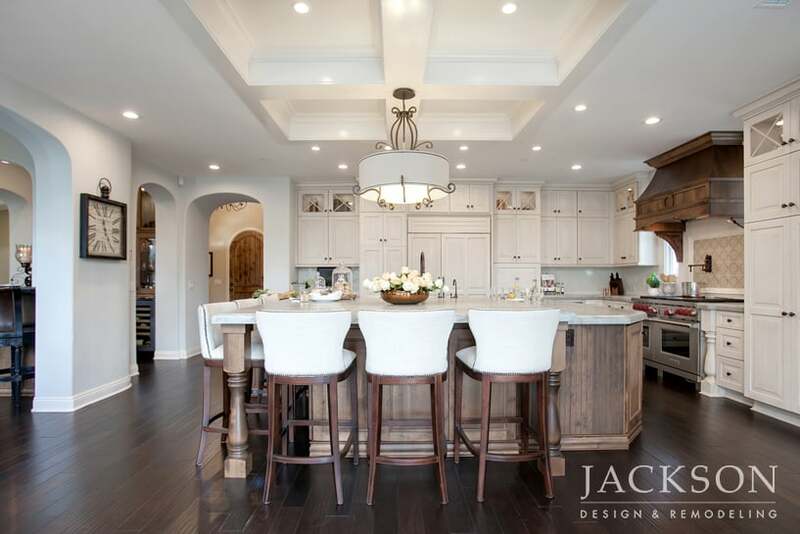 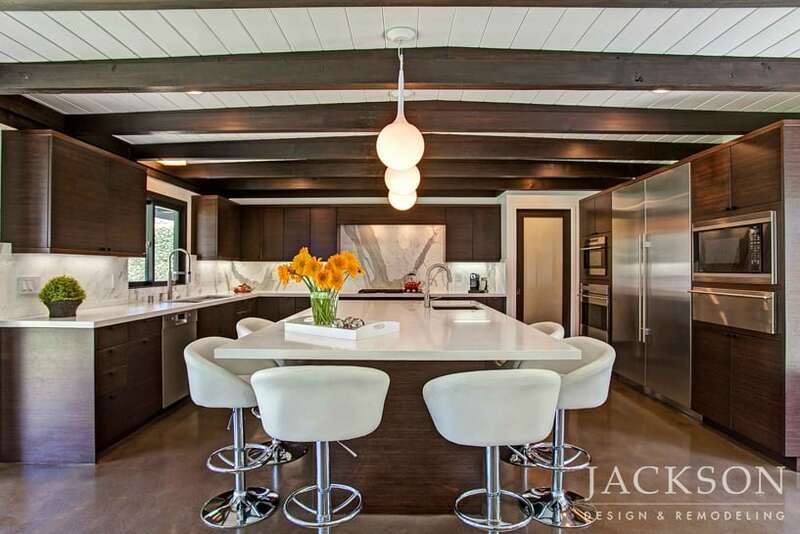 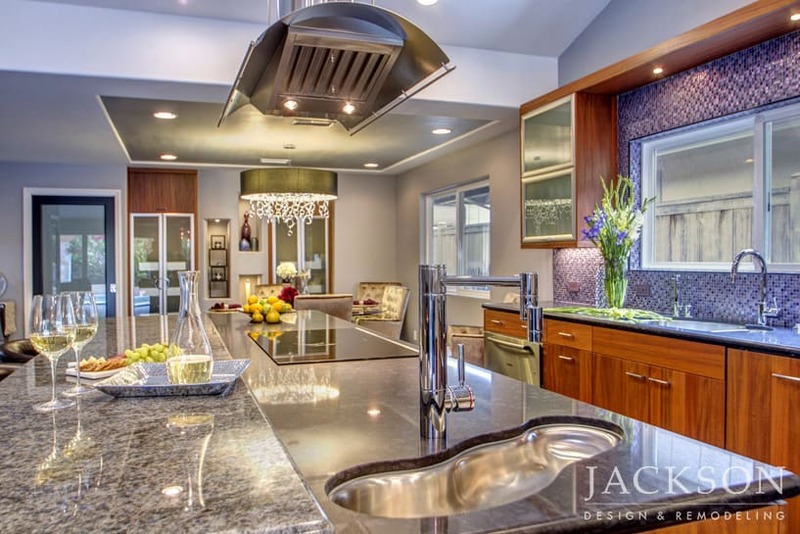 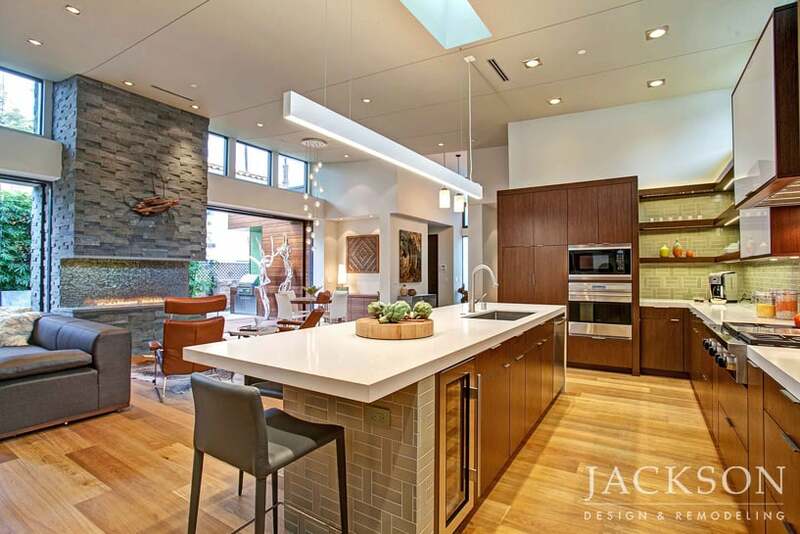 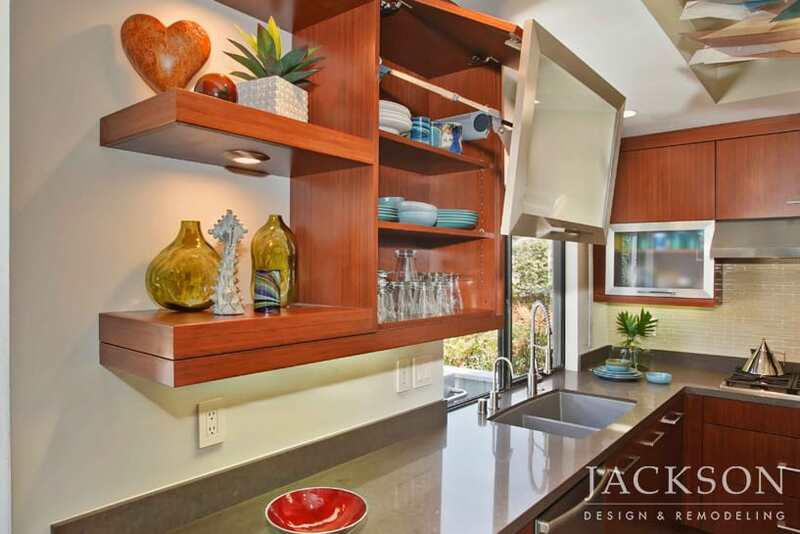 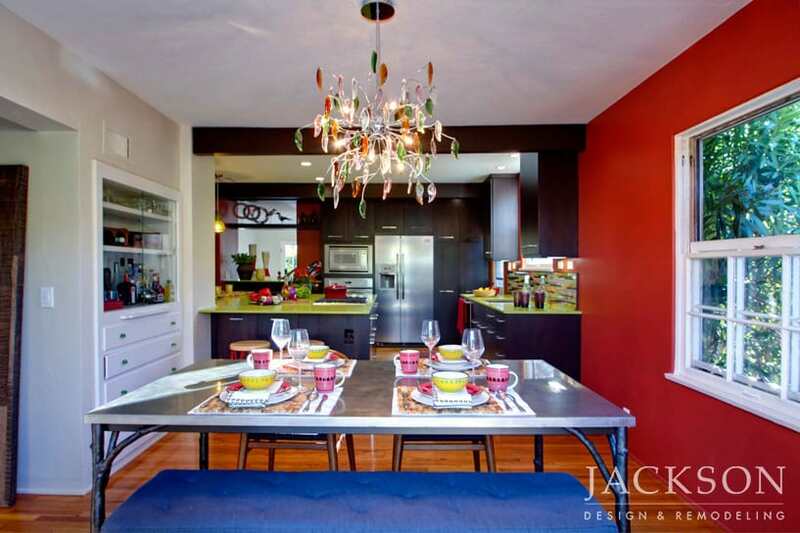 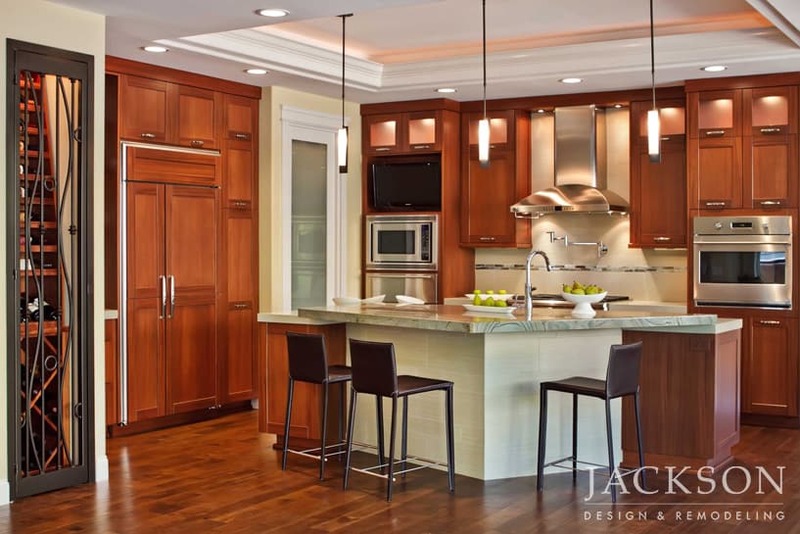 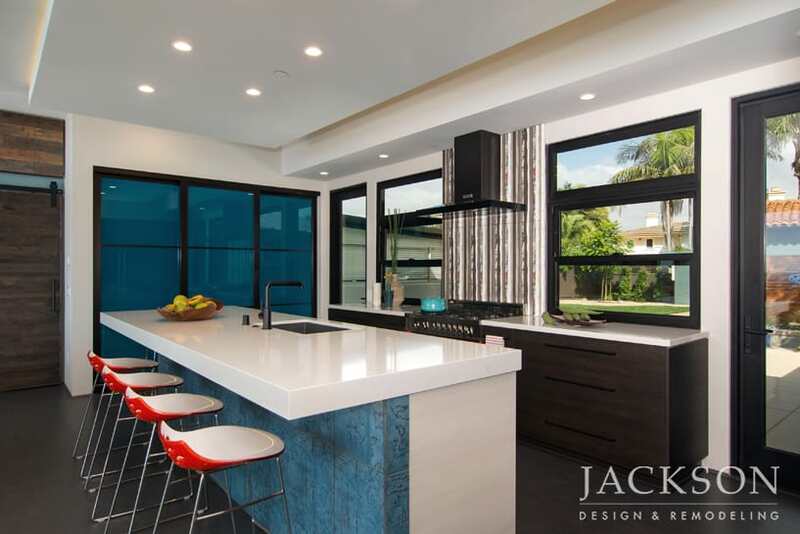 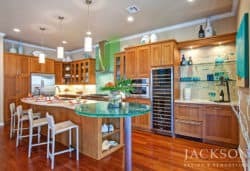 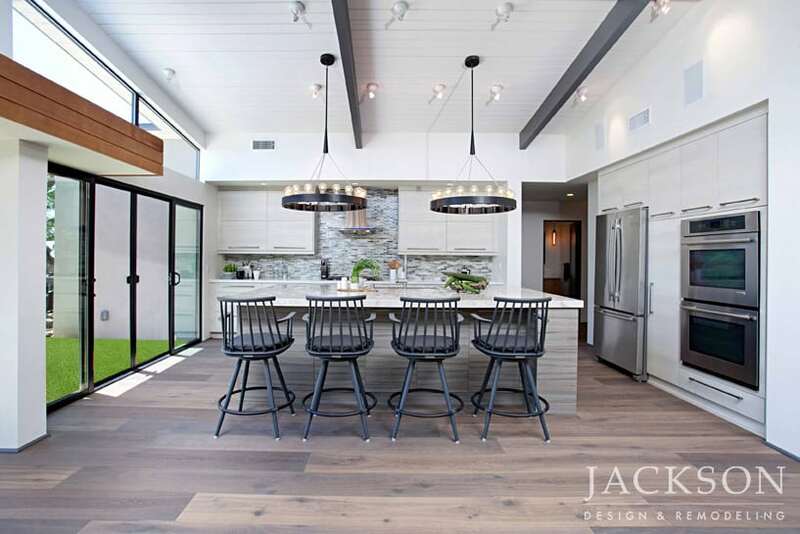 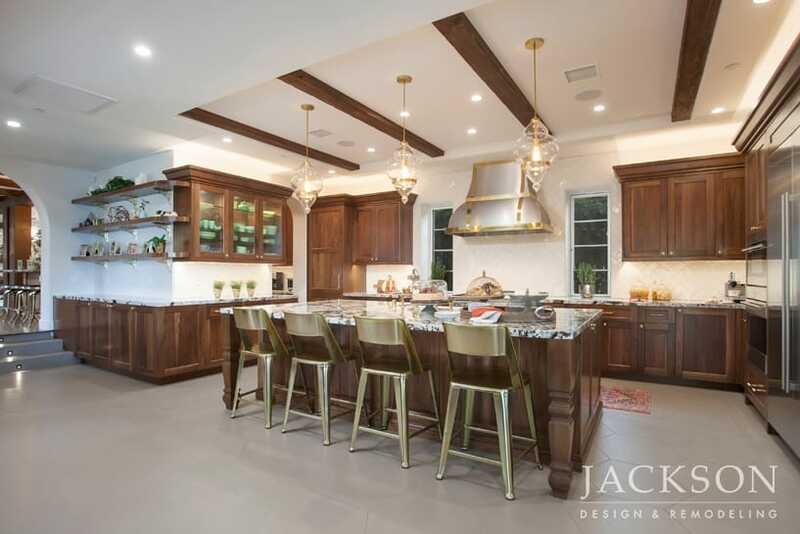 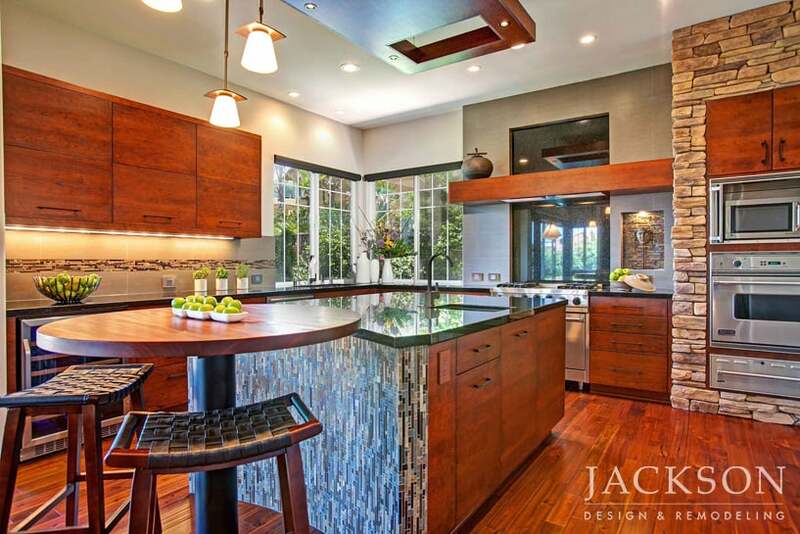 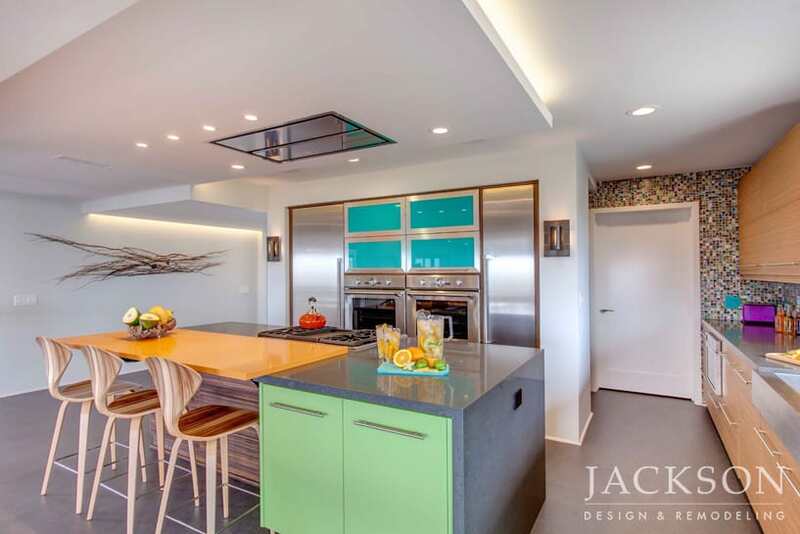 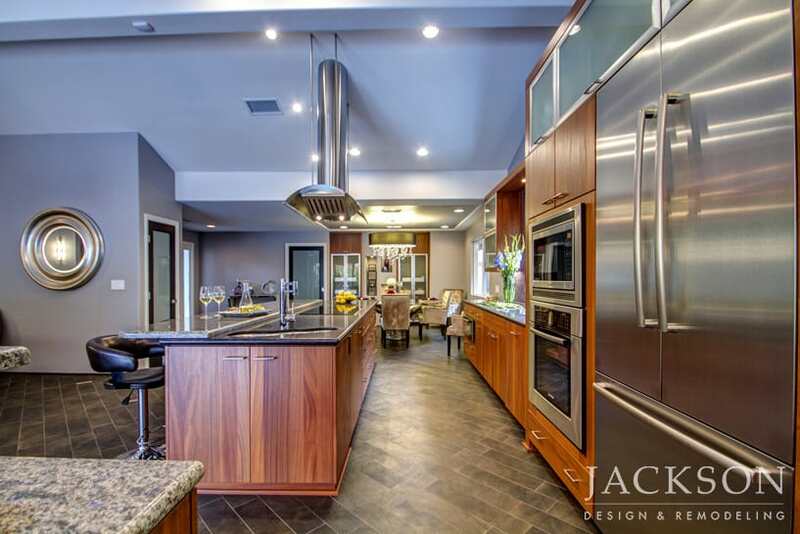 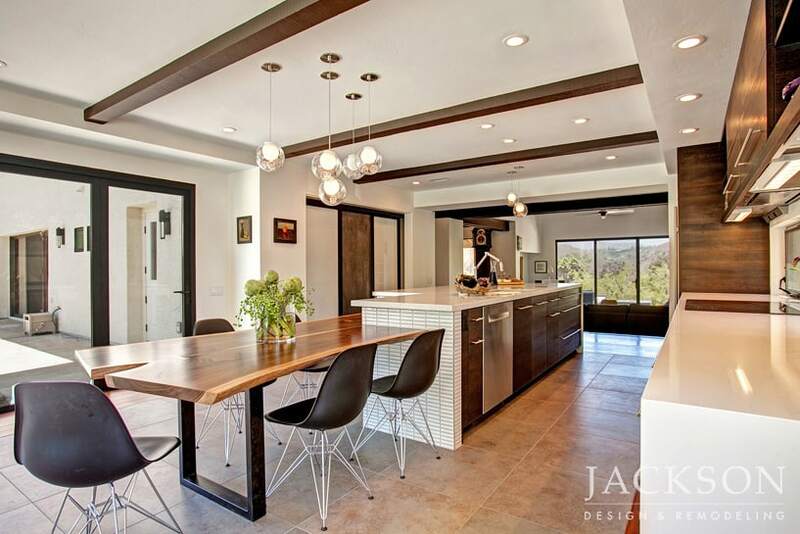 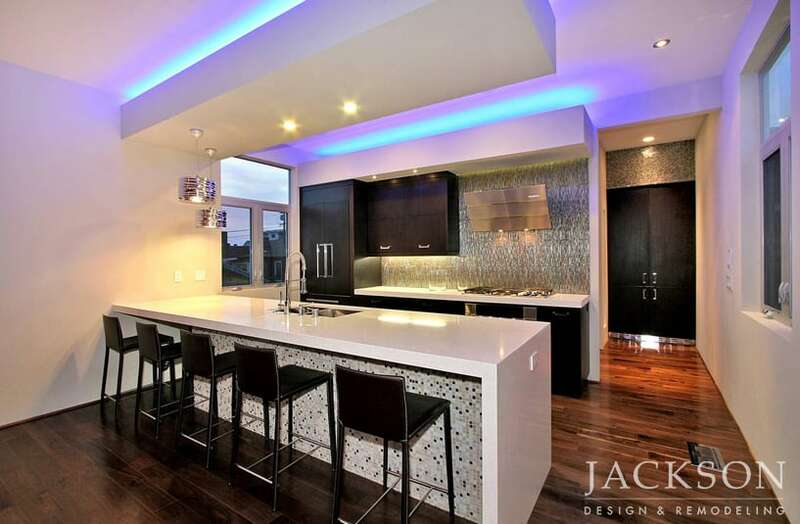 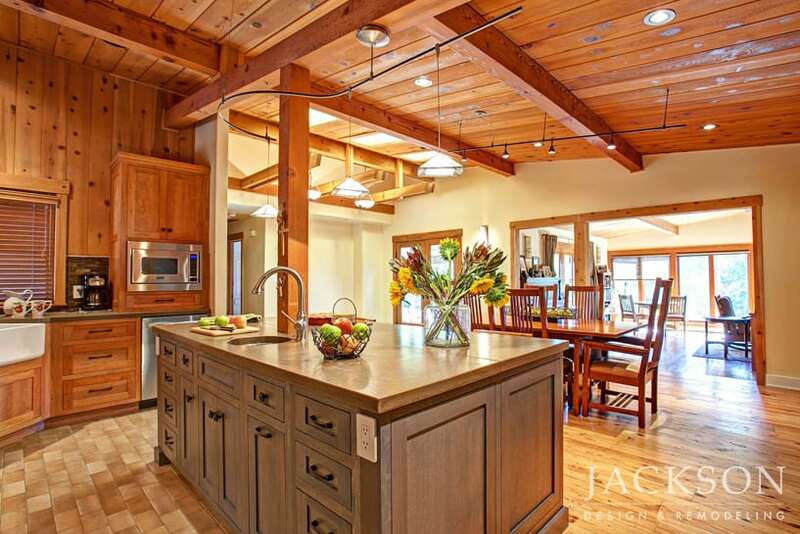 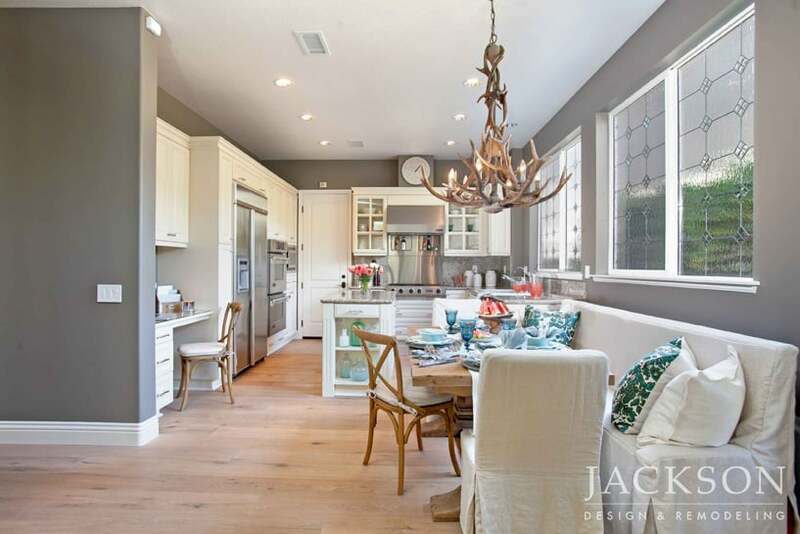 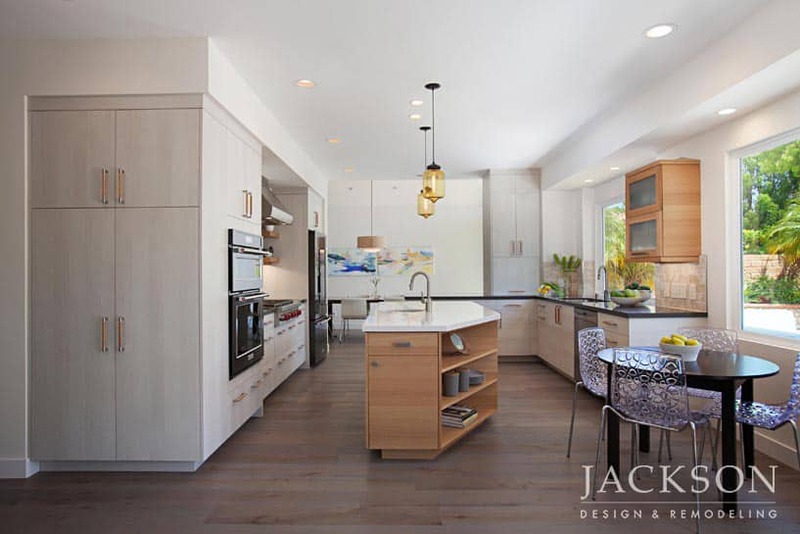 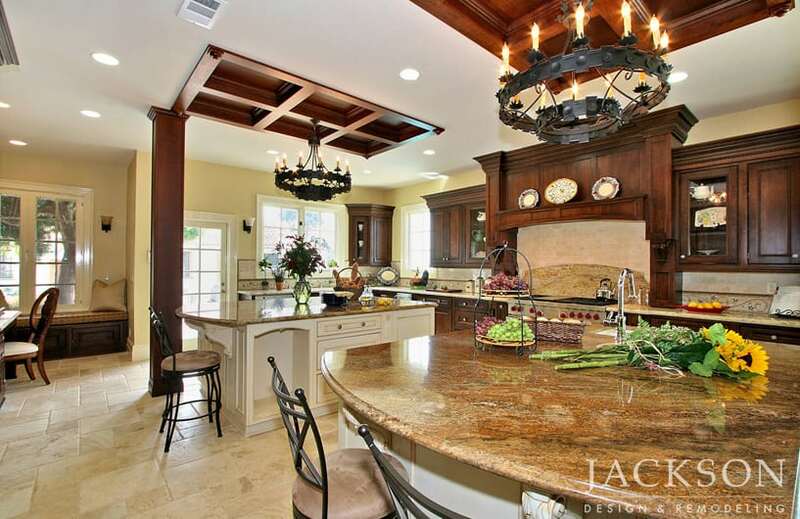 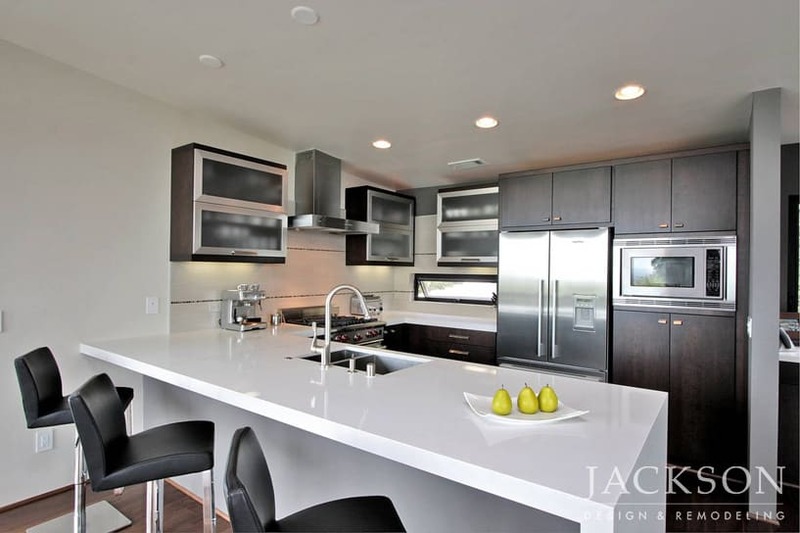 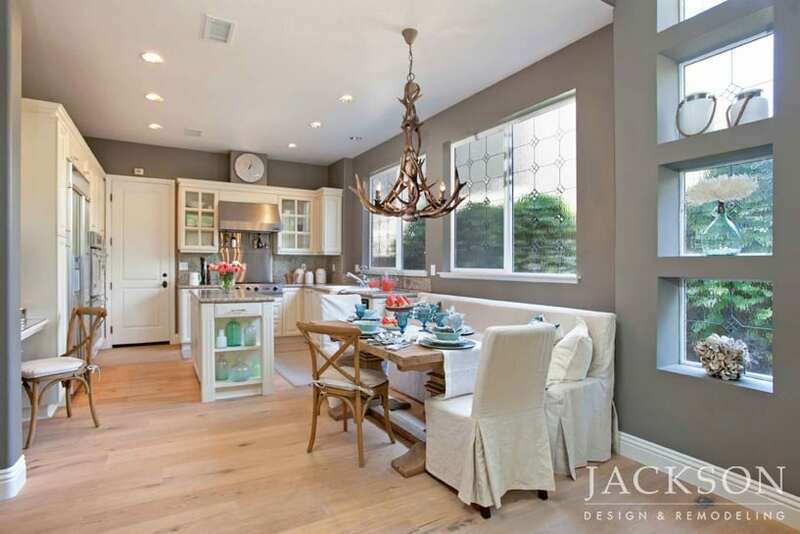 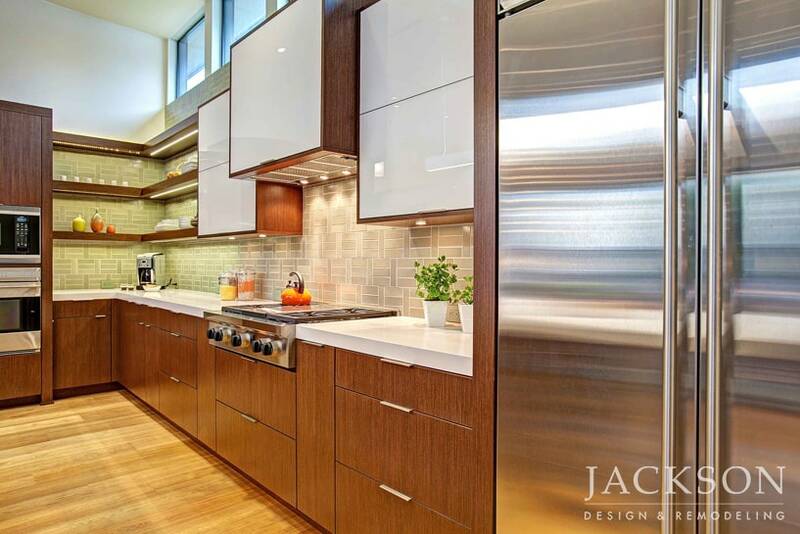 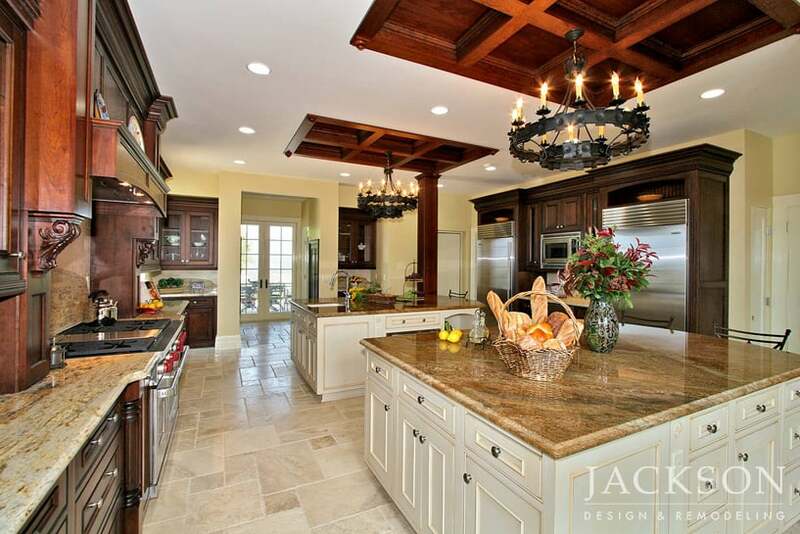 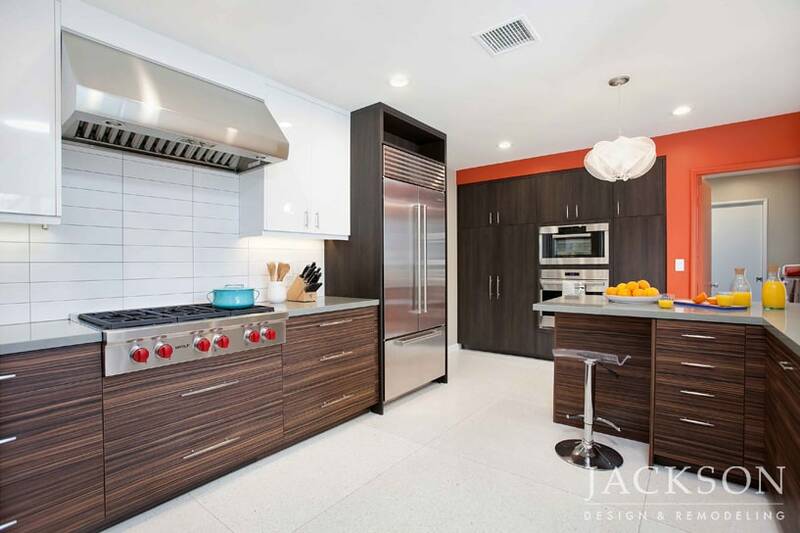 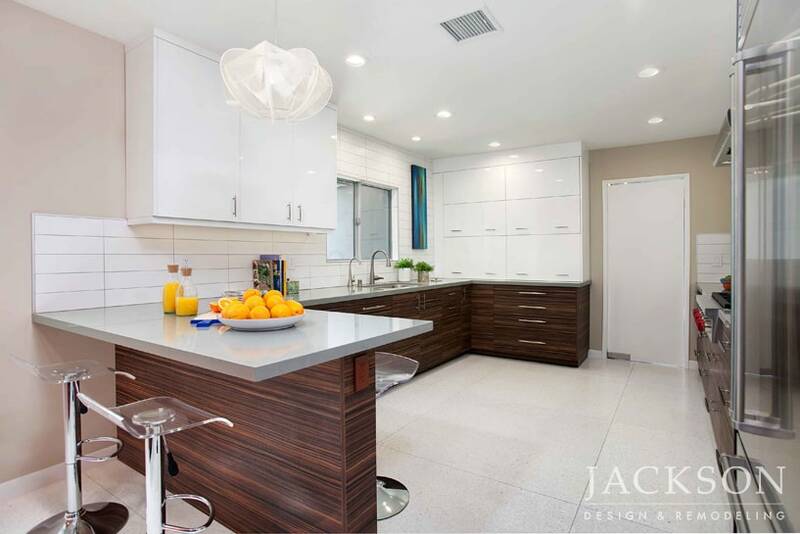 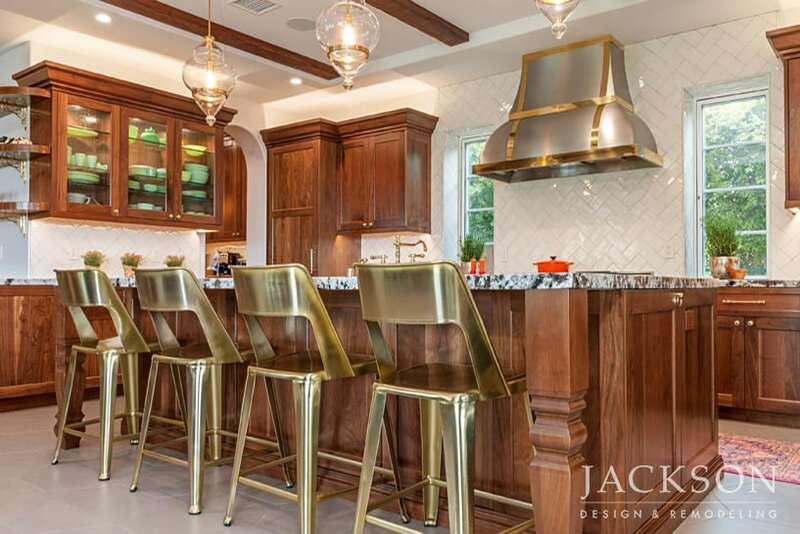 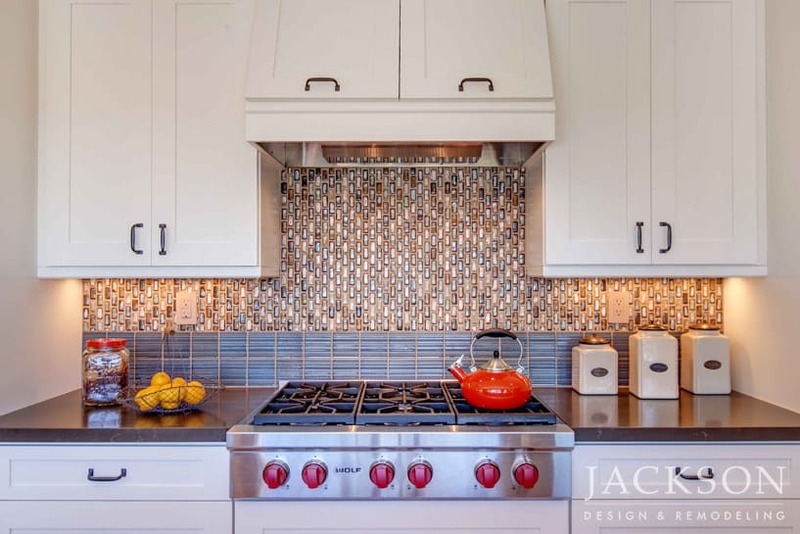 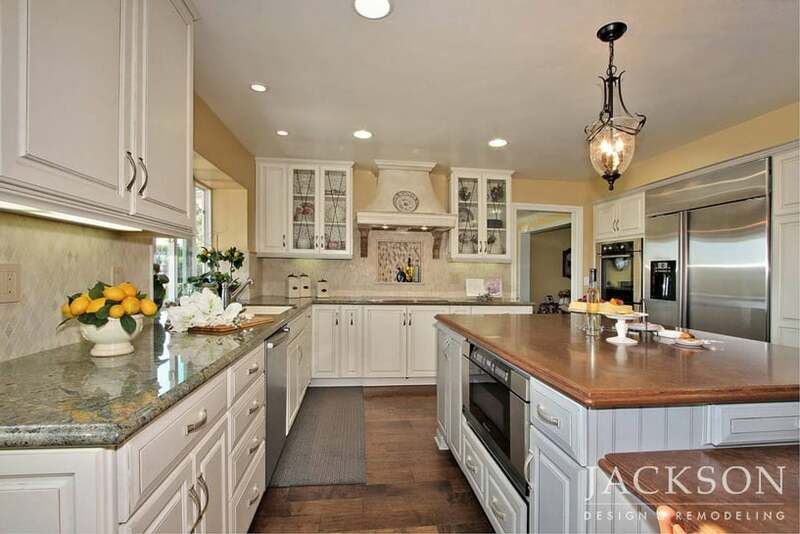 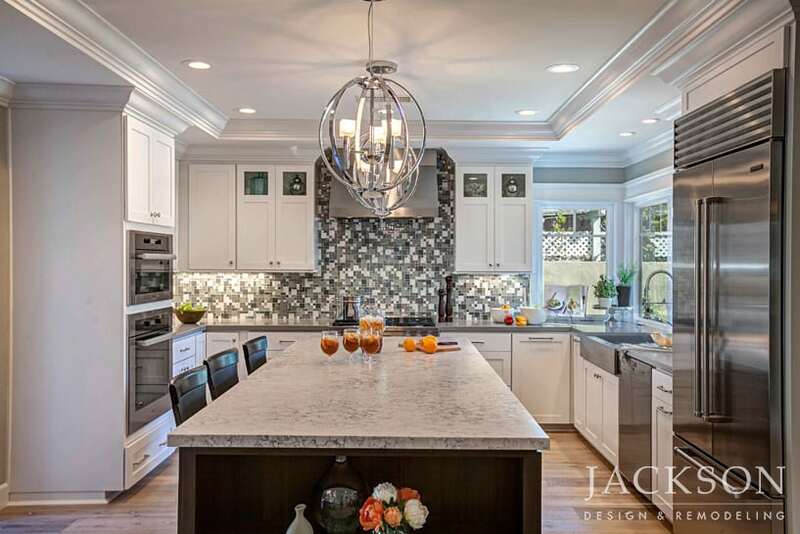 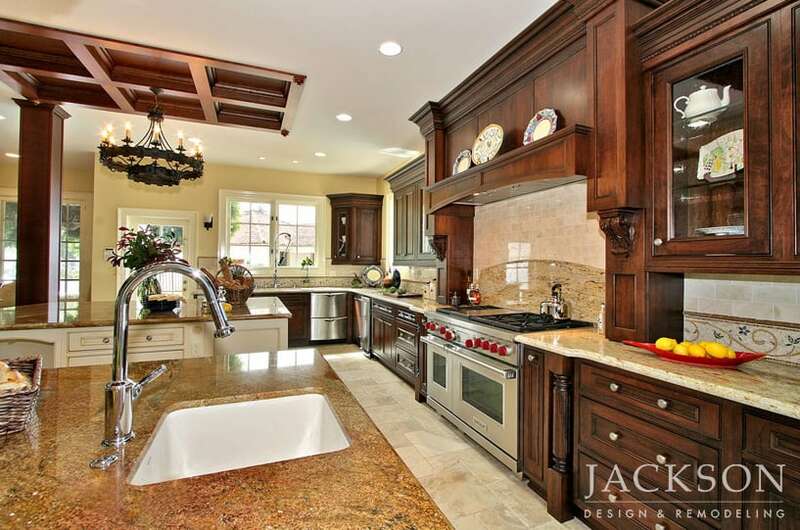 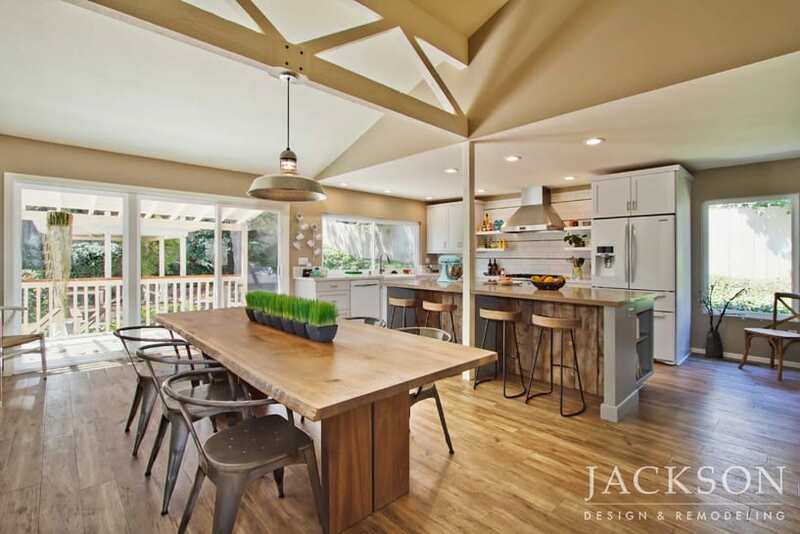 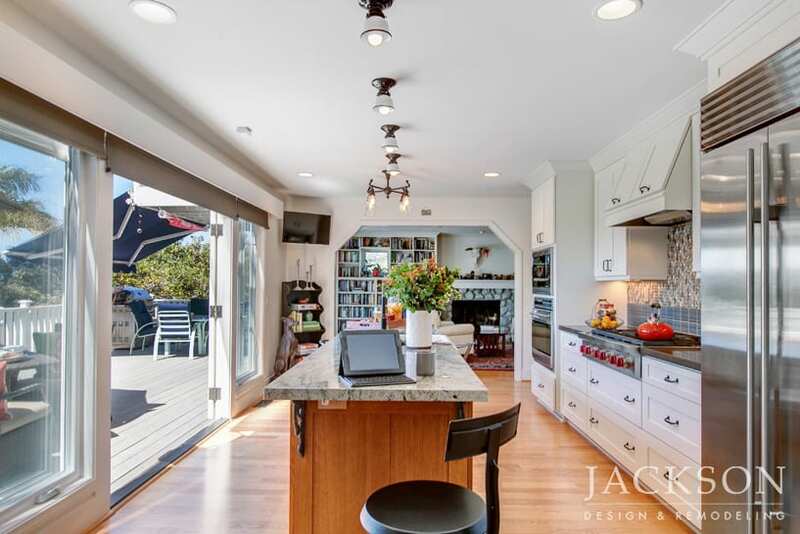 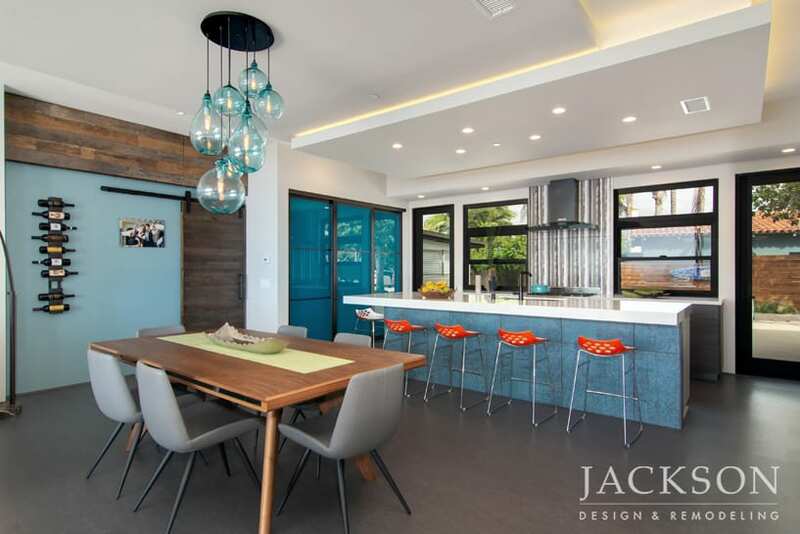 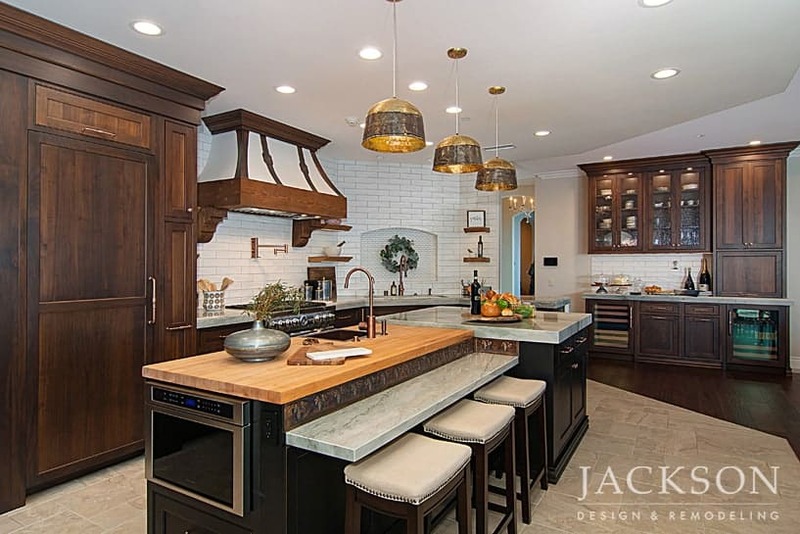 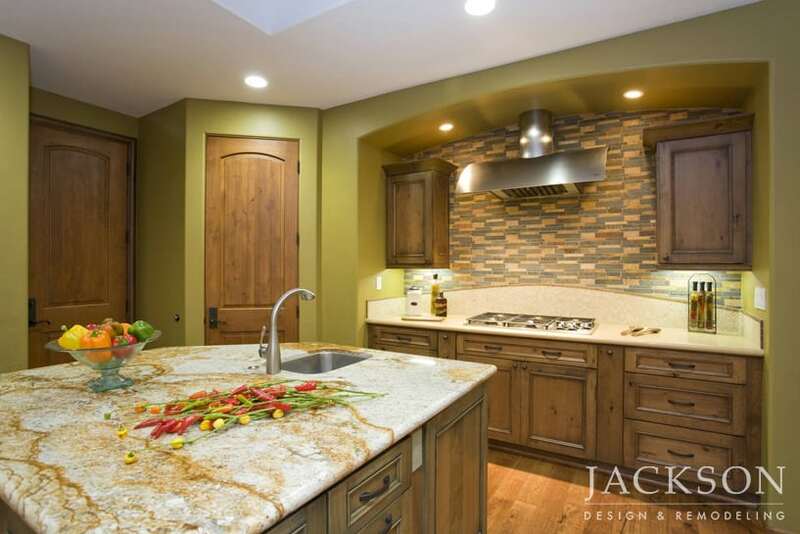 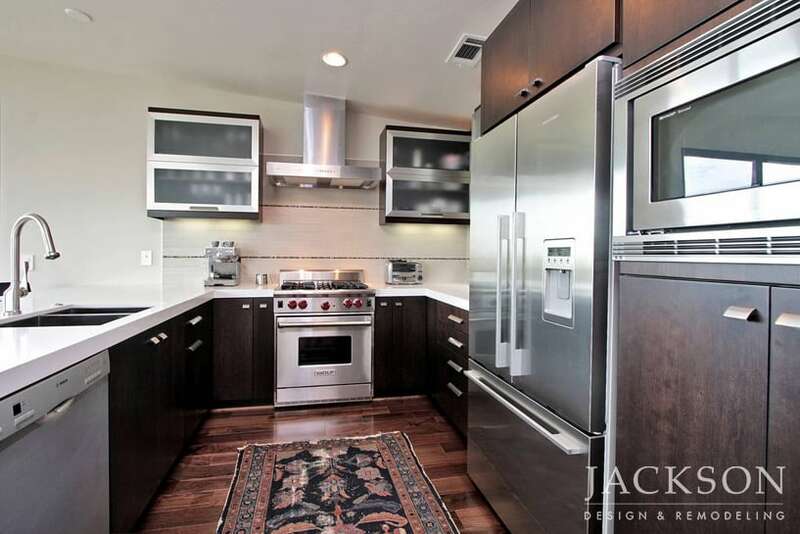 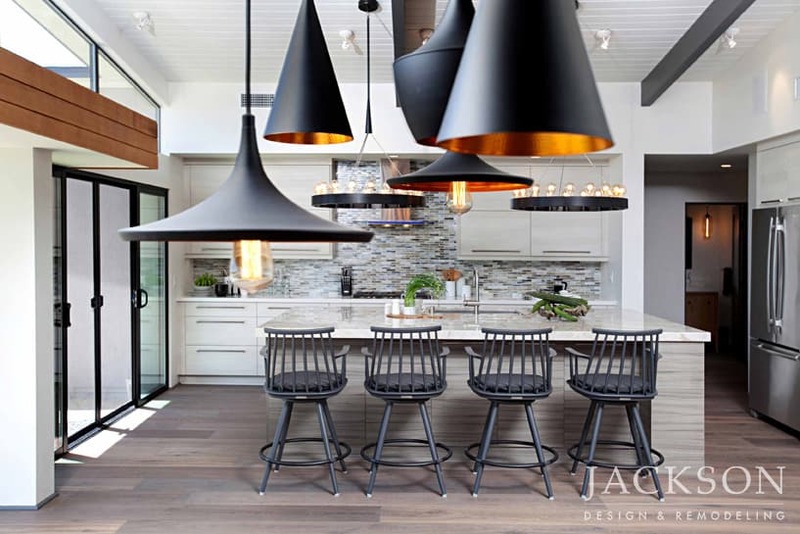 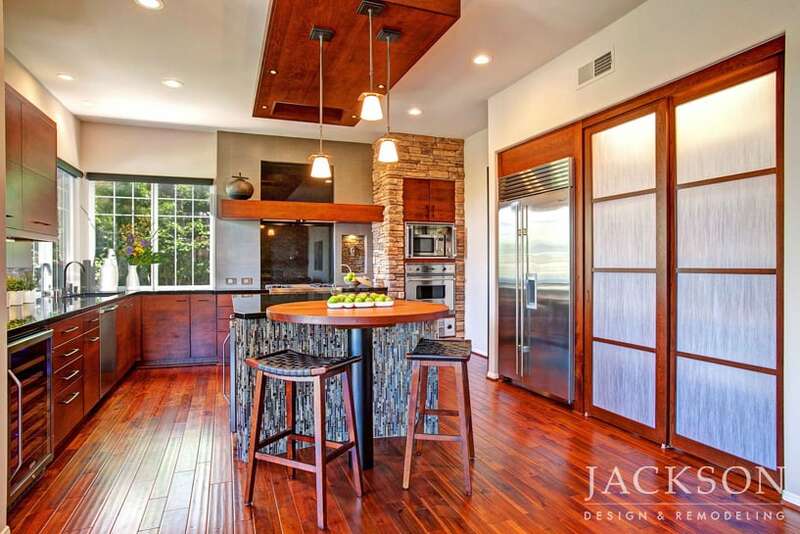 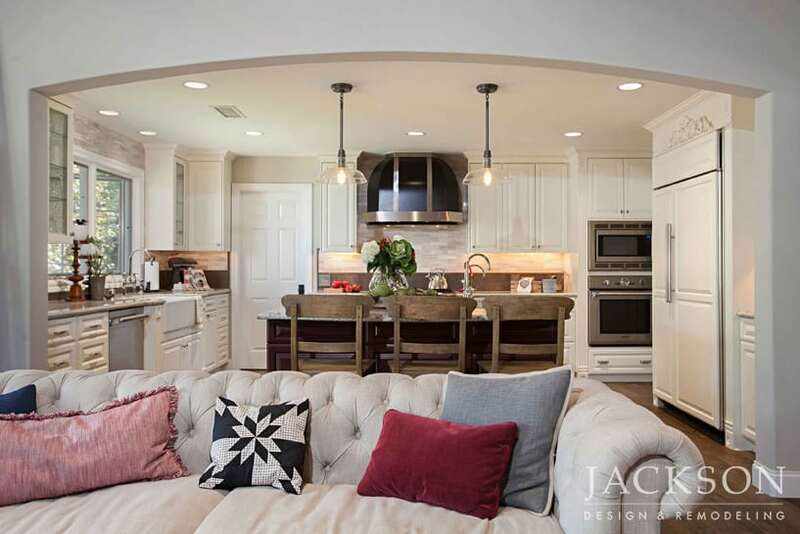 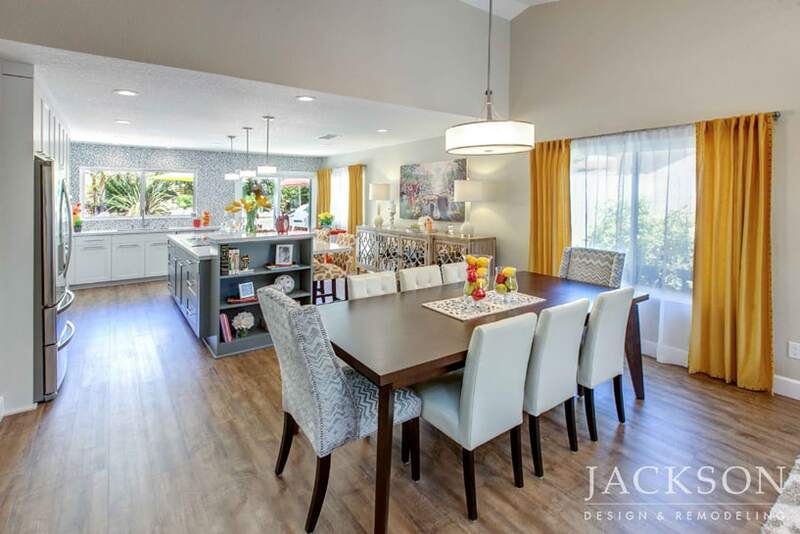 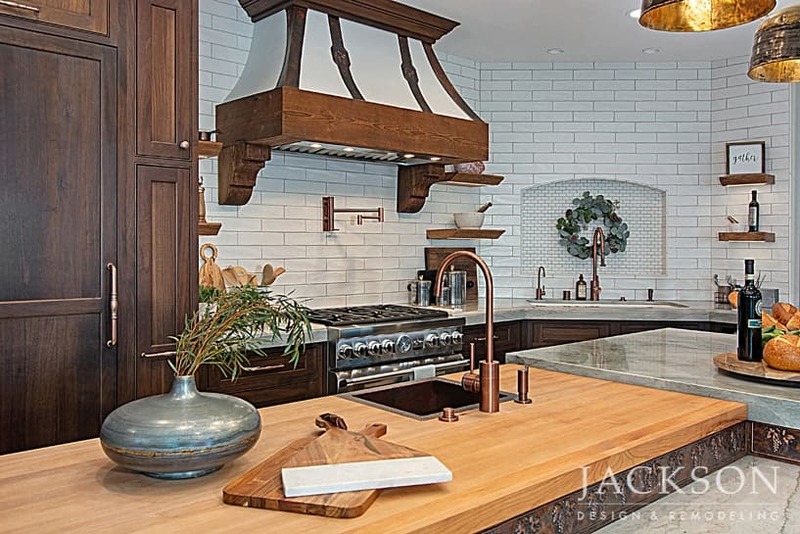 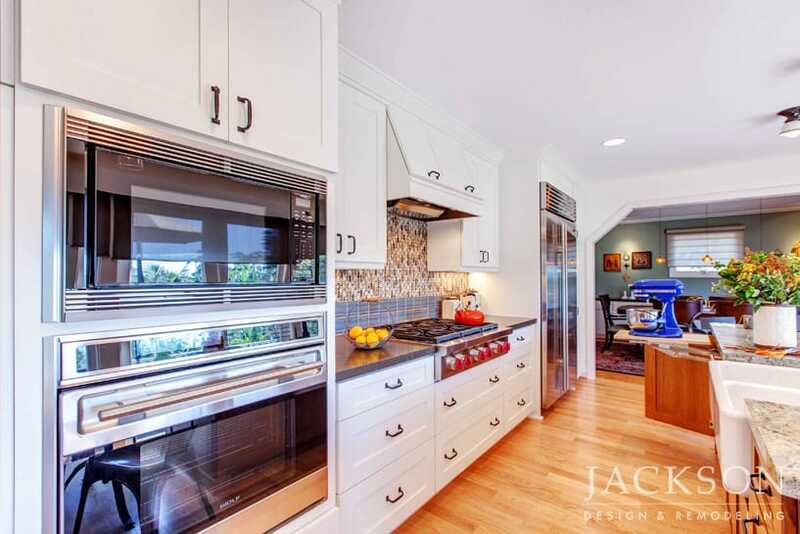 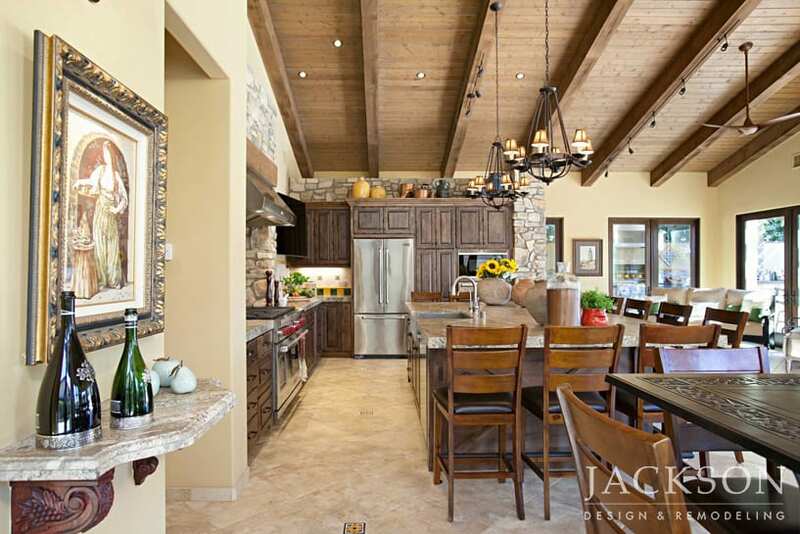 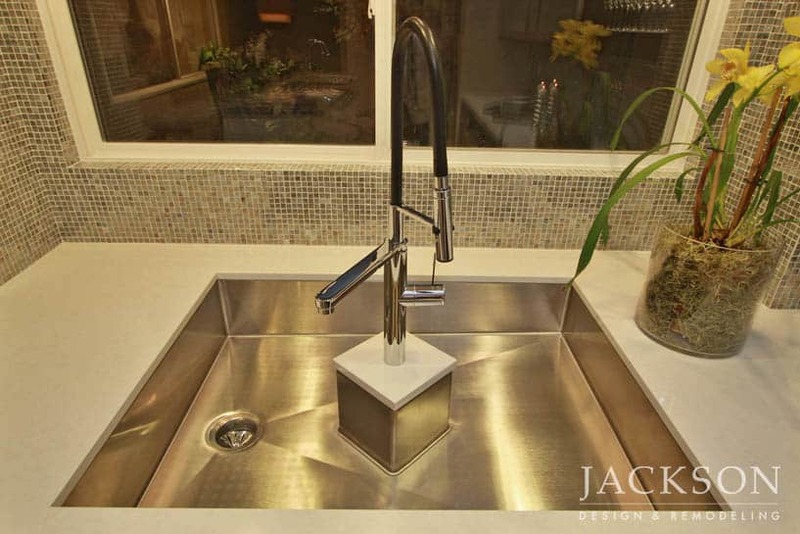 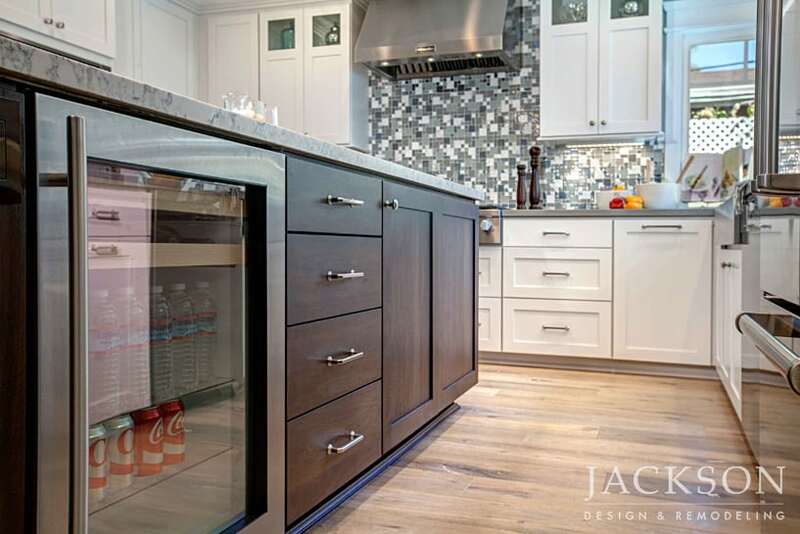 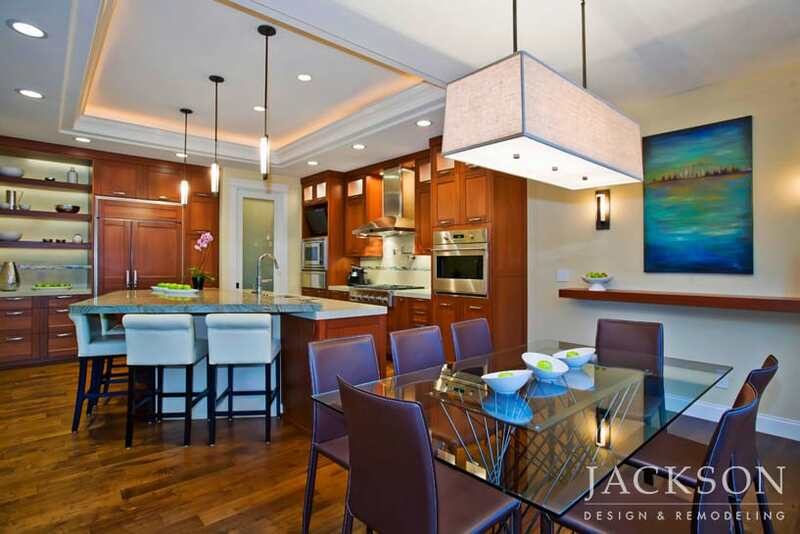 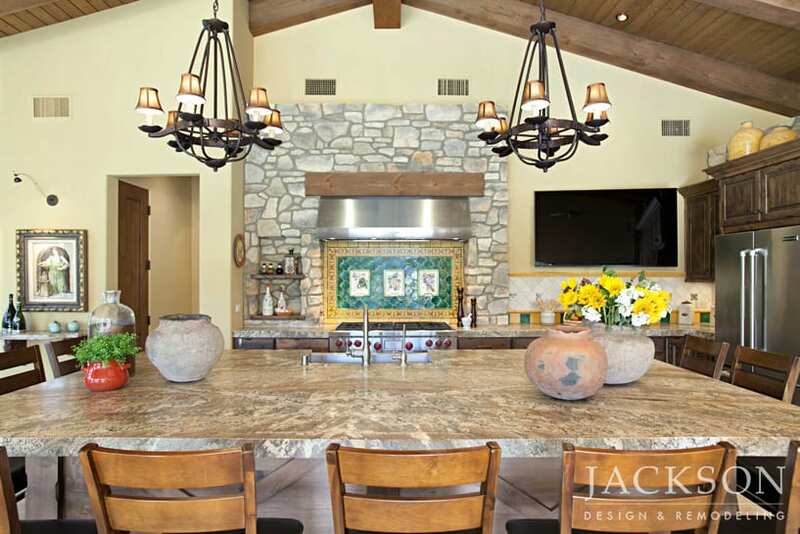 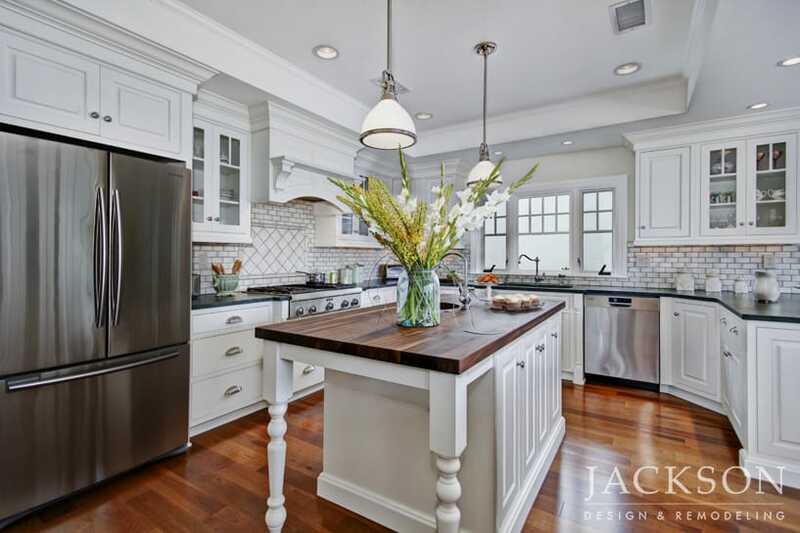 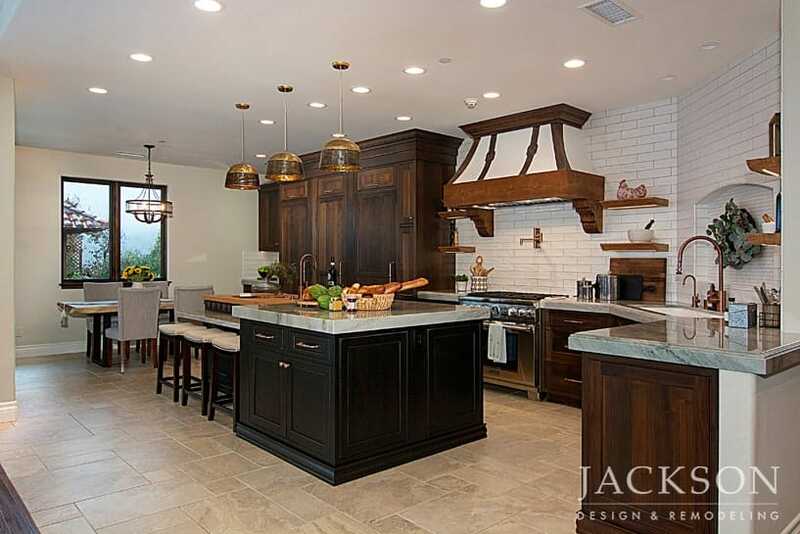 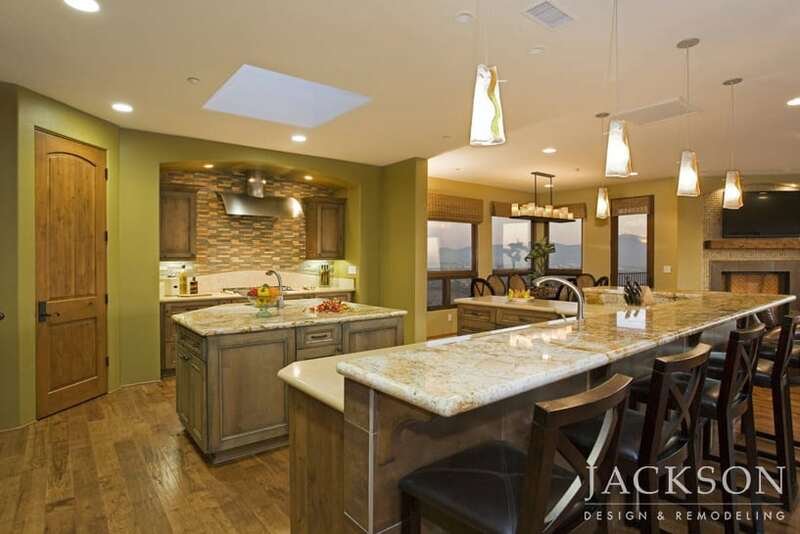 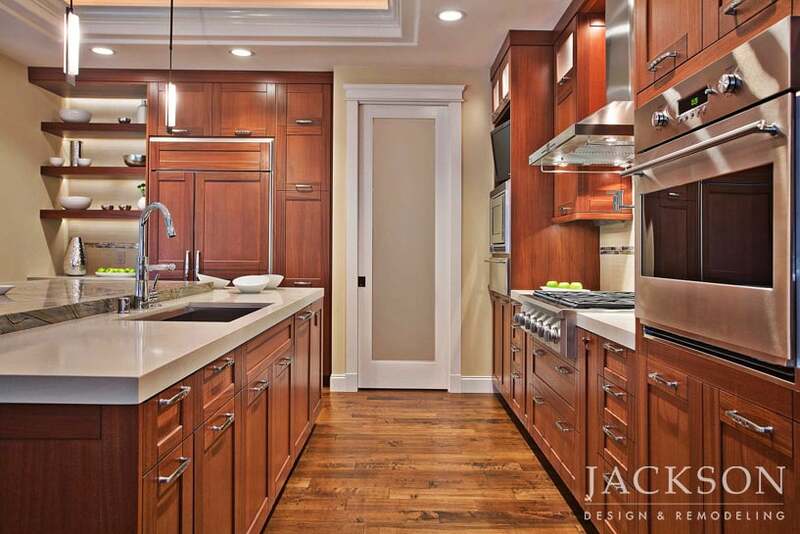 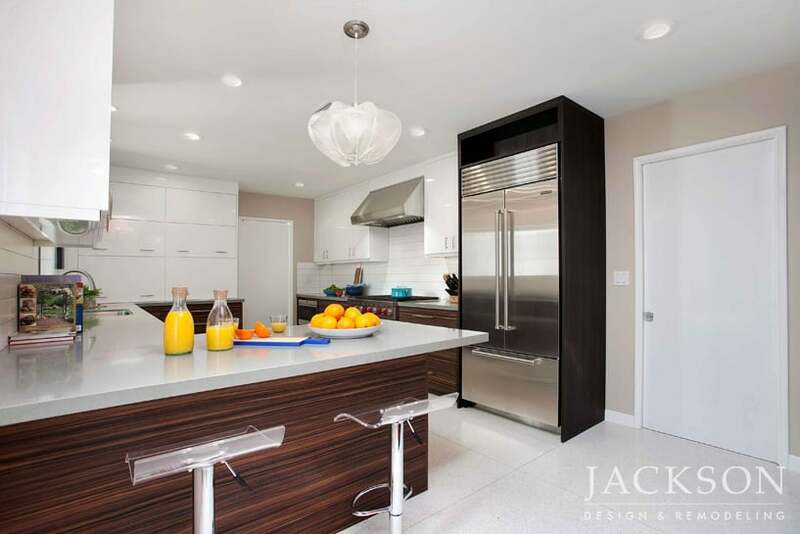 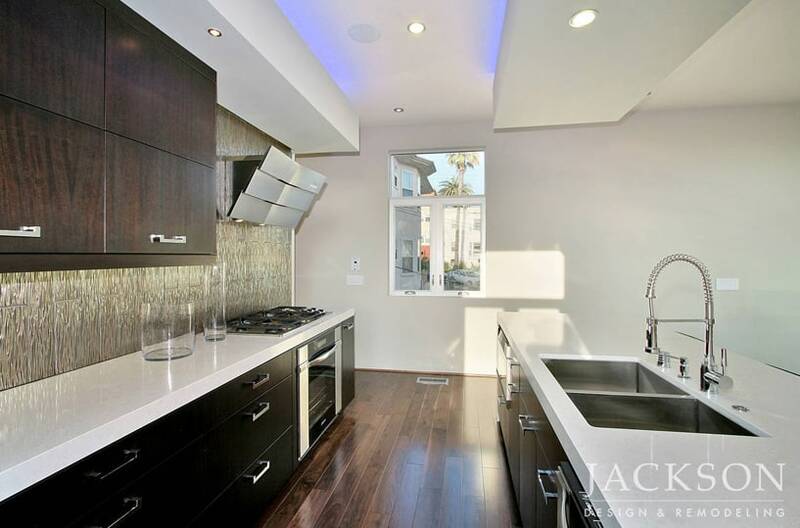 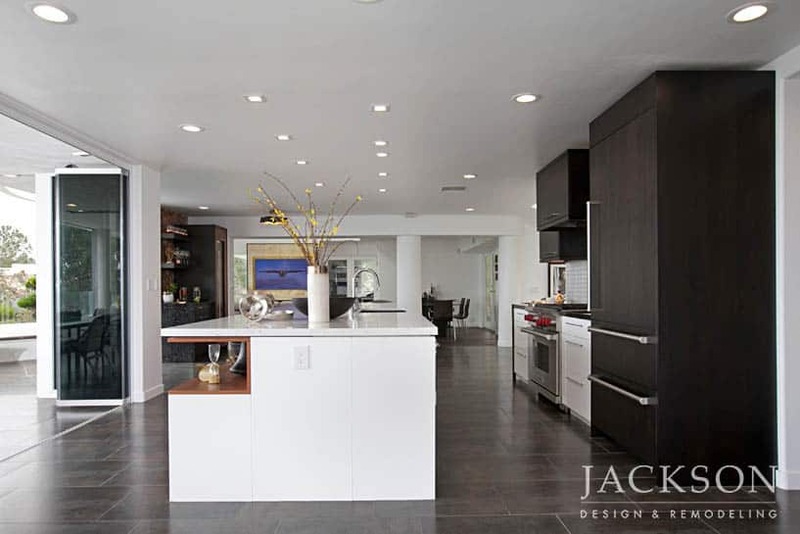 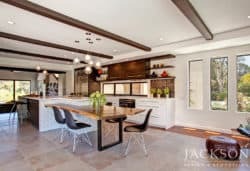 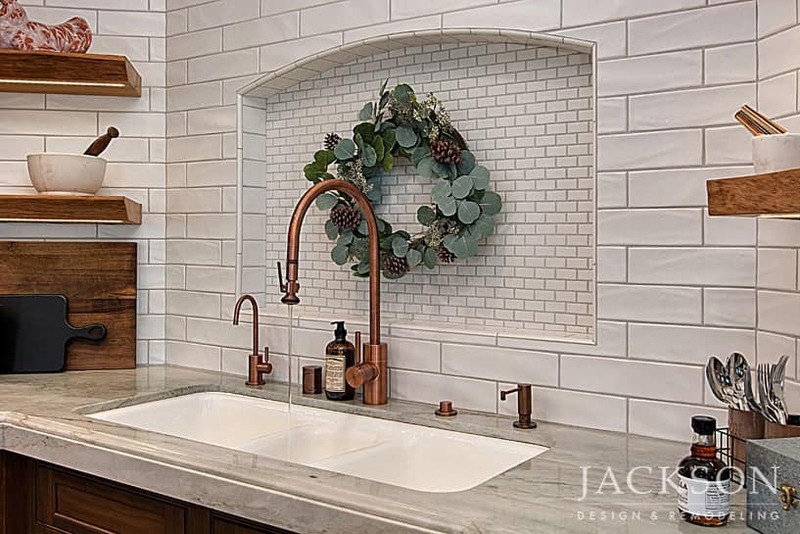 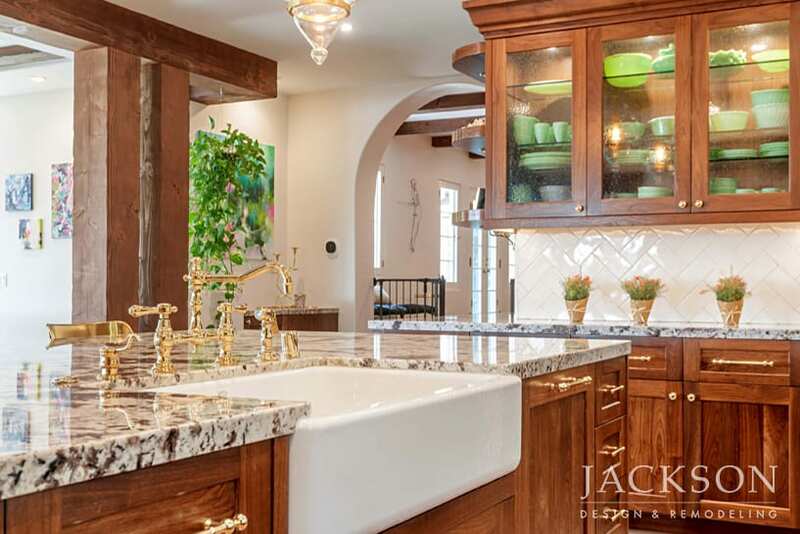 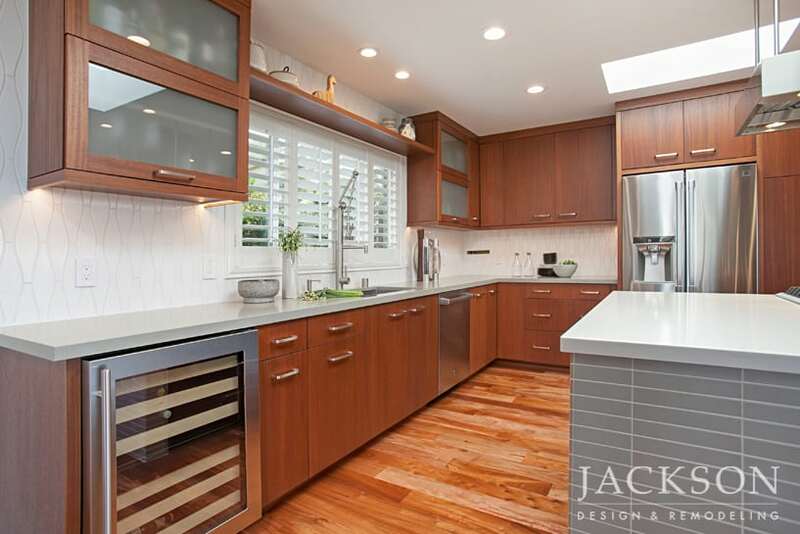 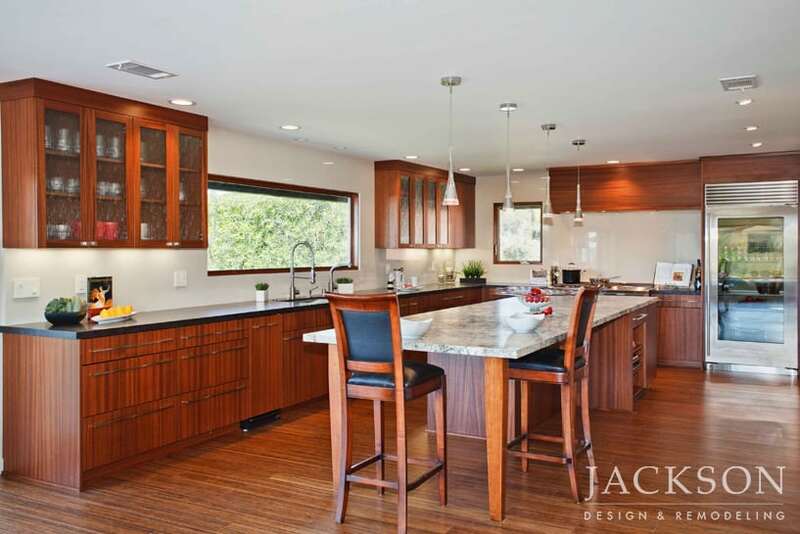 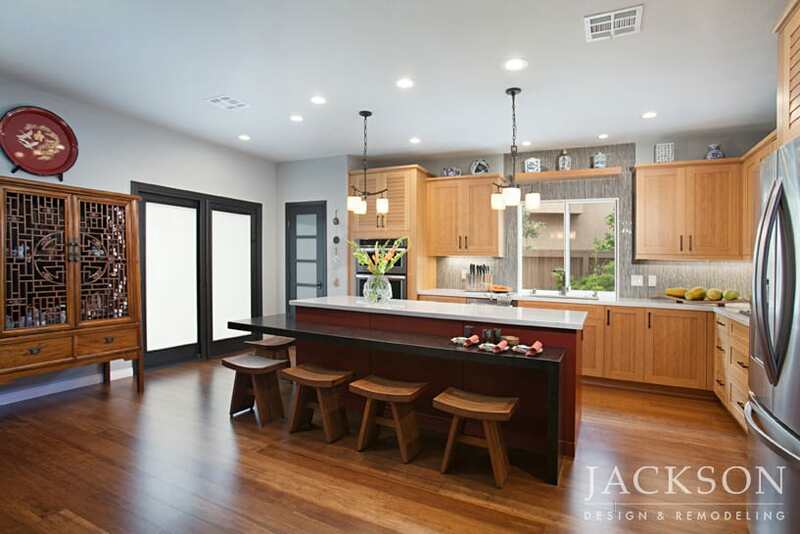 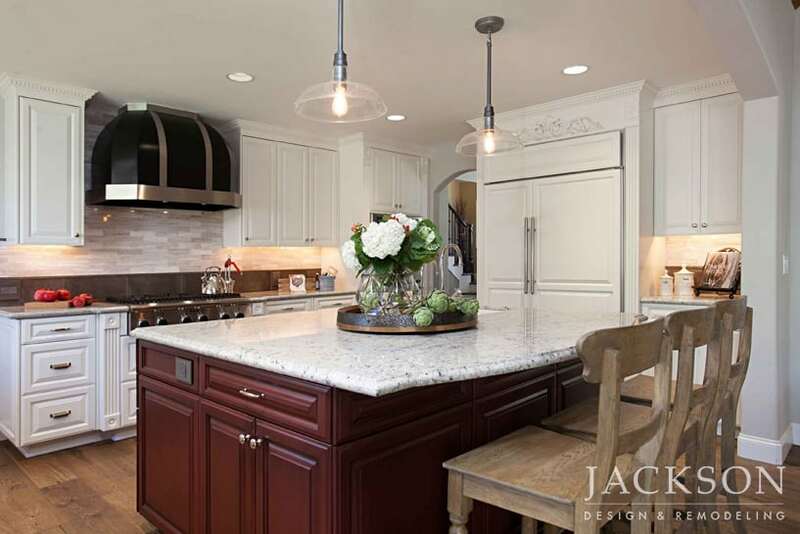 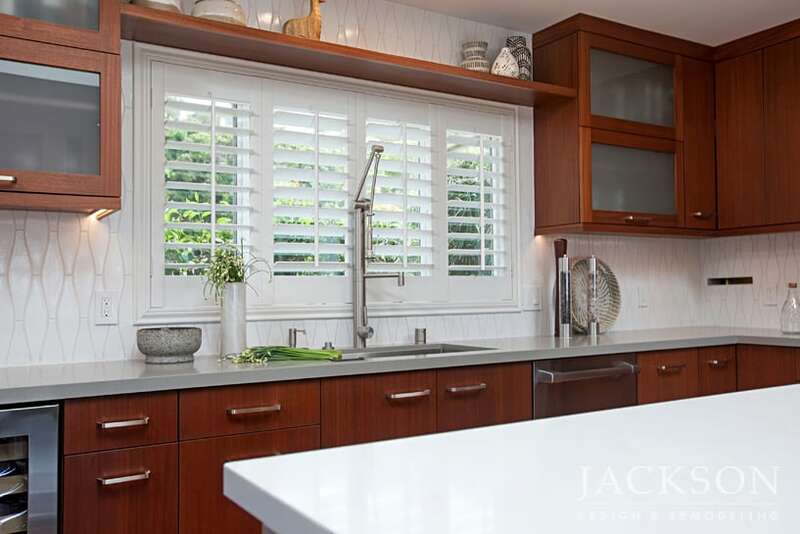 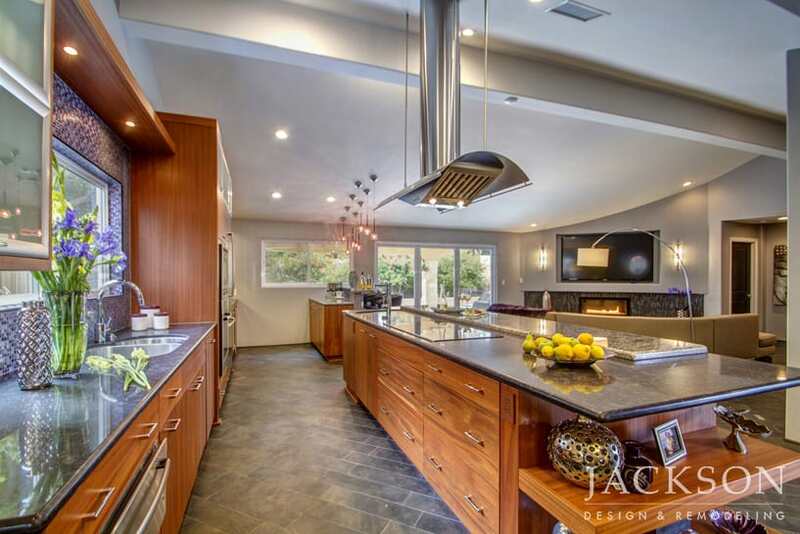 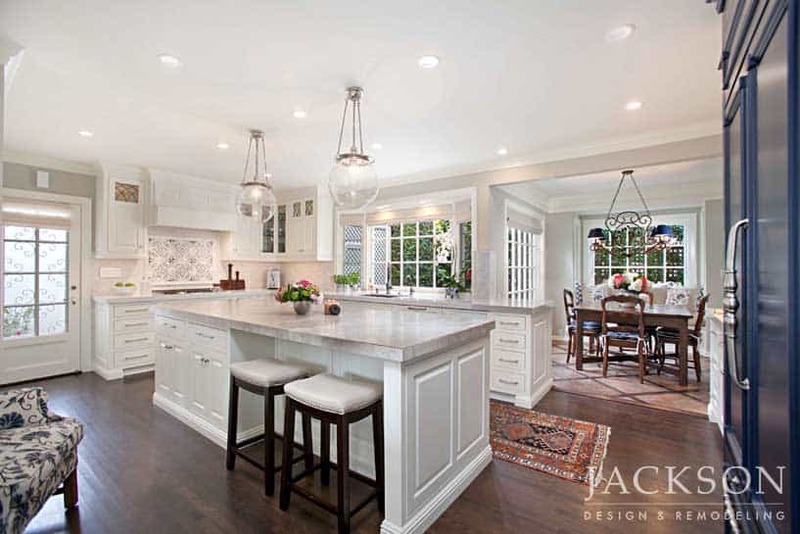 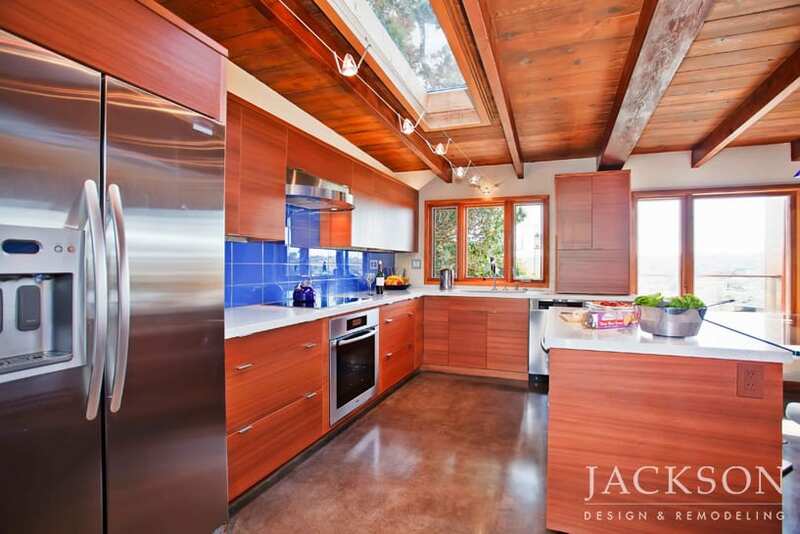 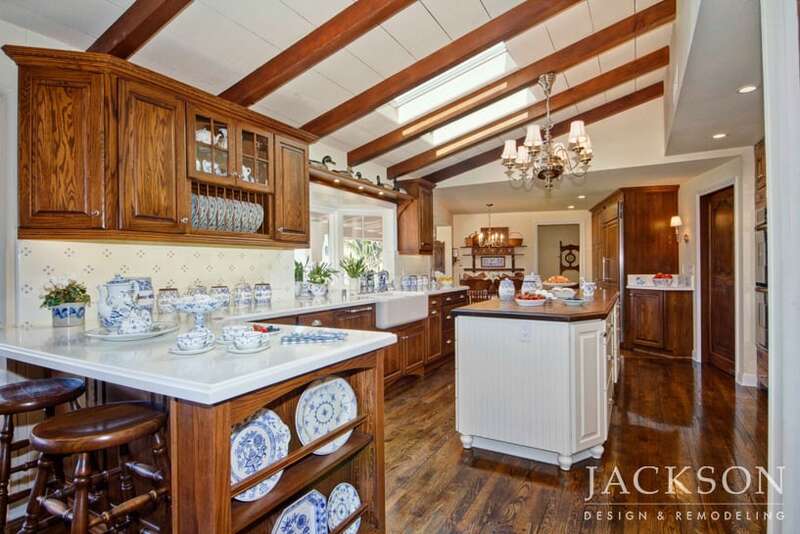 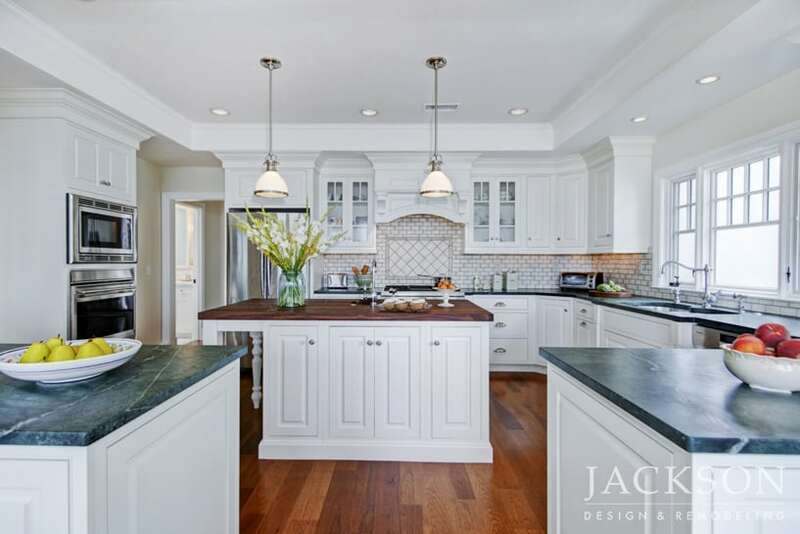 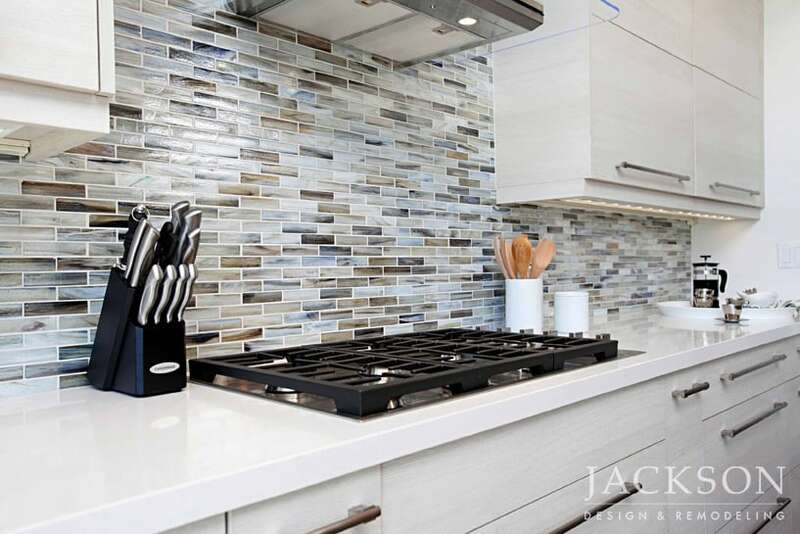 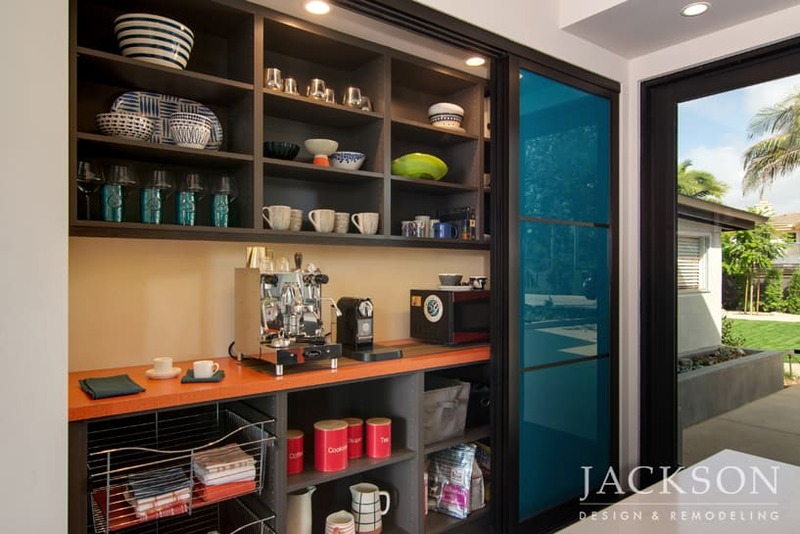 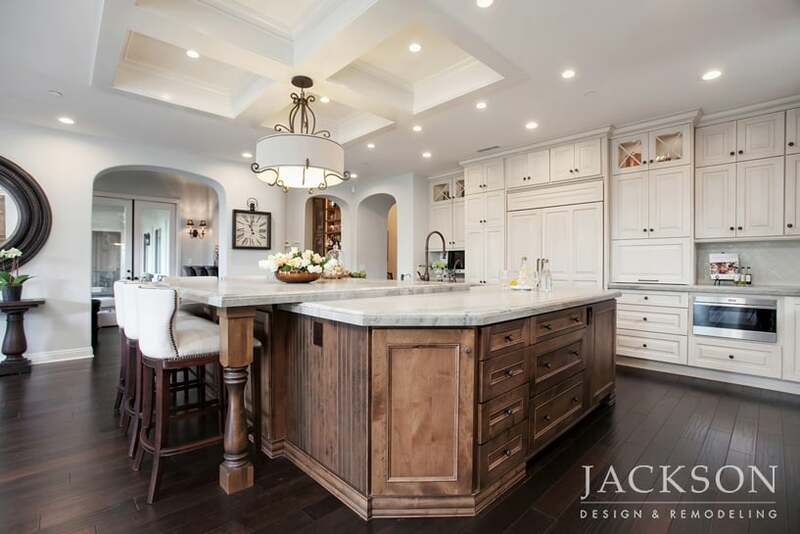 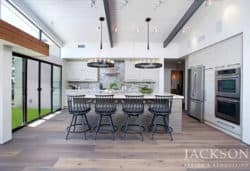 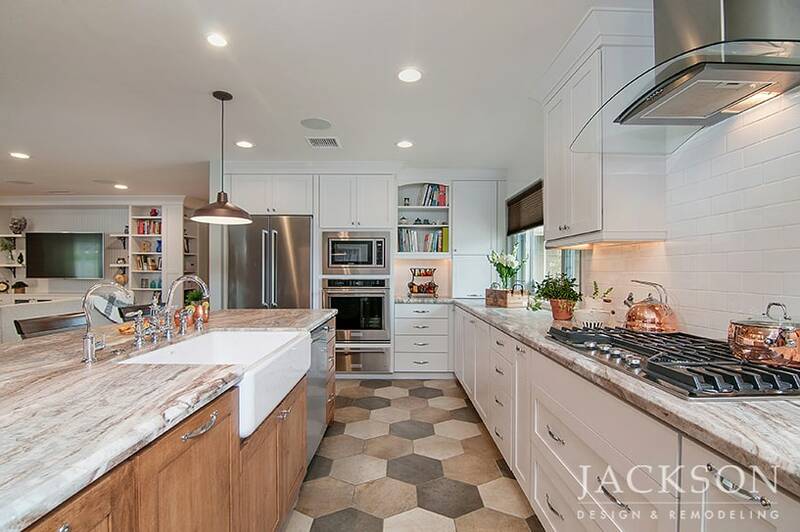 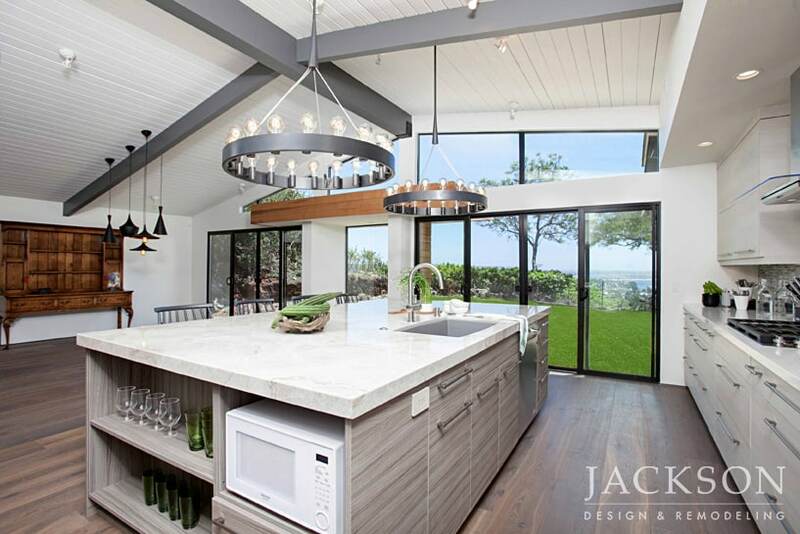 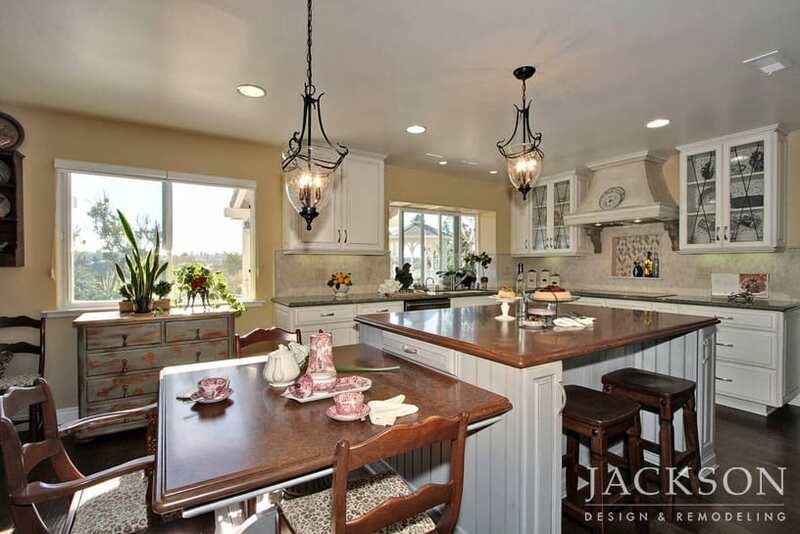 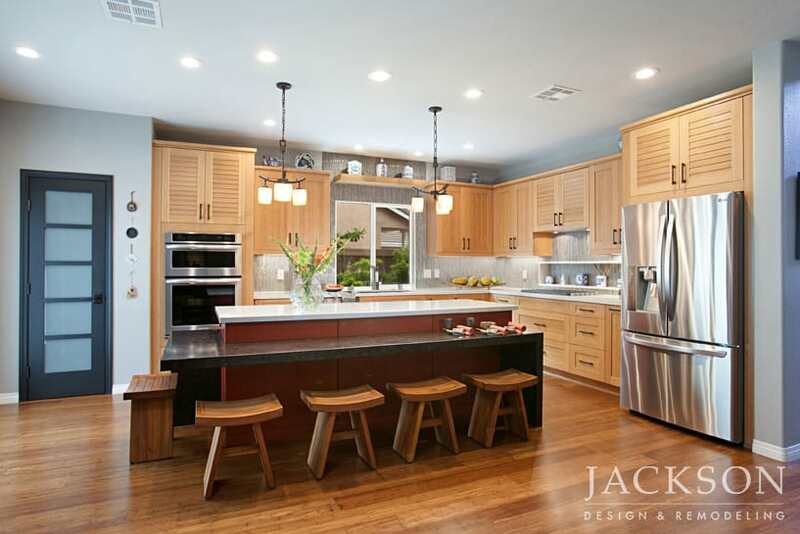 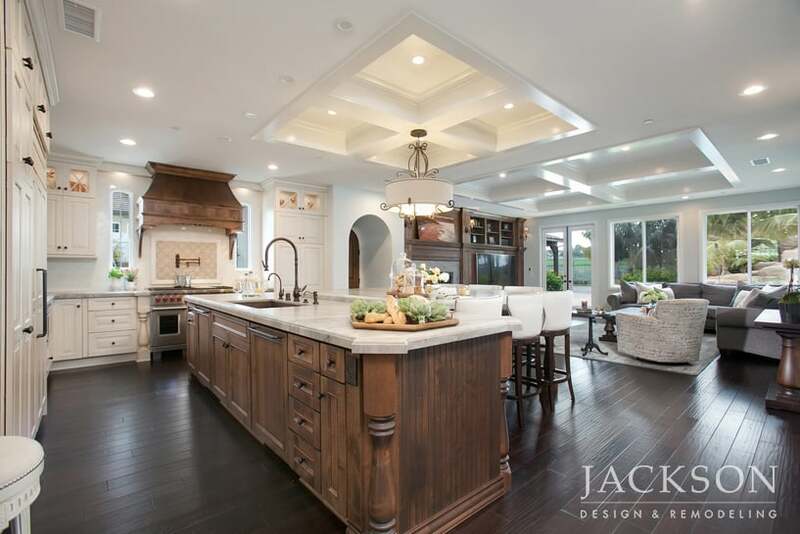 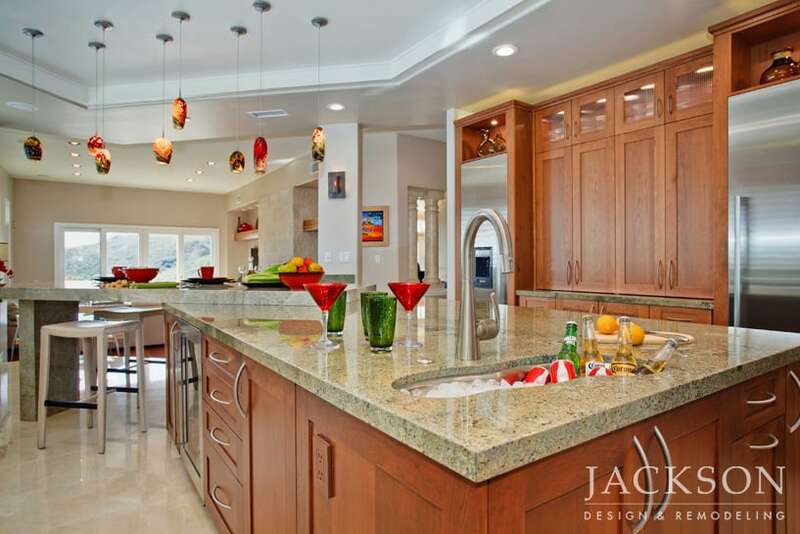 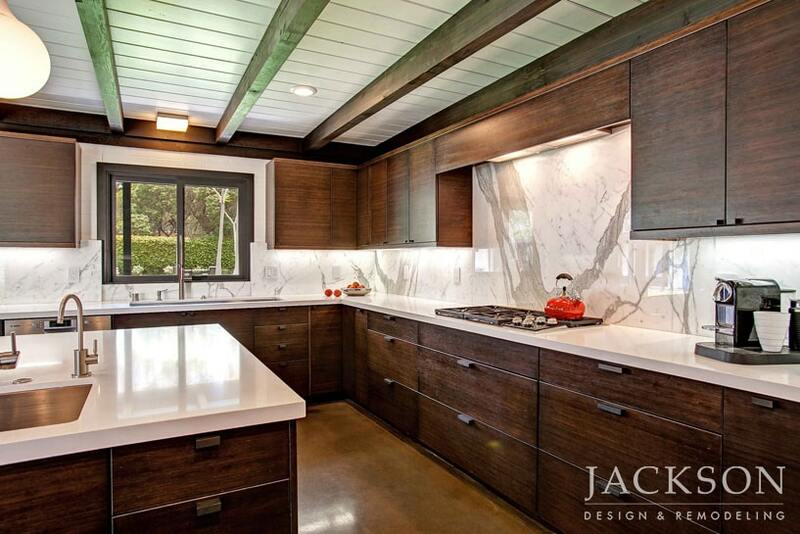 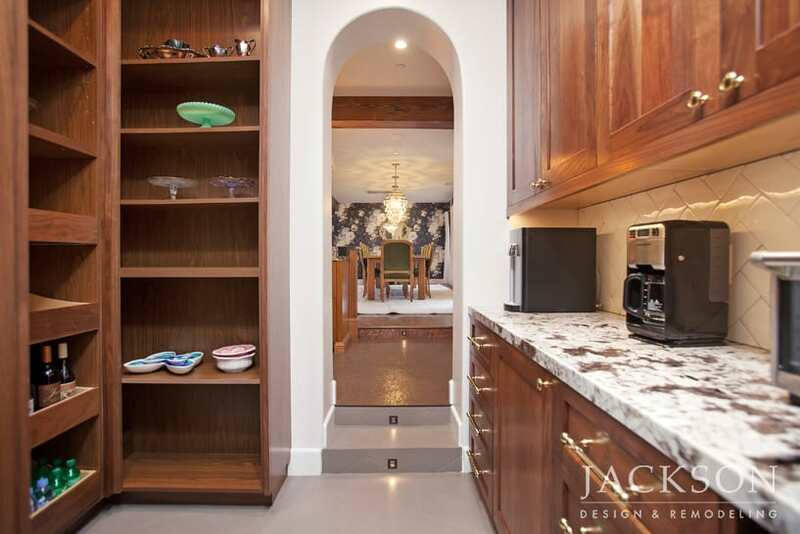 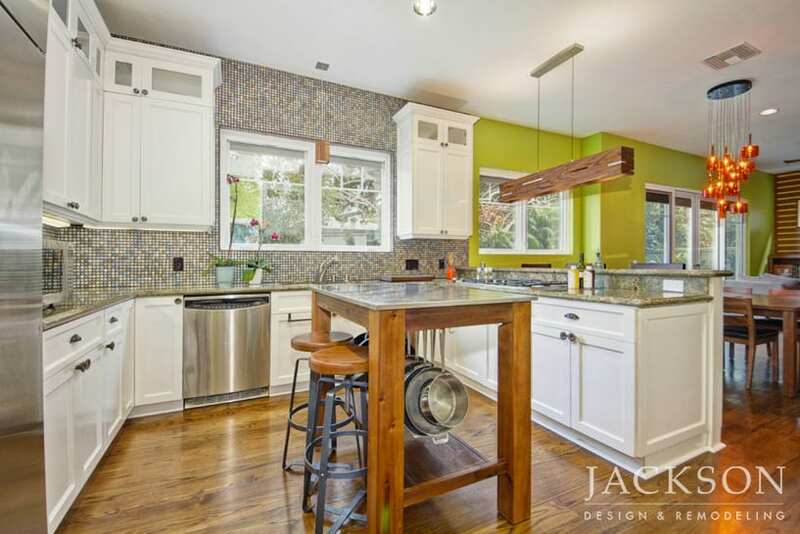 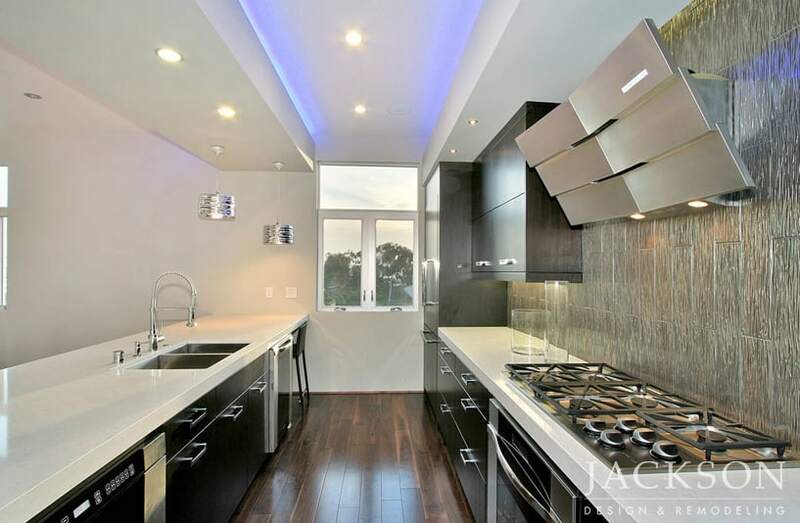 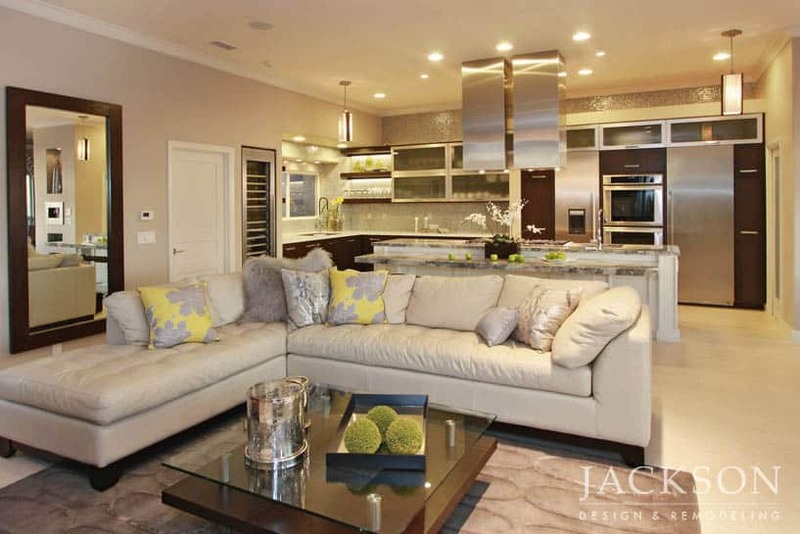 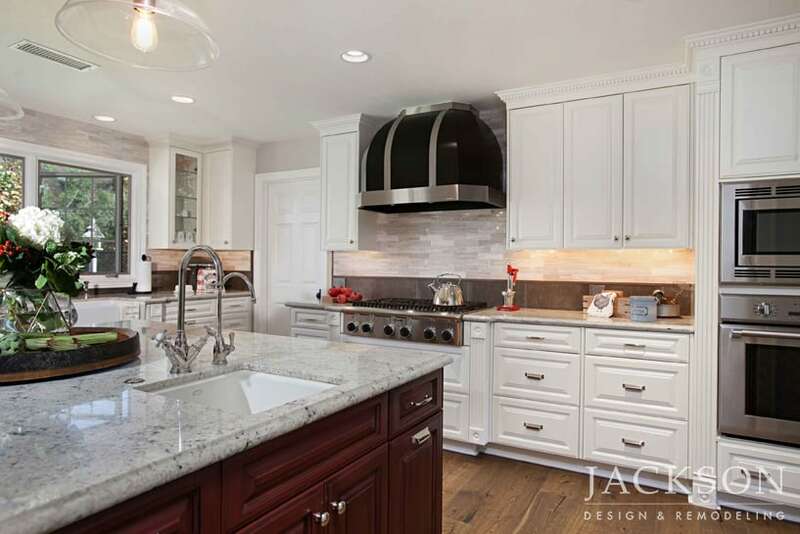 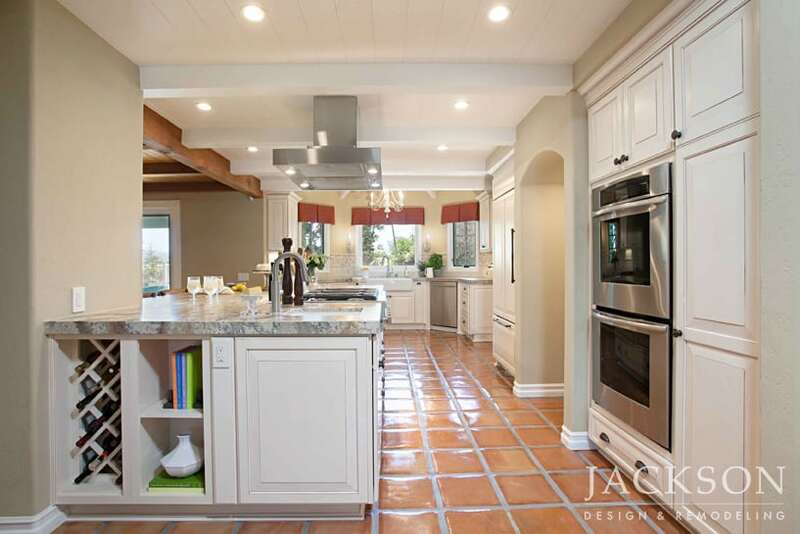 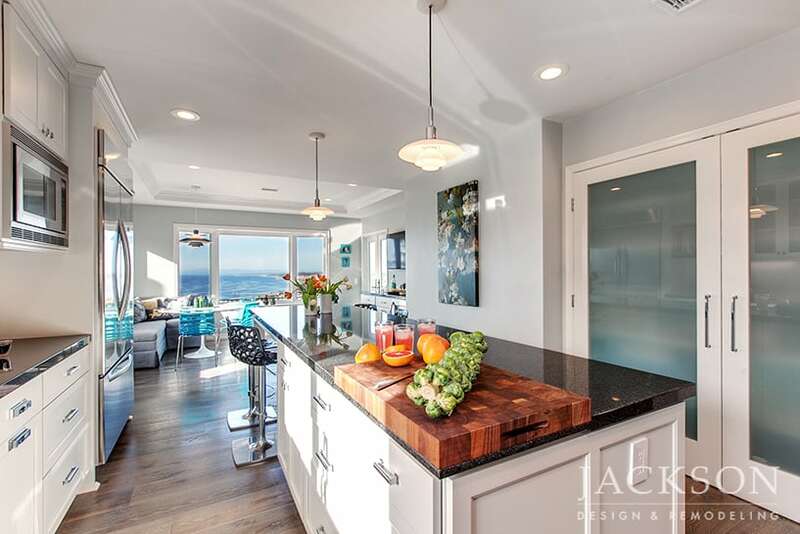 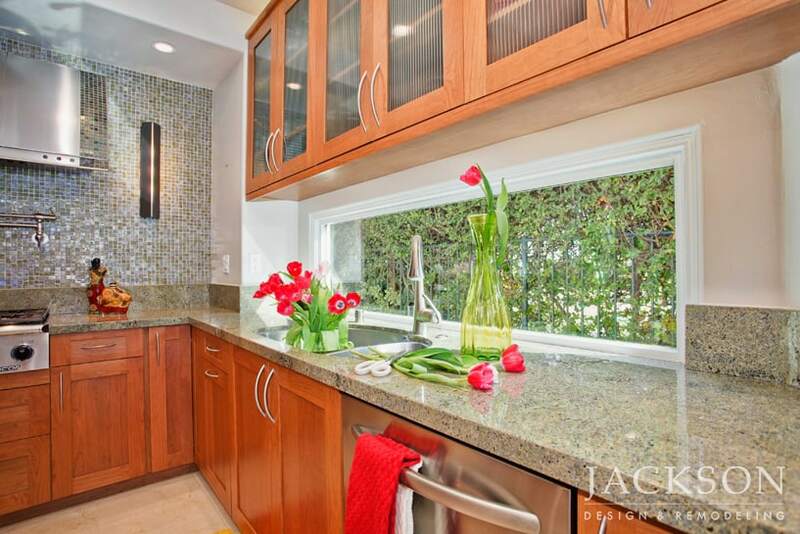 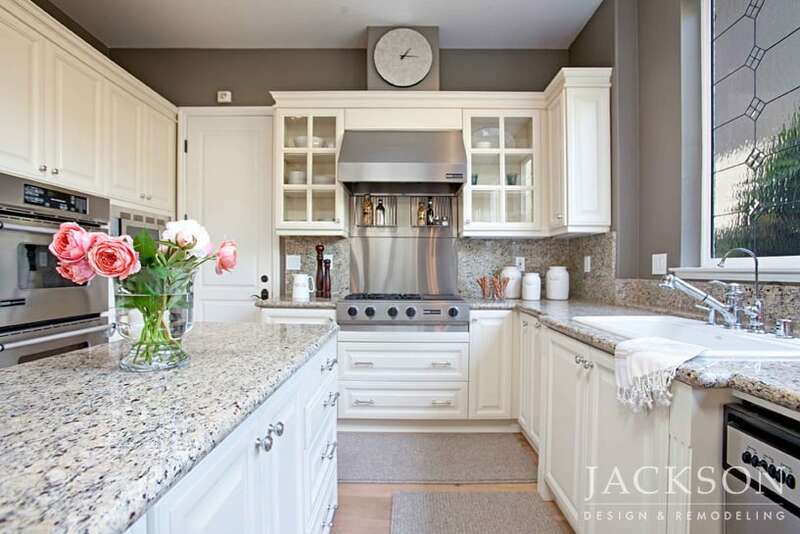 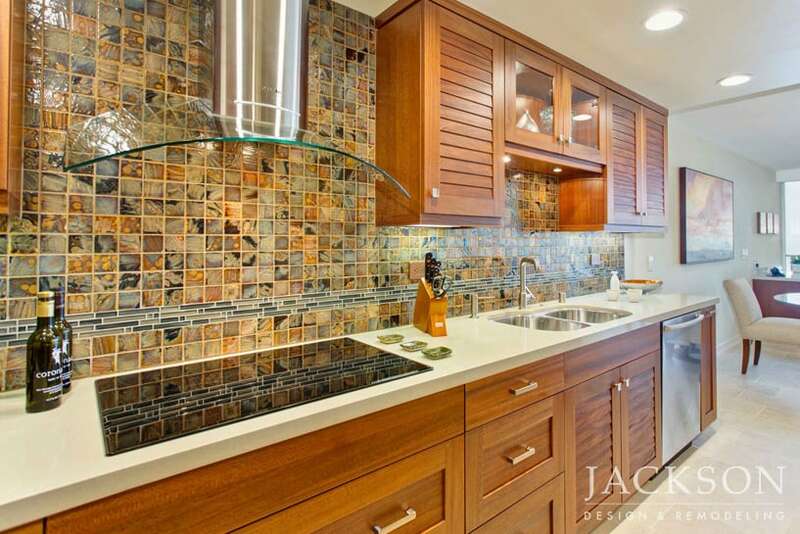 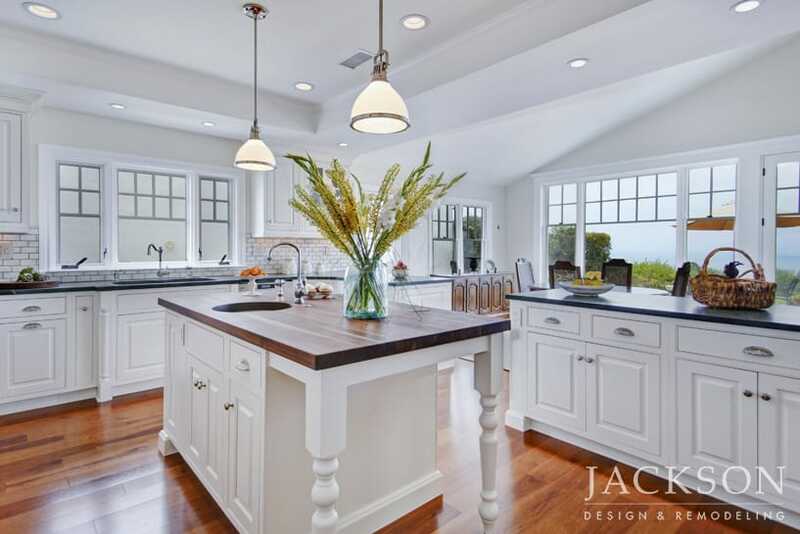 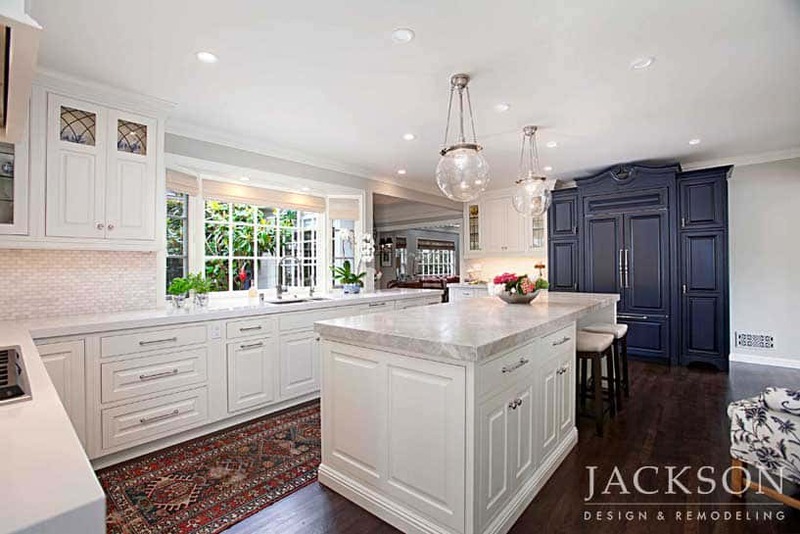 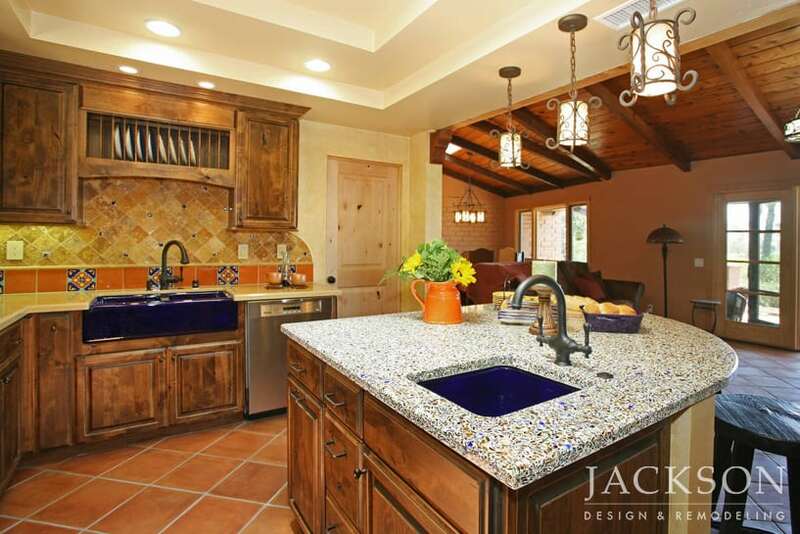 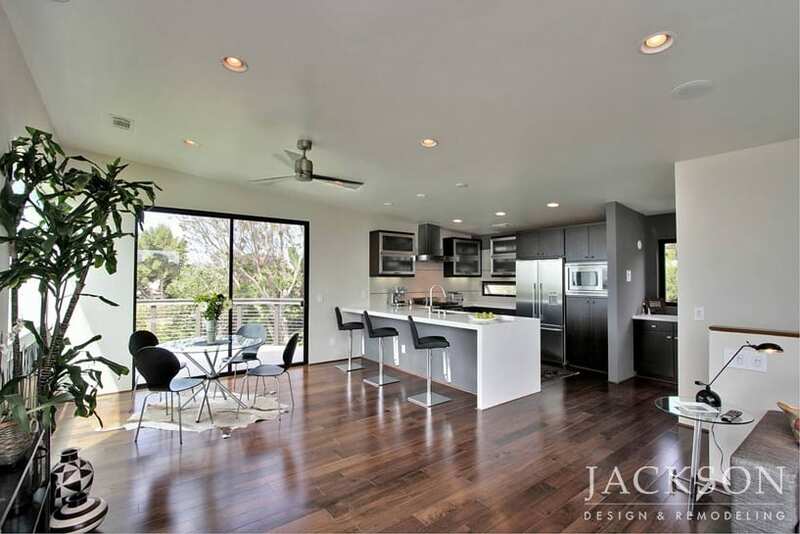 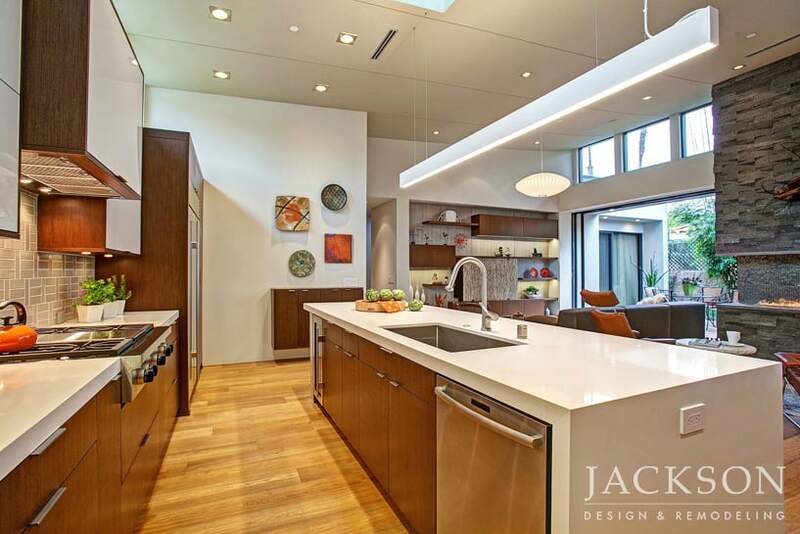 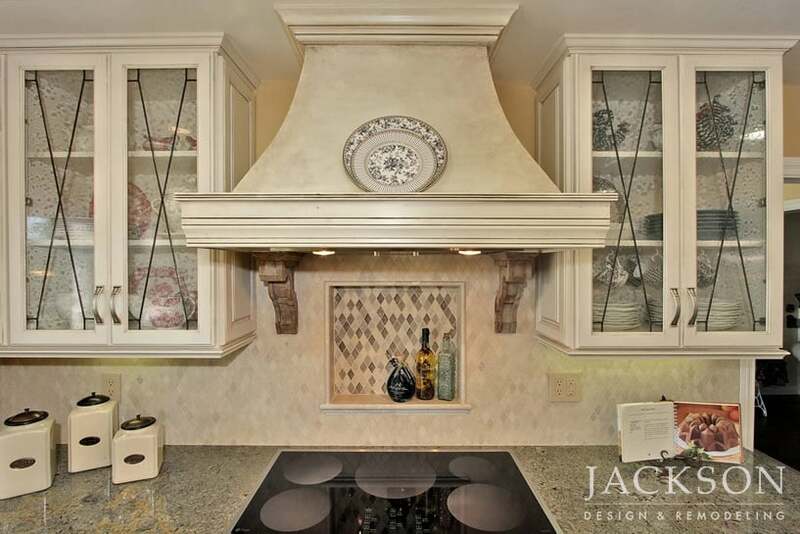 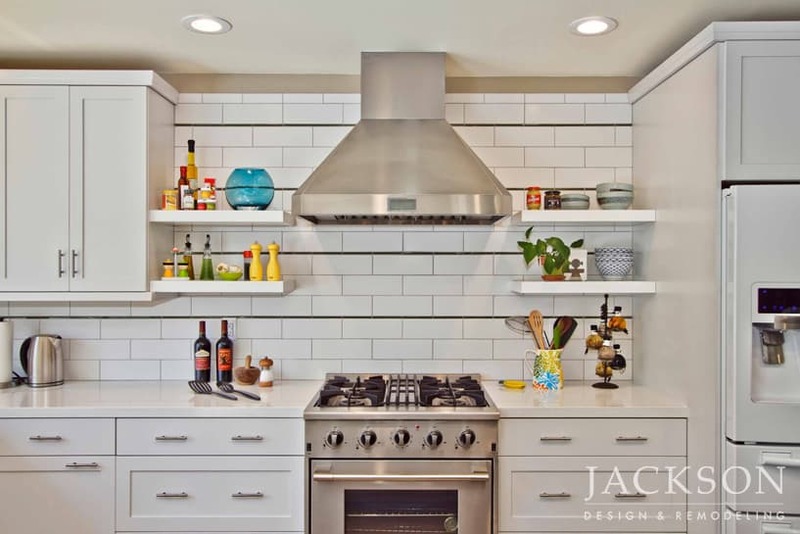 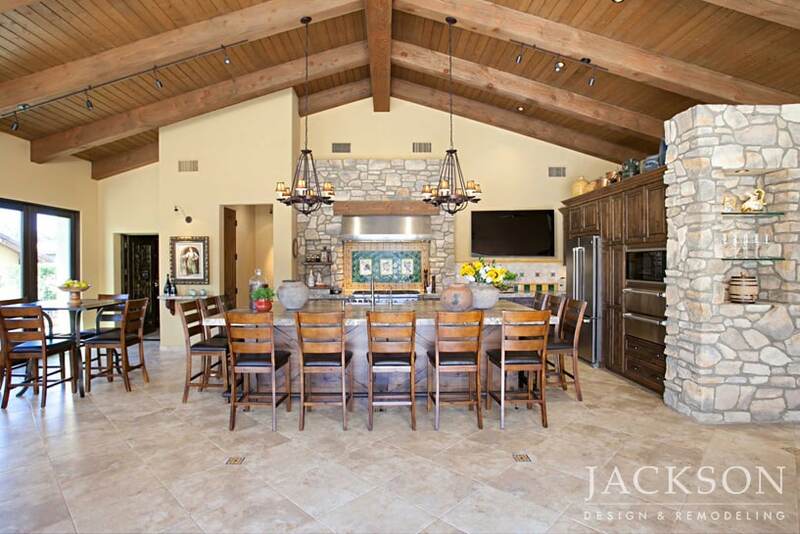 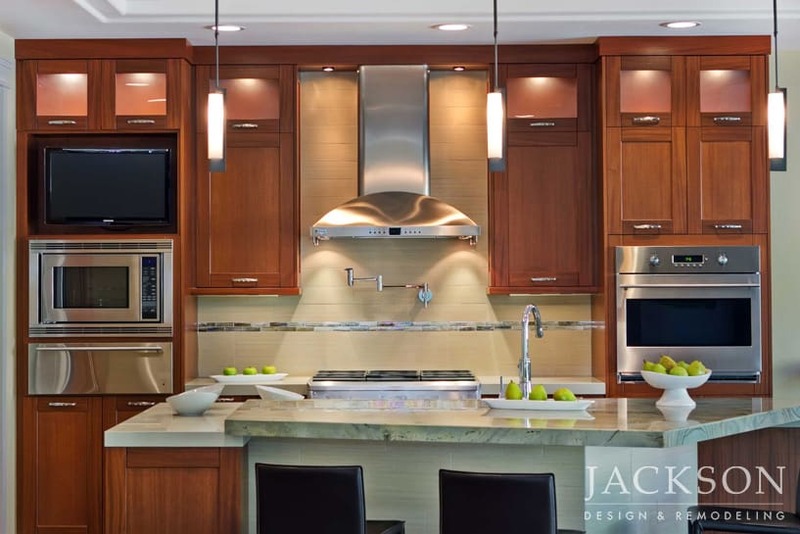 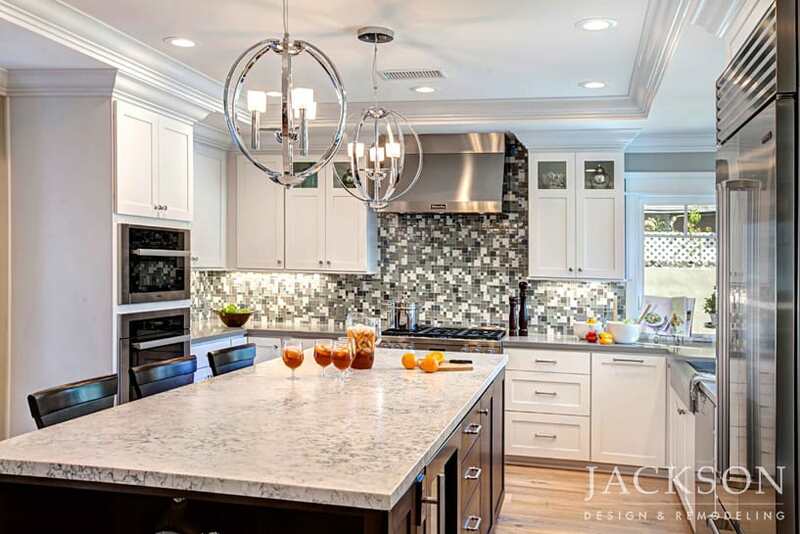 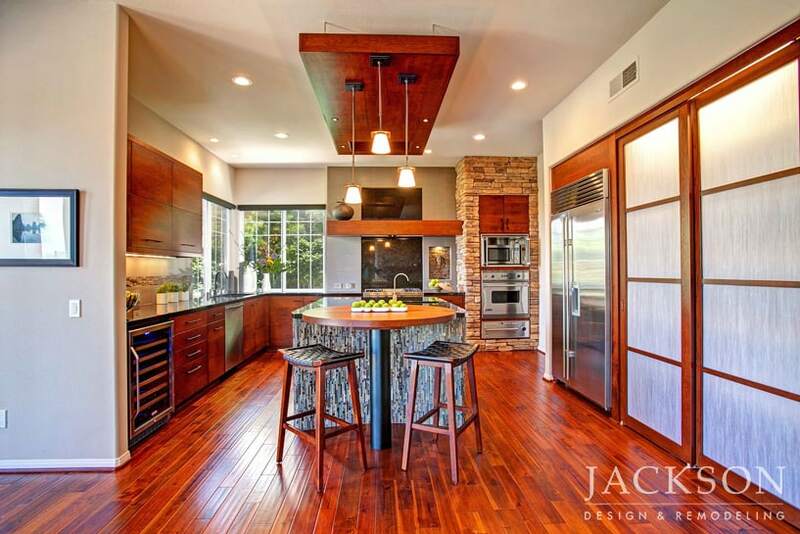 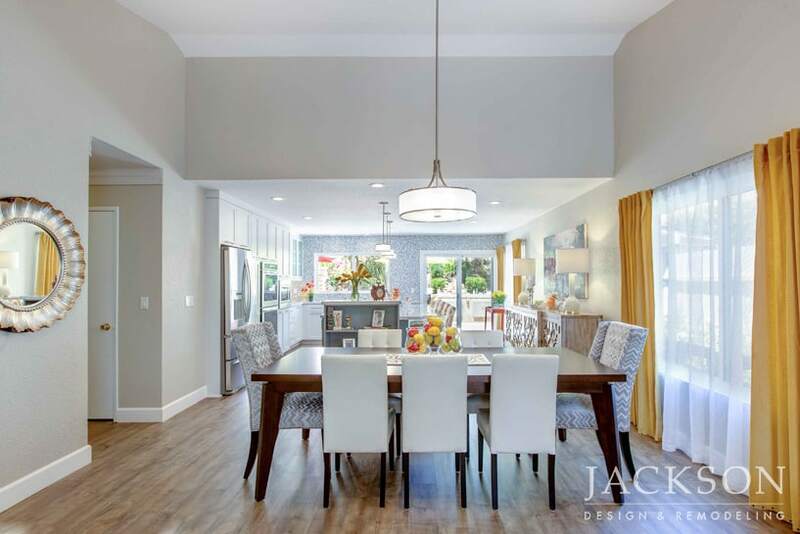 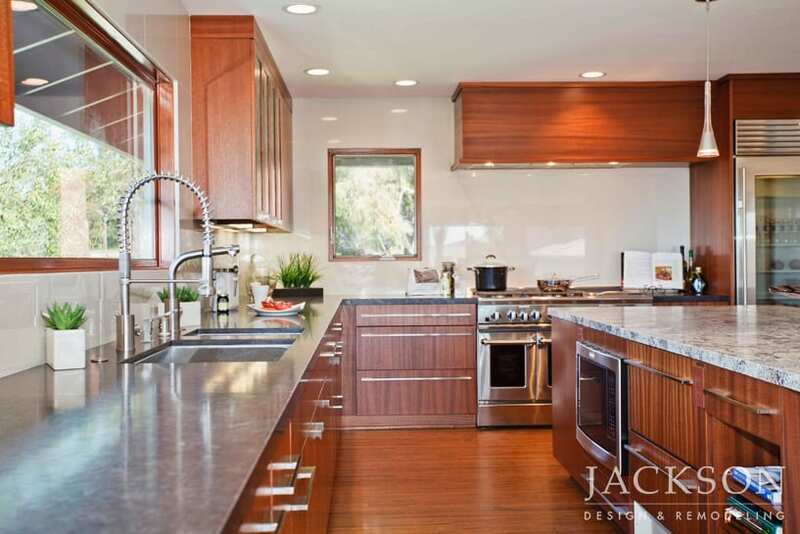 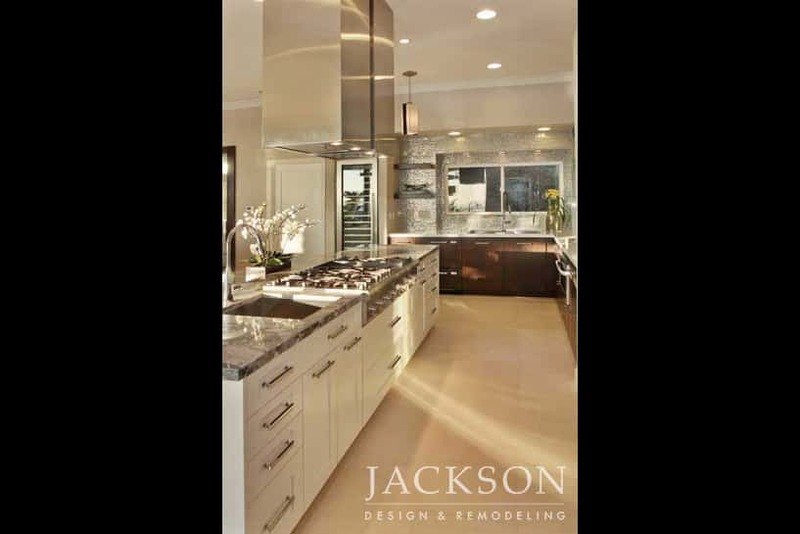 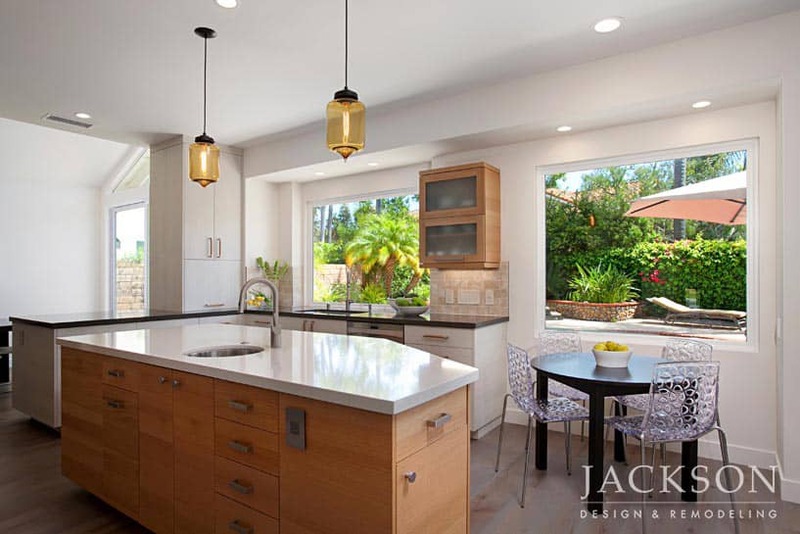 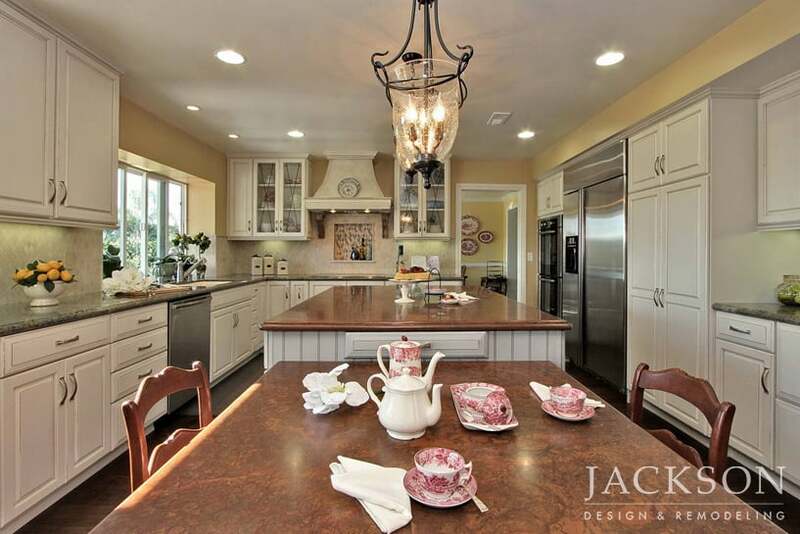 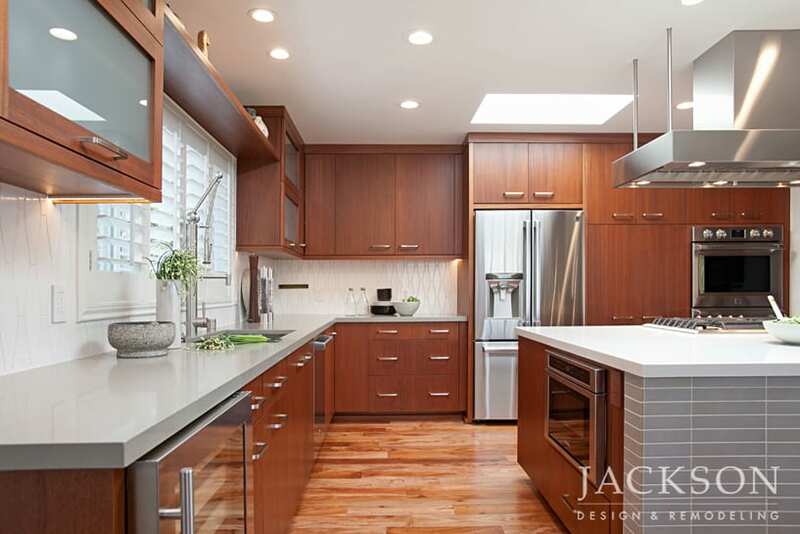 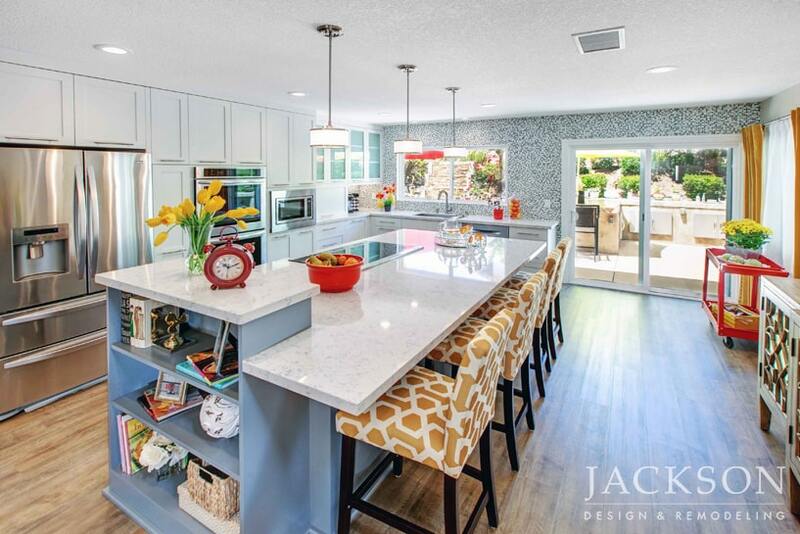 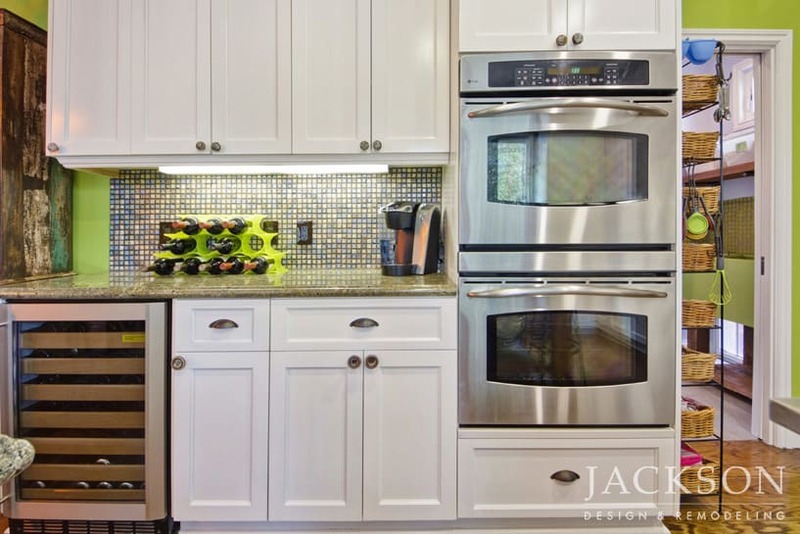 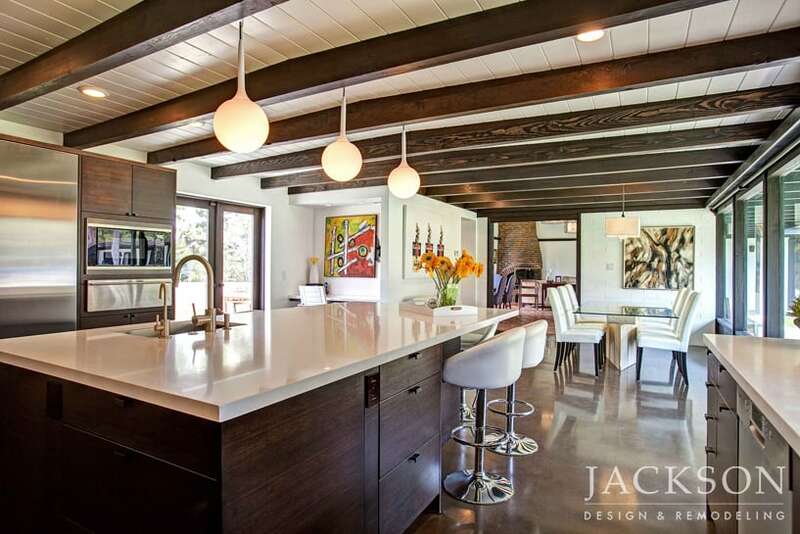 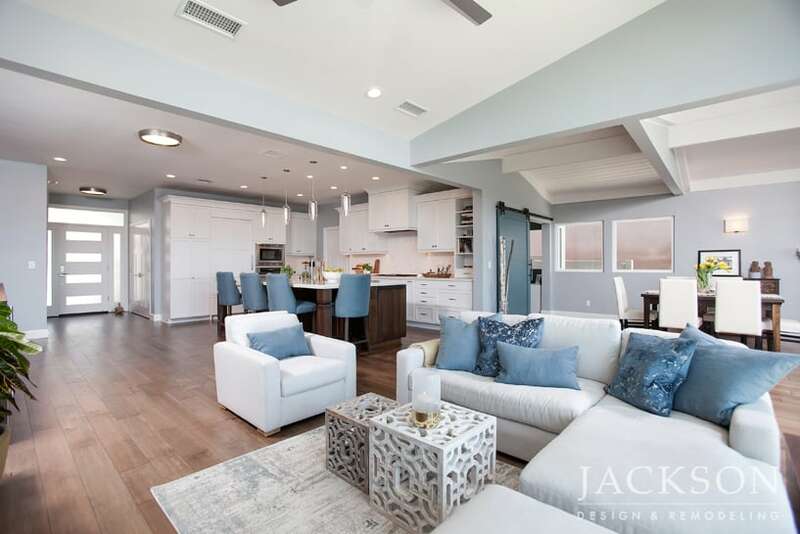 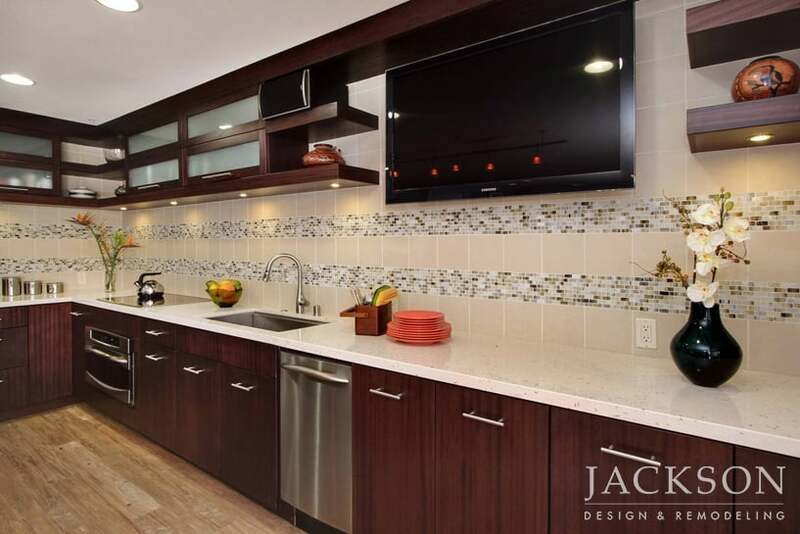 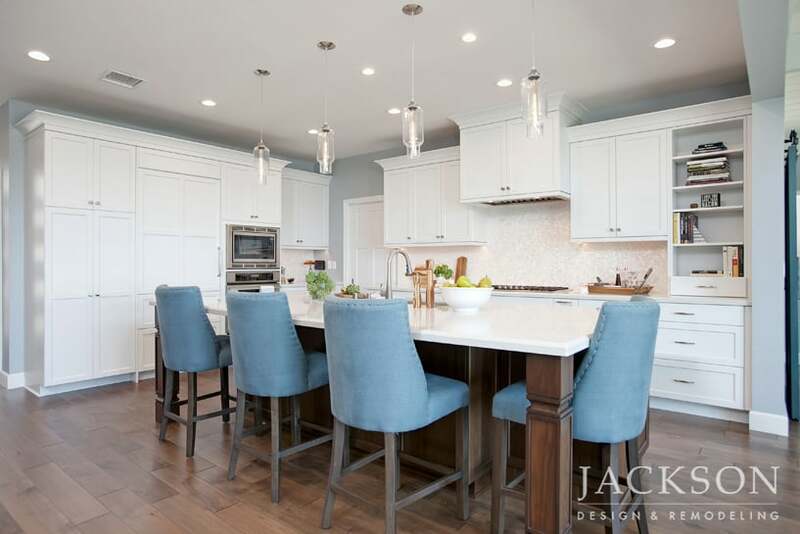 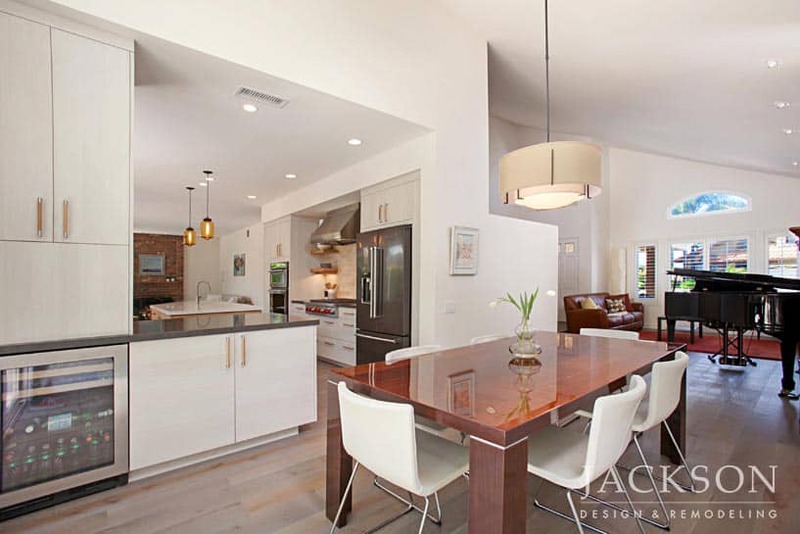 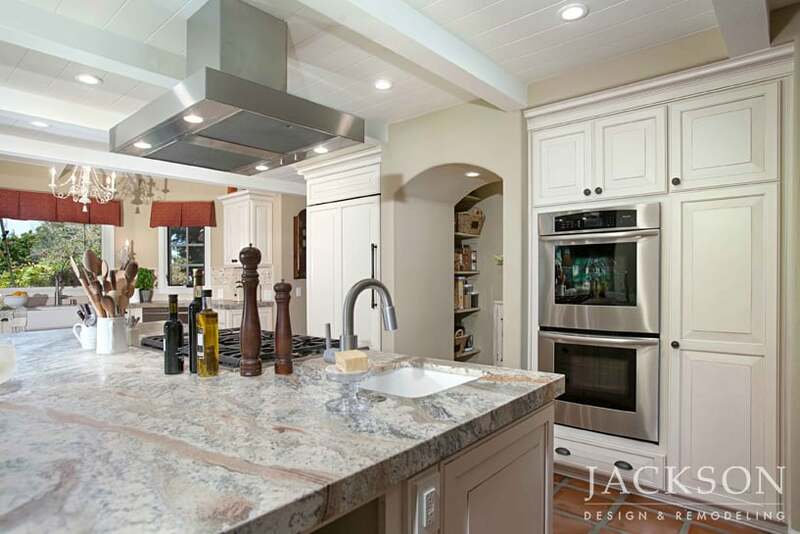 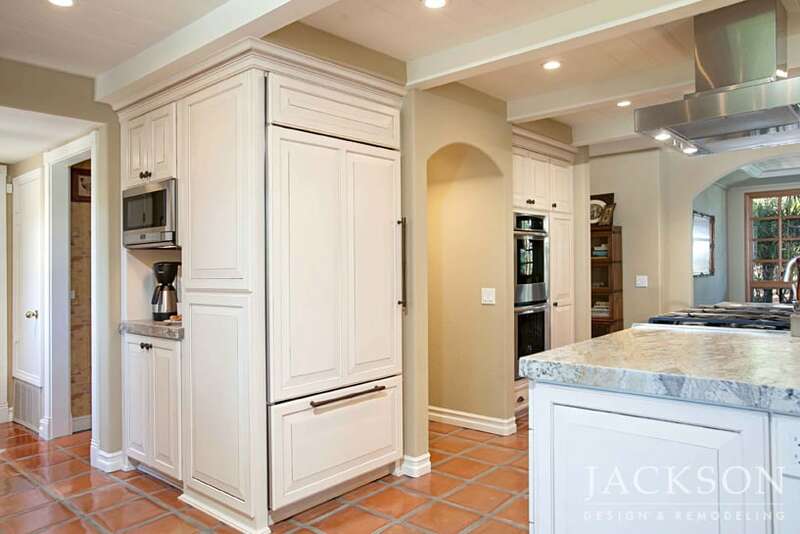 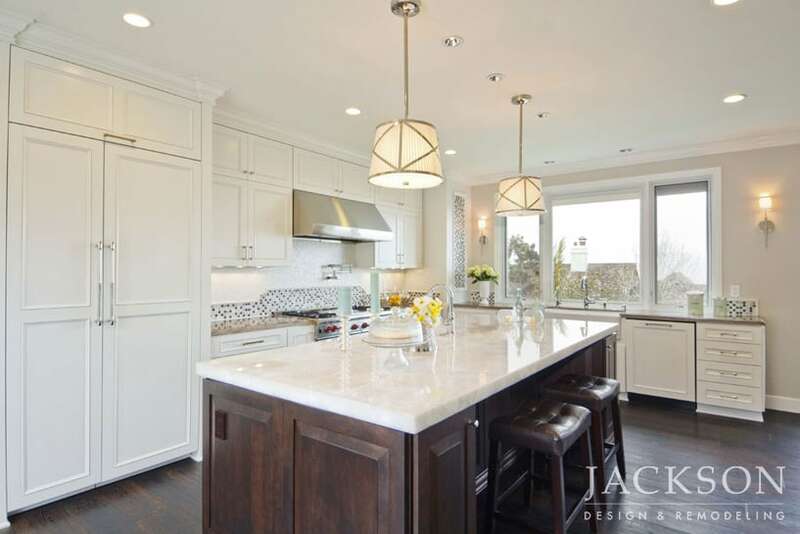 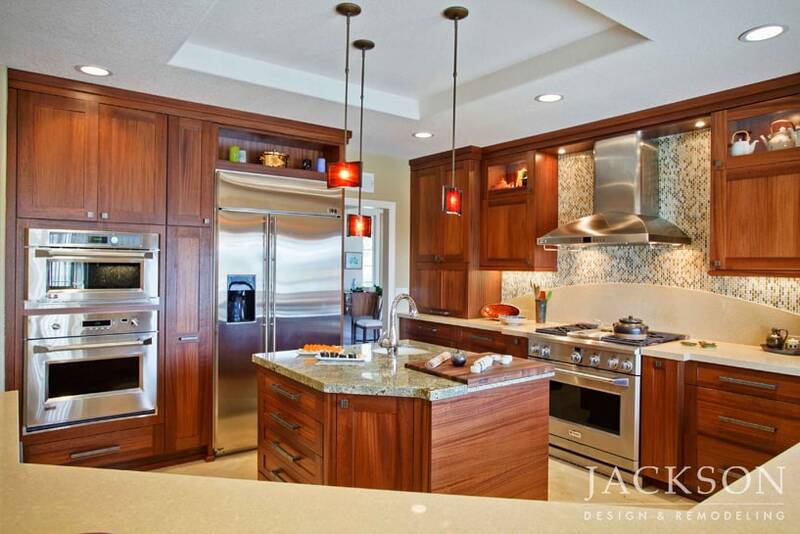 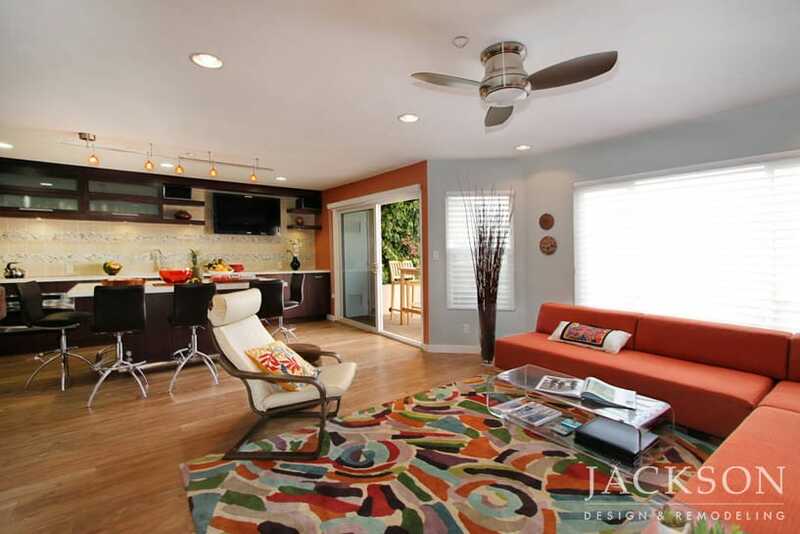 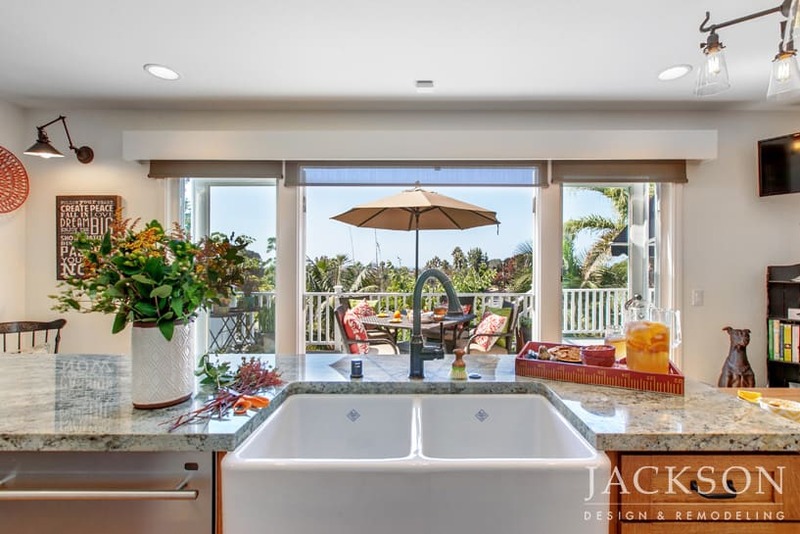 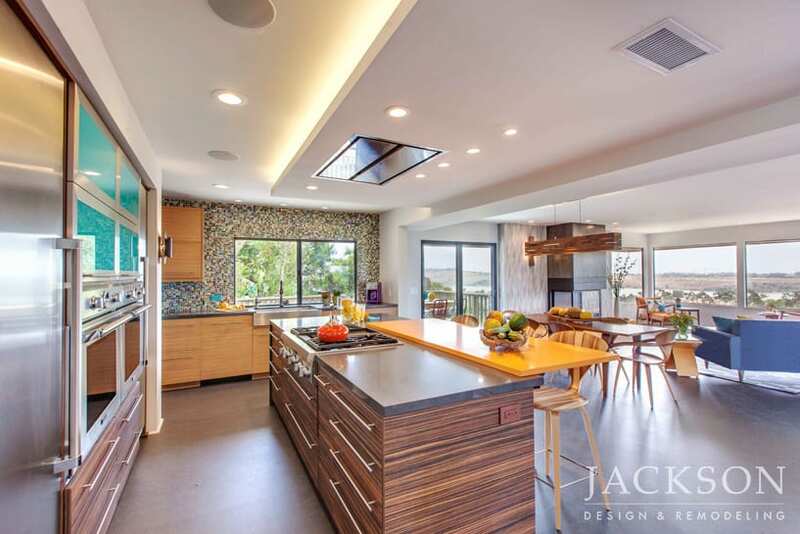 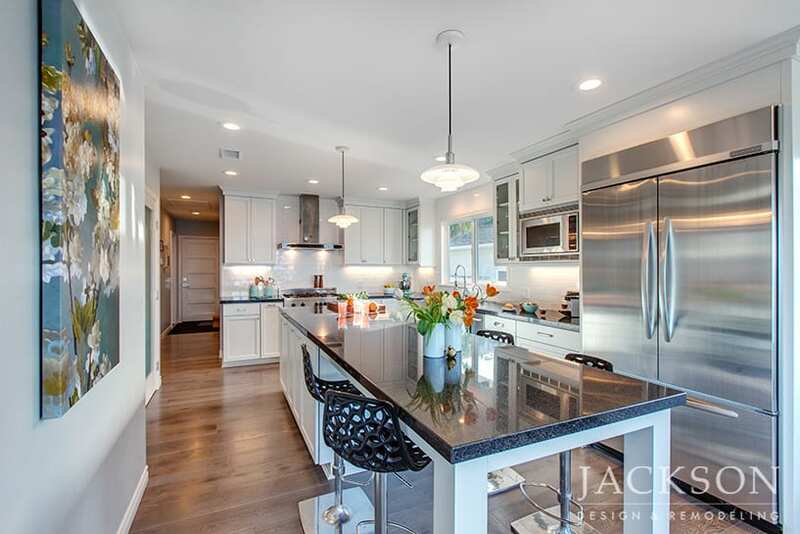 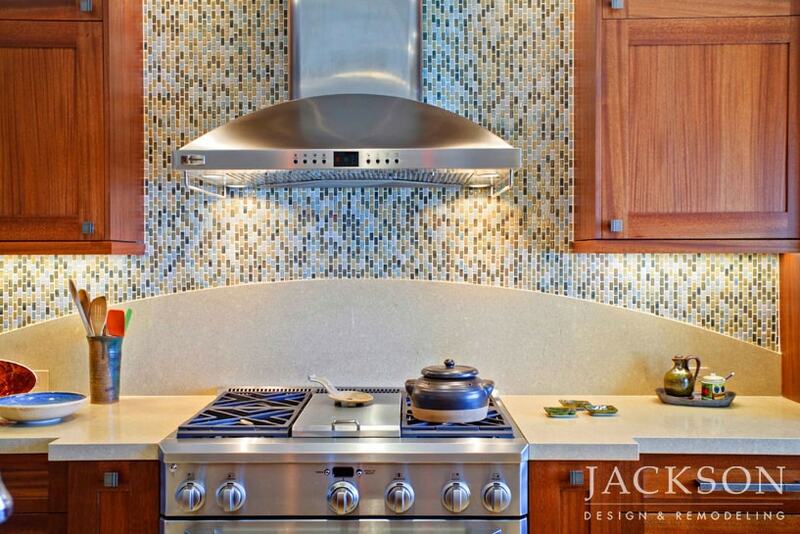 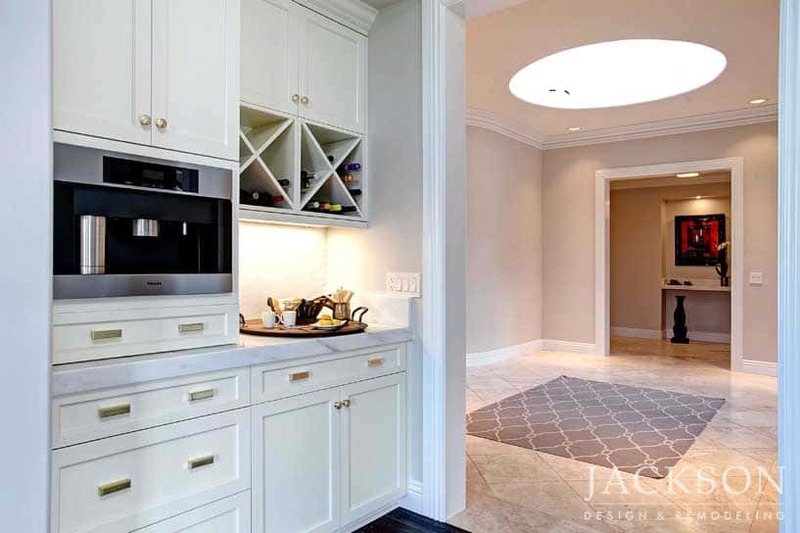 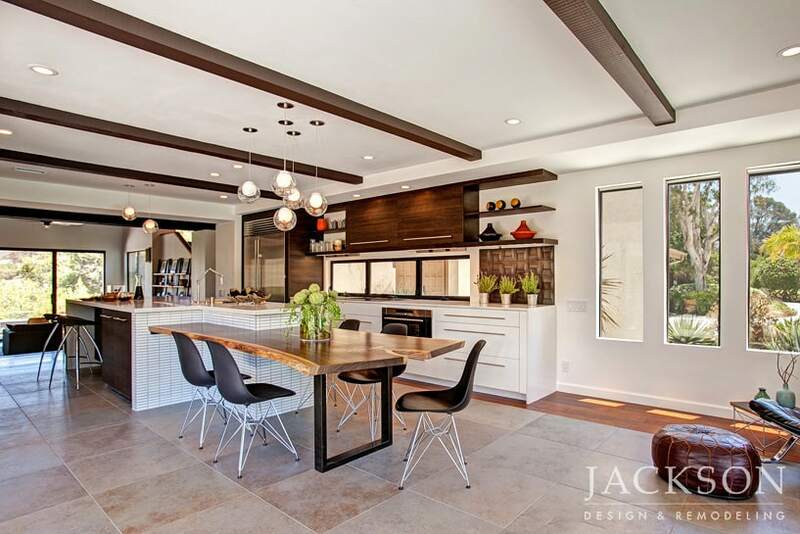 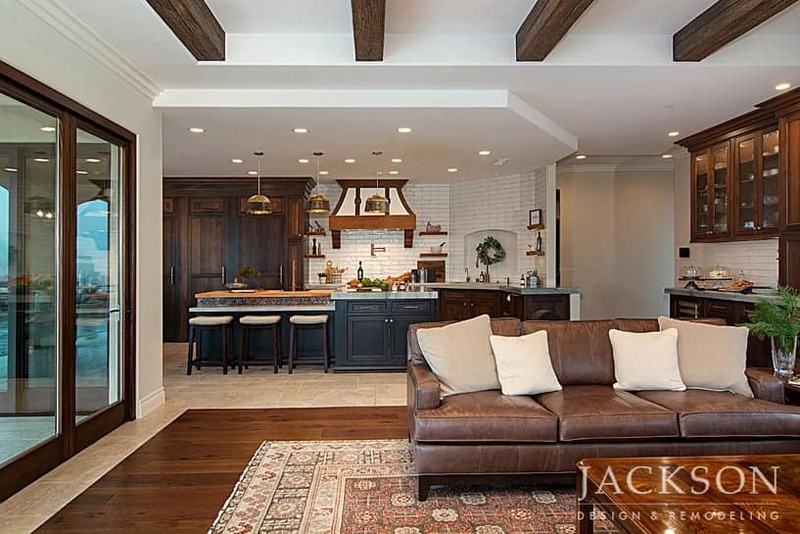 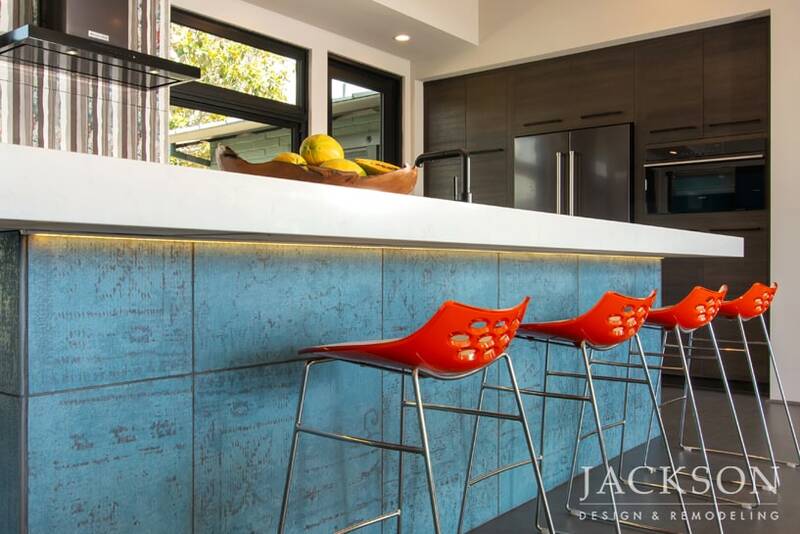 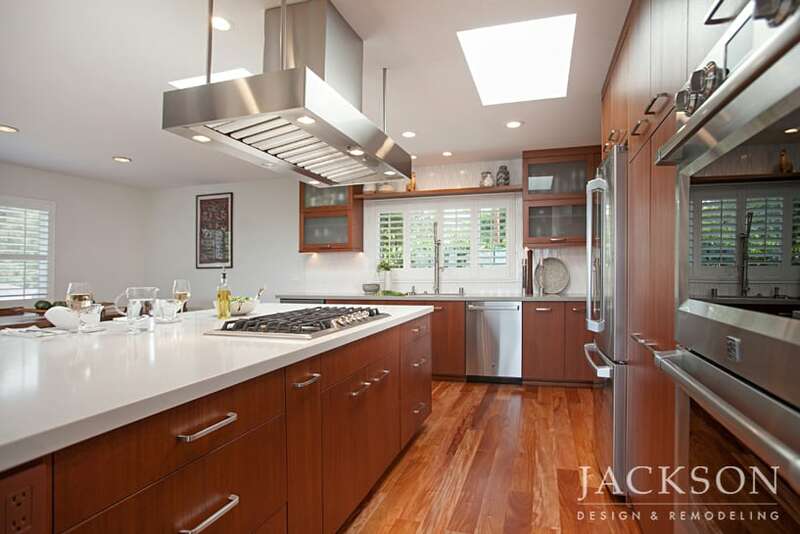 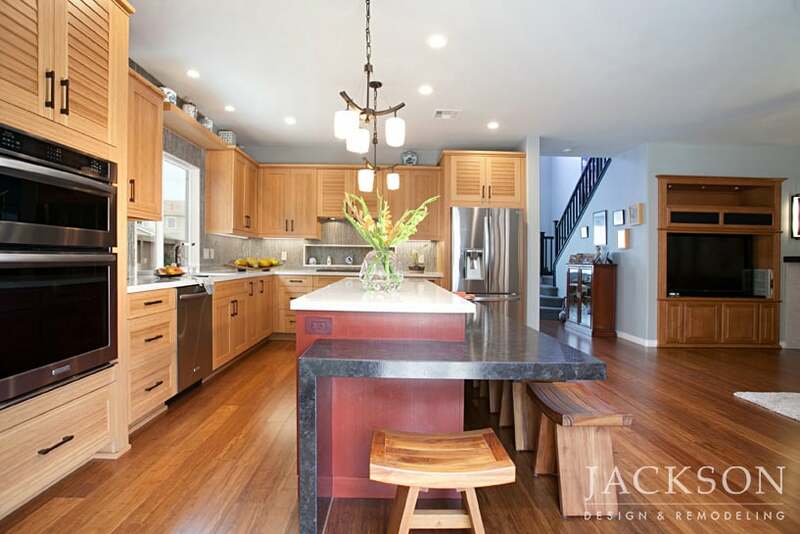 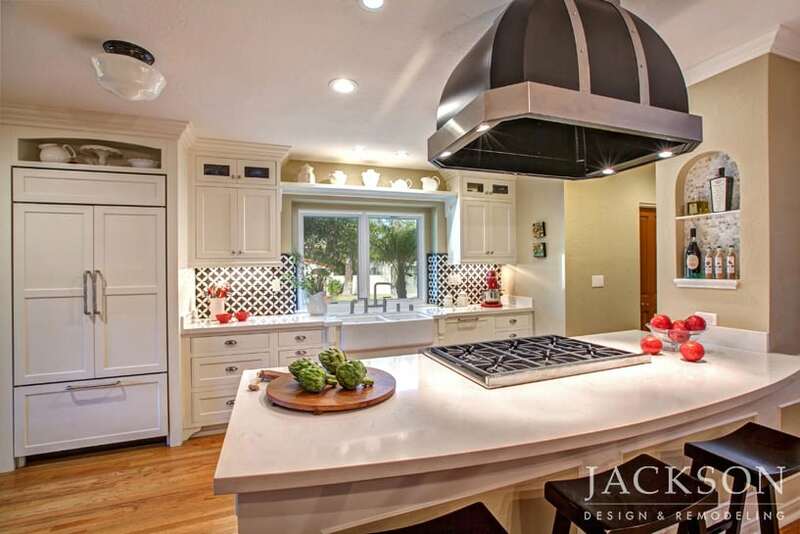 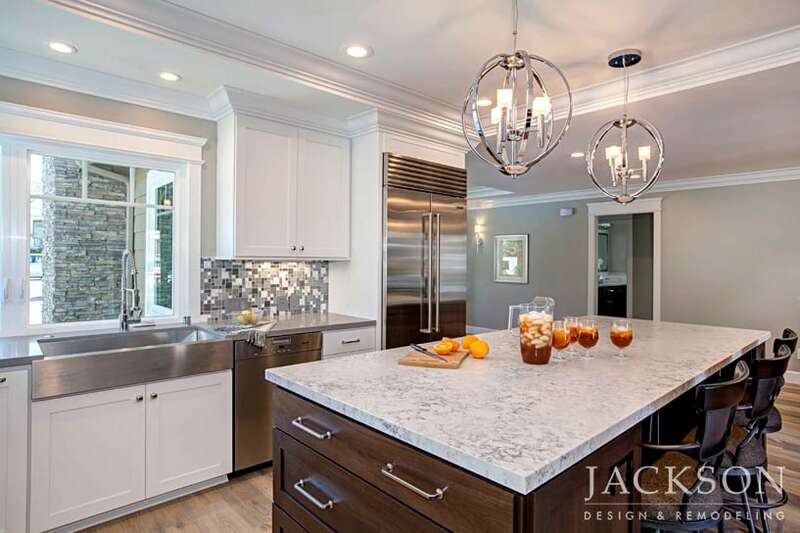 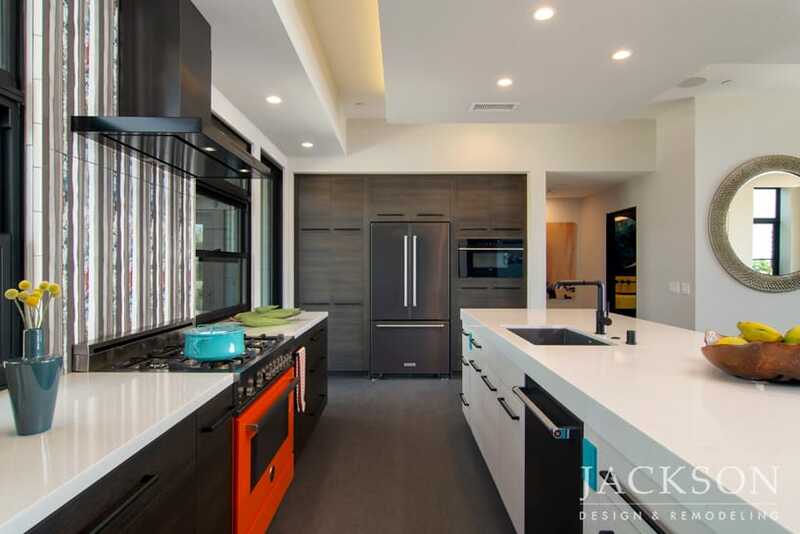 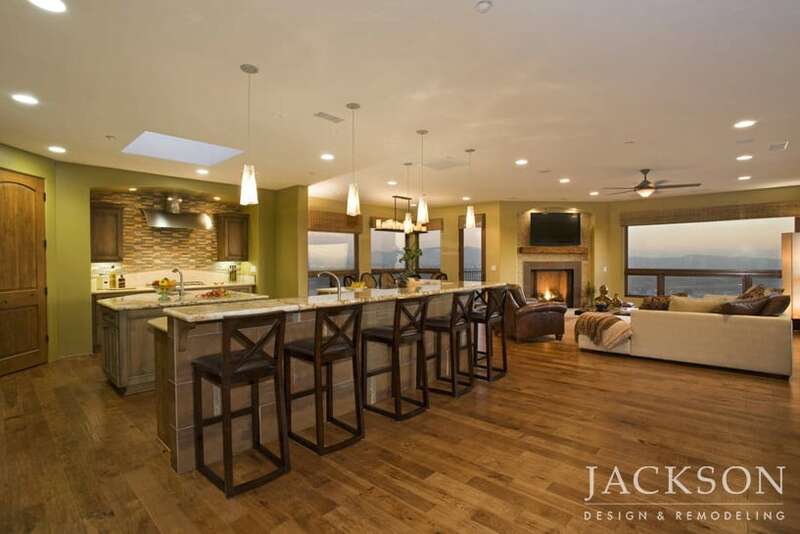 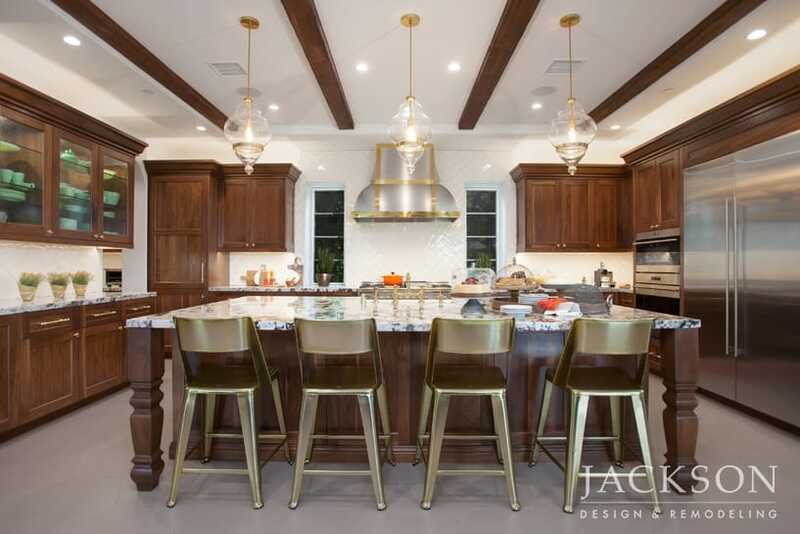 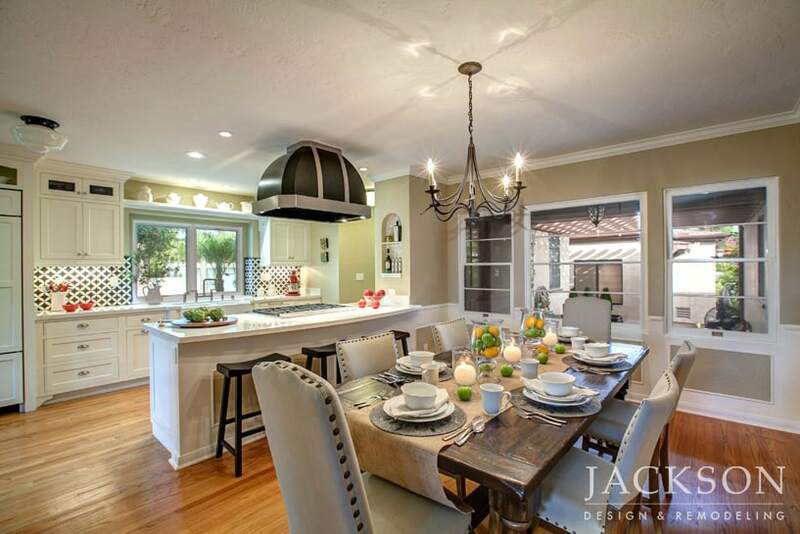 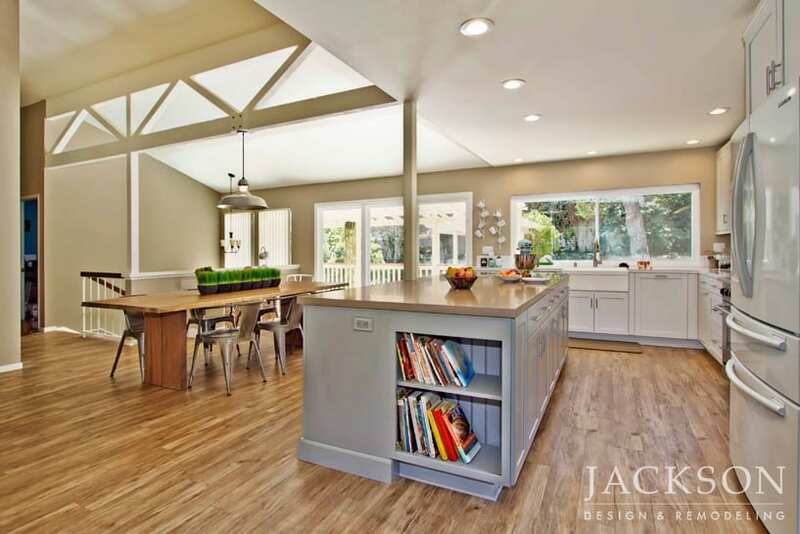 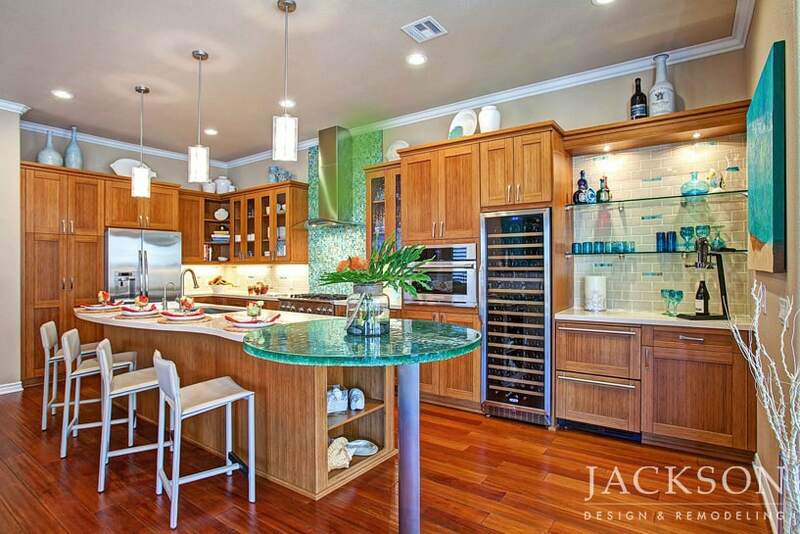 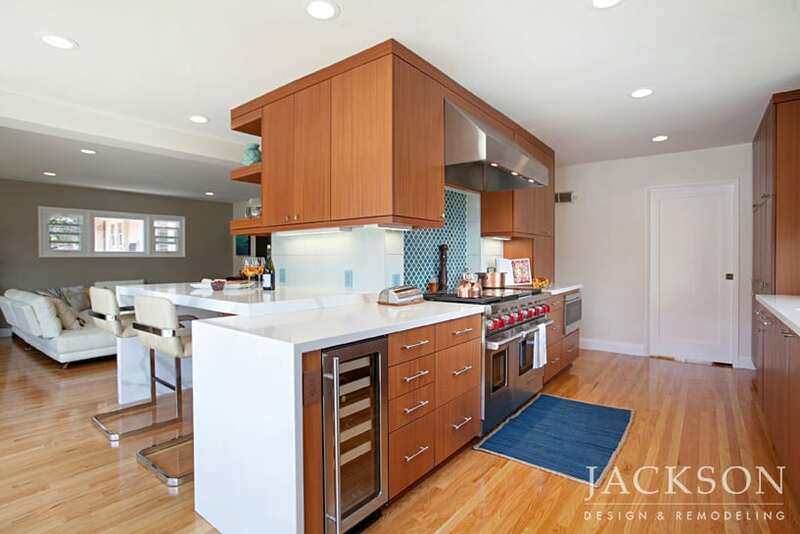 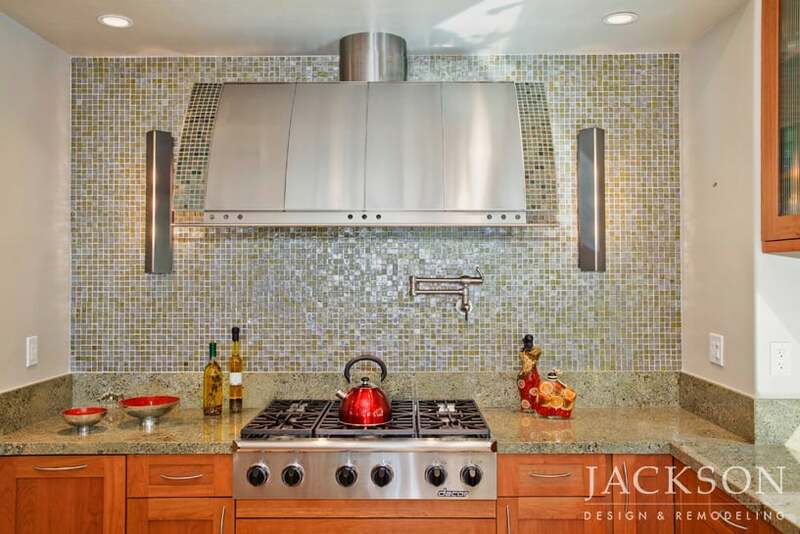 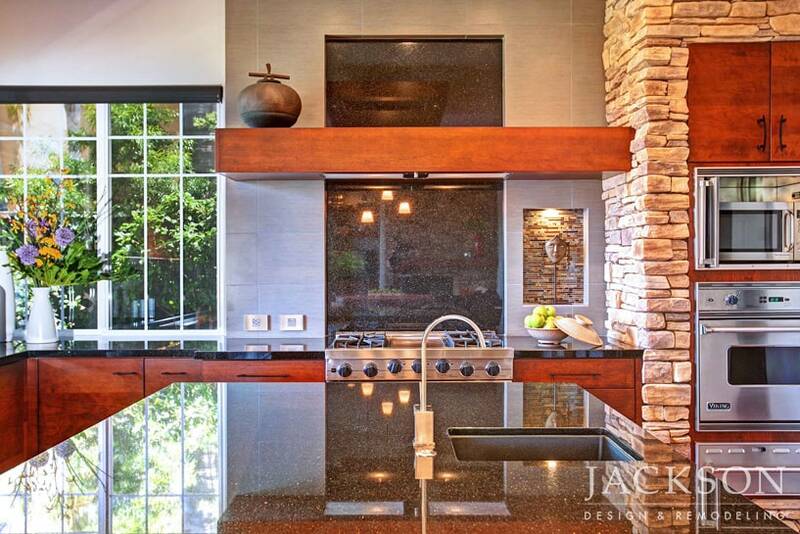 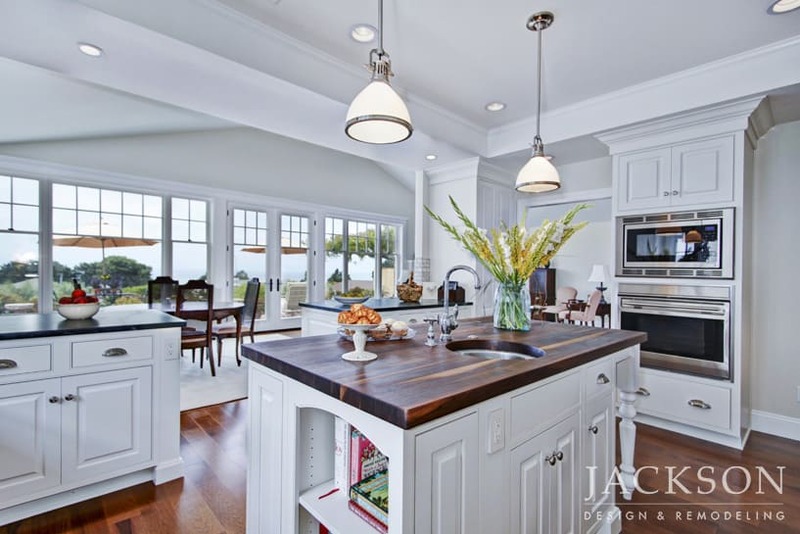 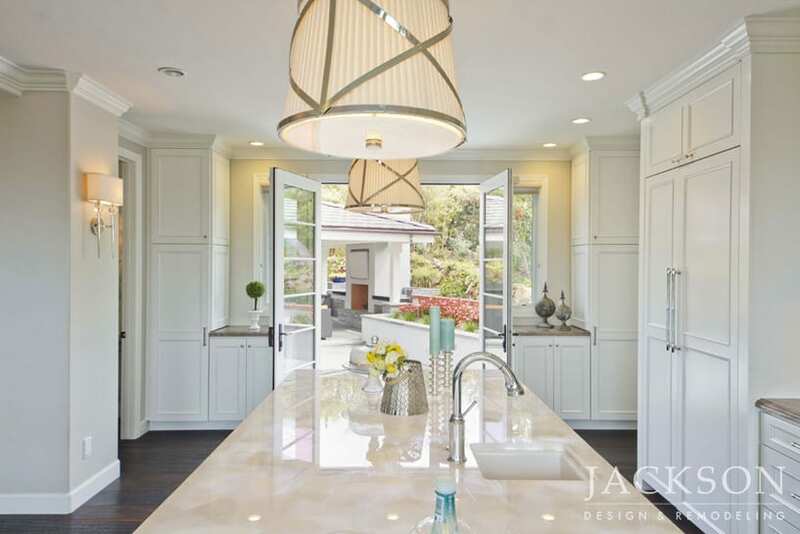 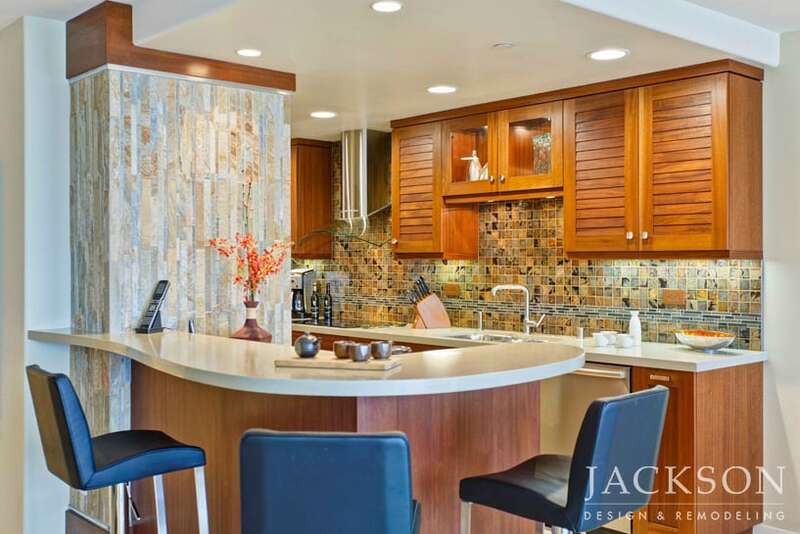 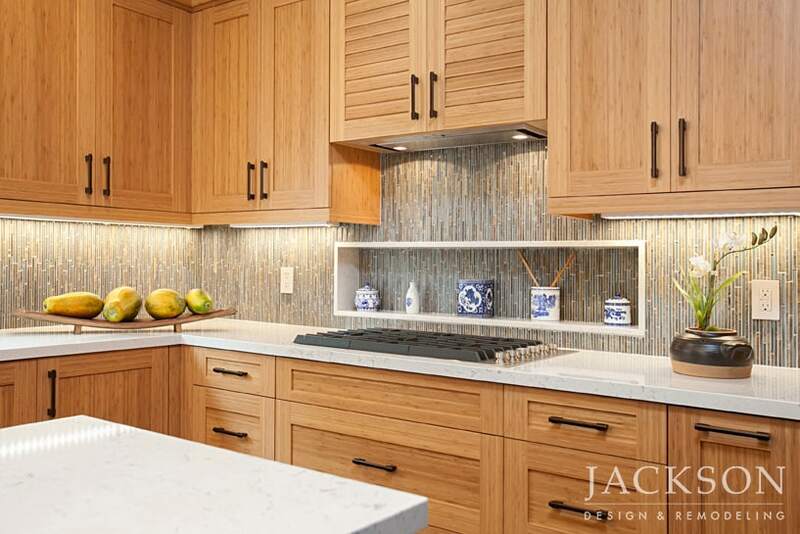 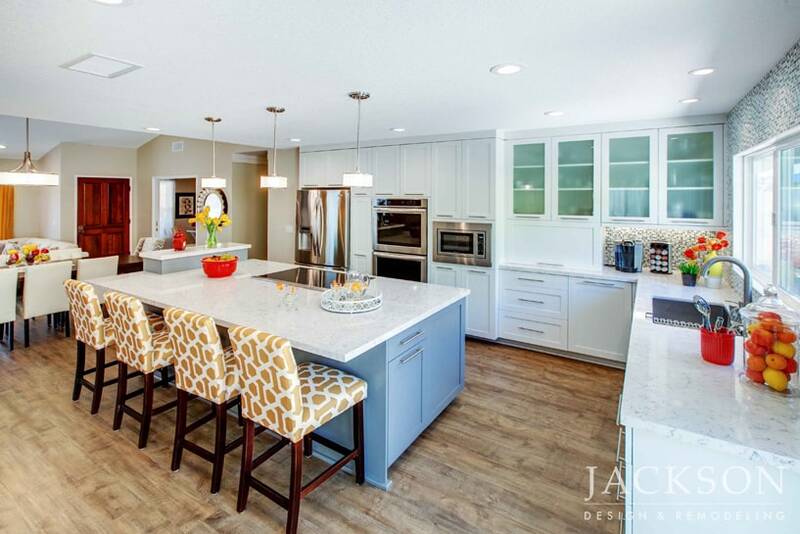 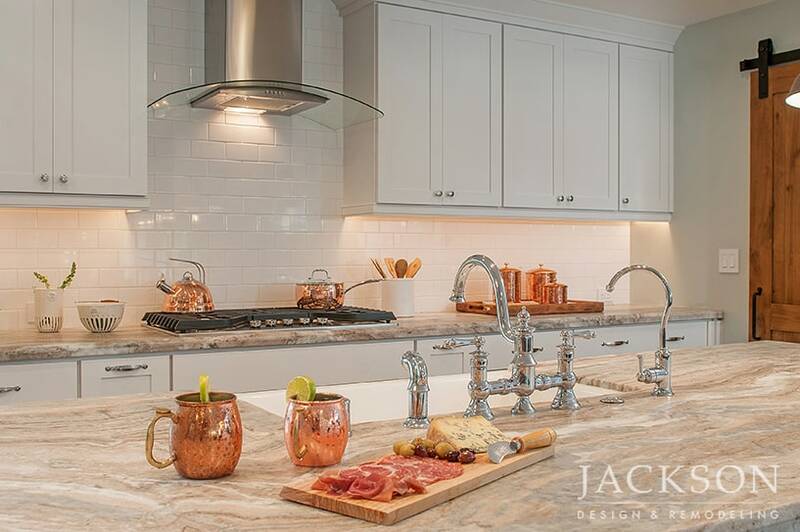 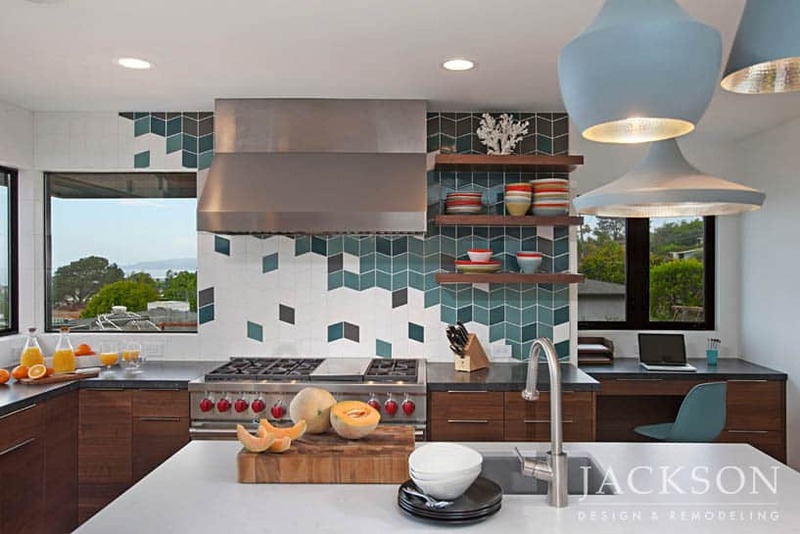 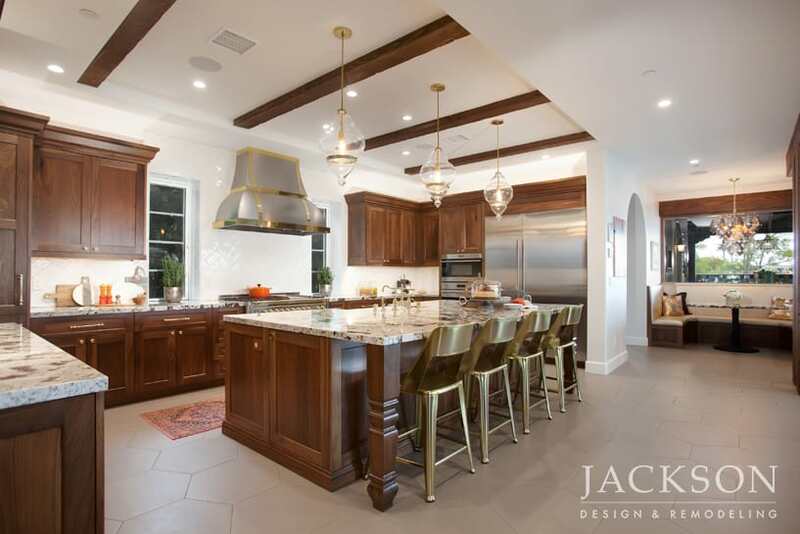 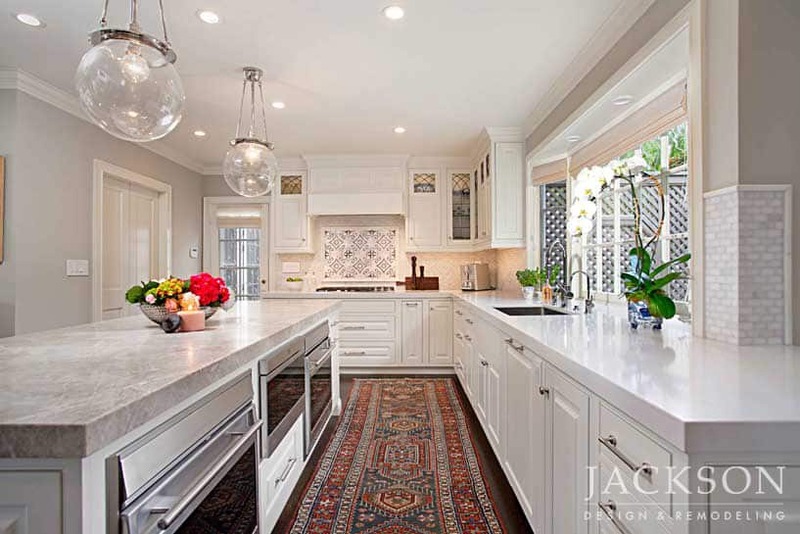 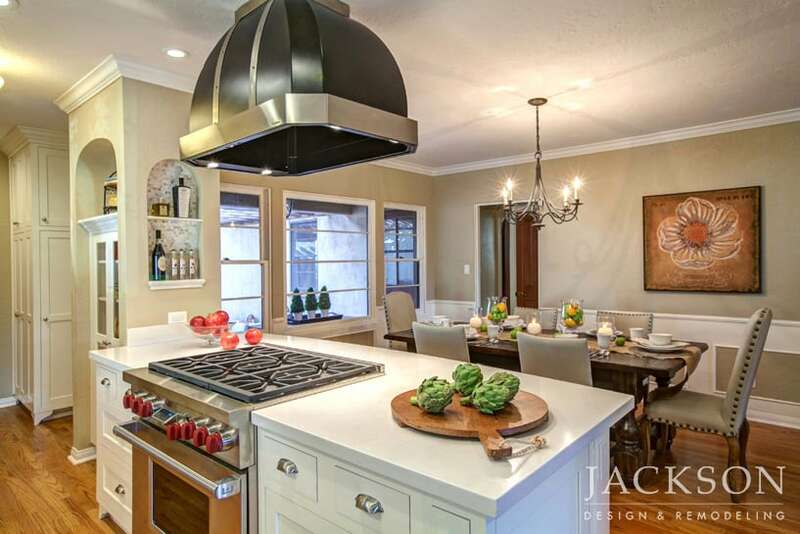 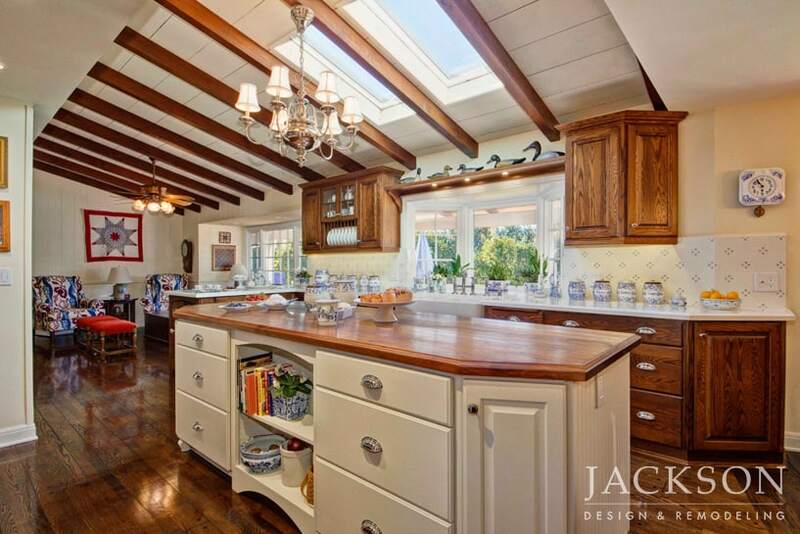 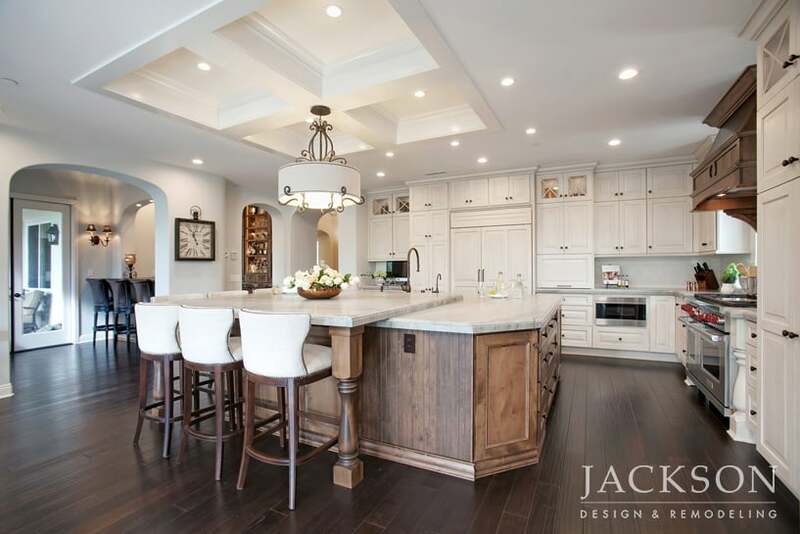 Jackson Design and Remodeling's award-winning designers and architects bring expertise, innovation and exceptional customer care to San Diego kitchen remodels and custom kitchens to make your custom kitchen the beautiful, functional heart of your home. 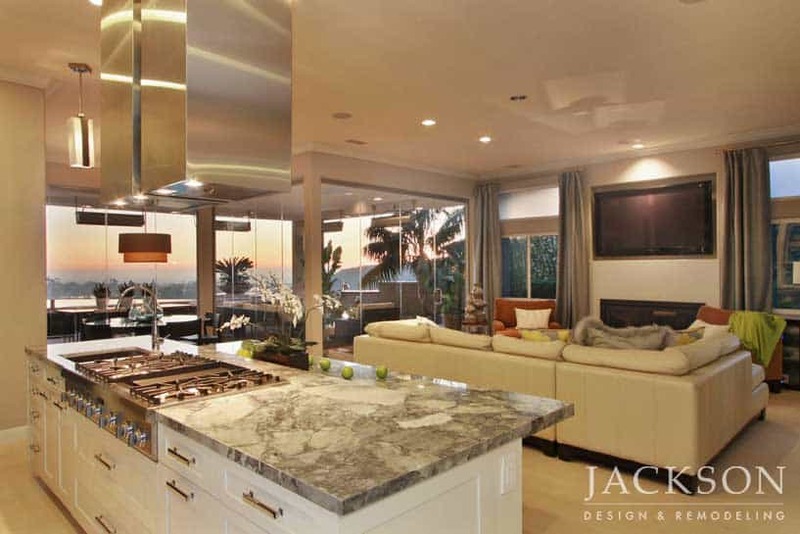 This magnificent kitchen expresses a graceful chic that fully embraces the room’s incredible views. 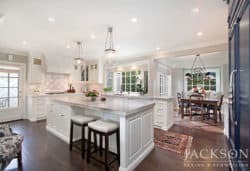 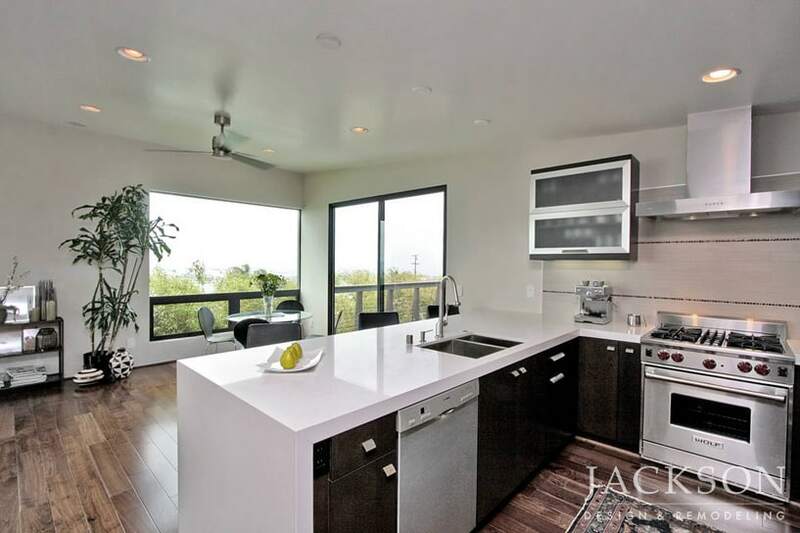 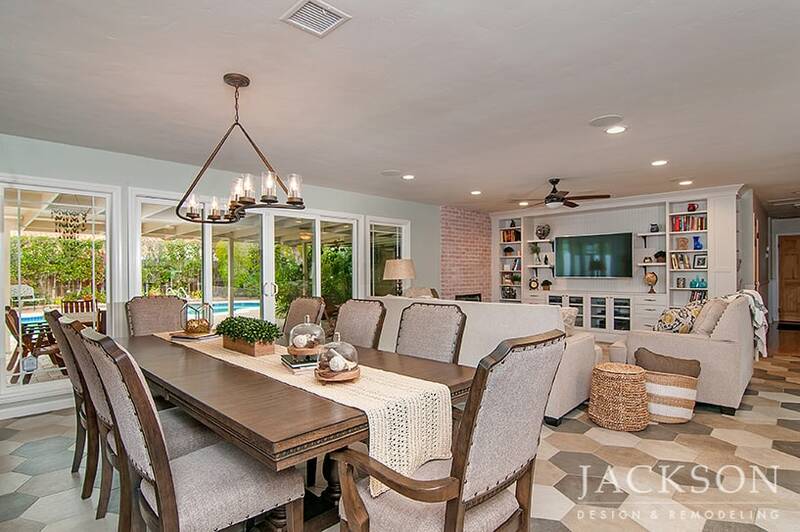 The open layout of this appealing kitchen connects to the rest of the home and to the beautiful outdoor surroundings. 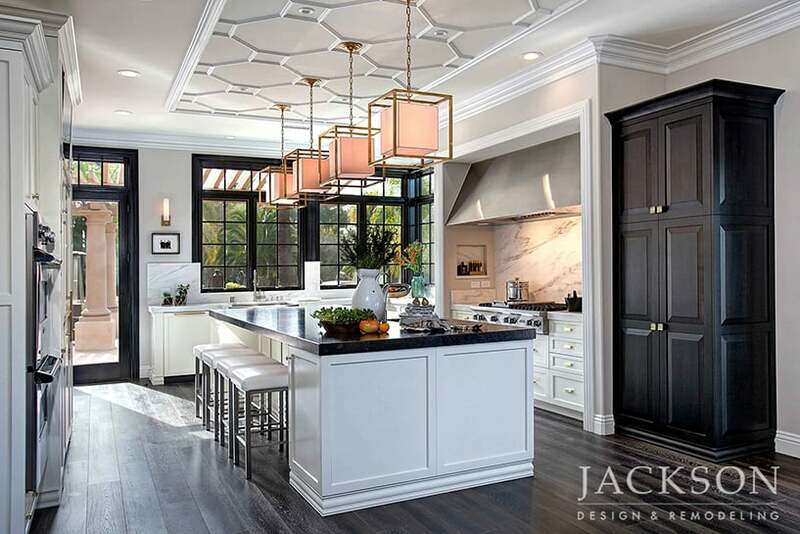 An abundance of light and air is grounded by natural textures, creating an engaging design for family life and entertaining. 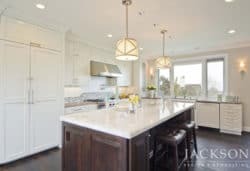 For a couple who fell in love with the view of this seaside home, their kitchen needed to accommodate both sophisticated entertaining and comfortable breakfasts with their two young children. 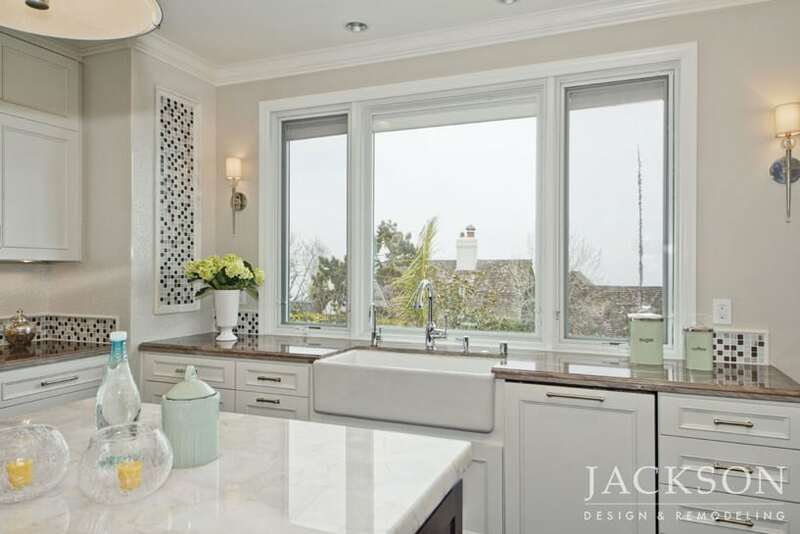 Resonating with classic coastal charm and a contemporary attitude, this kitchen’s stunning vista is a design centerpiece. 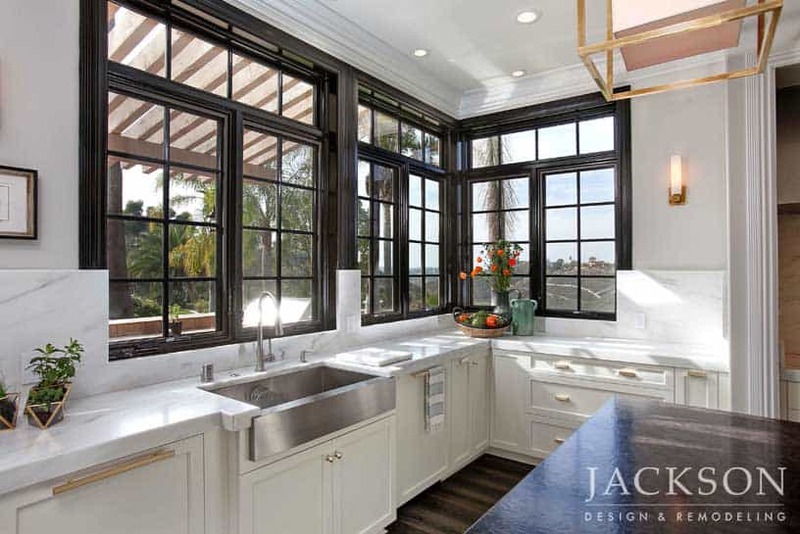 In a historical La Jolla home by acclaimed architect Thomas Shepherd, the kitchen was transformed to enhance family life while honoring the essential character of the original home. 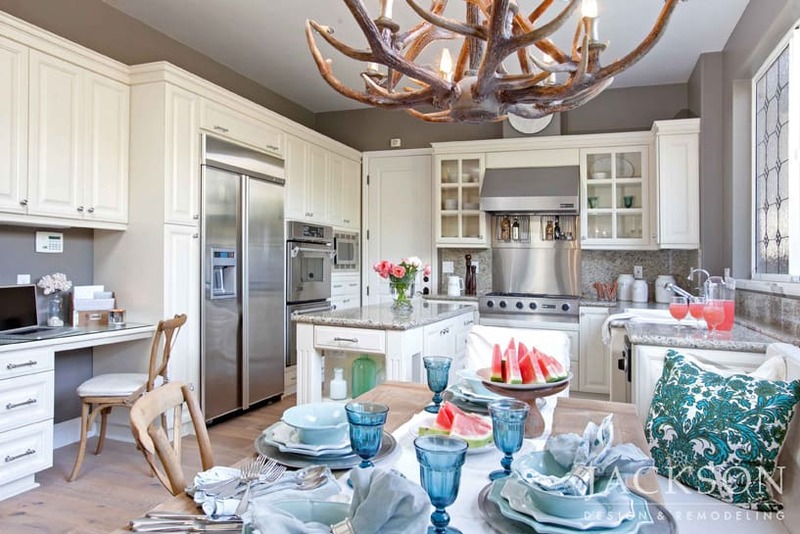 Fresh and inviting, this kitchen now brings ease, comfort, and liveliness to every gathering. 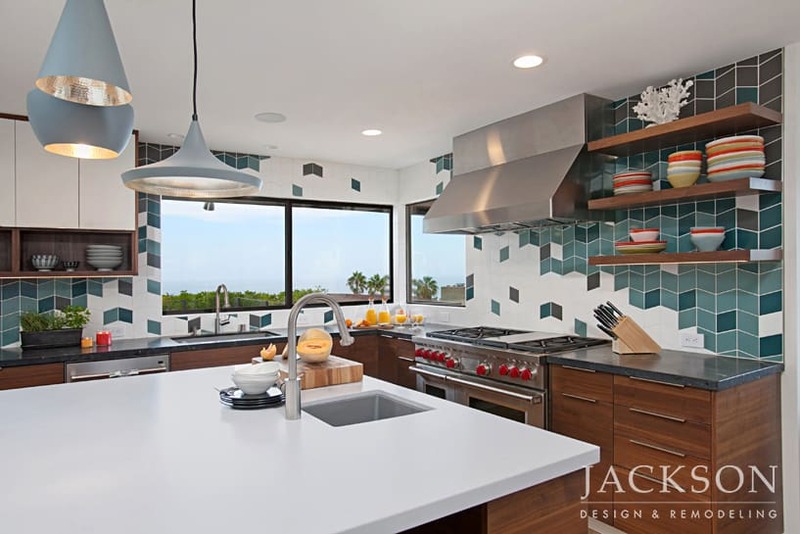 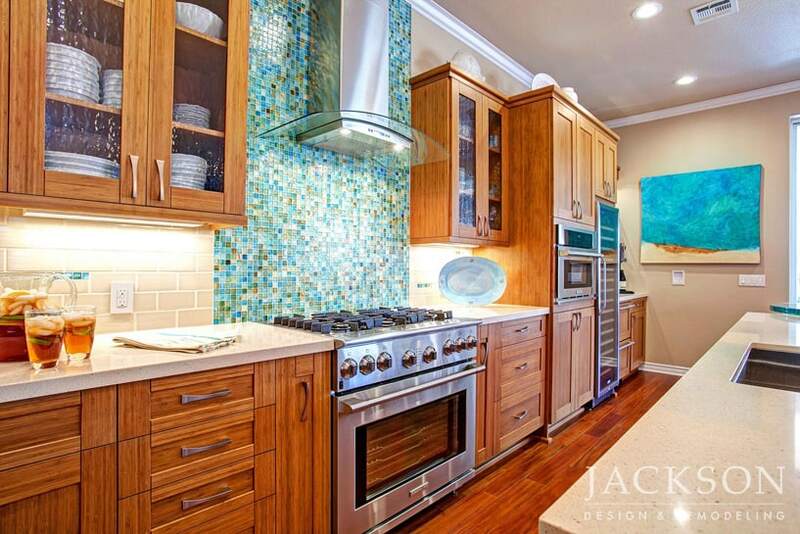 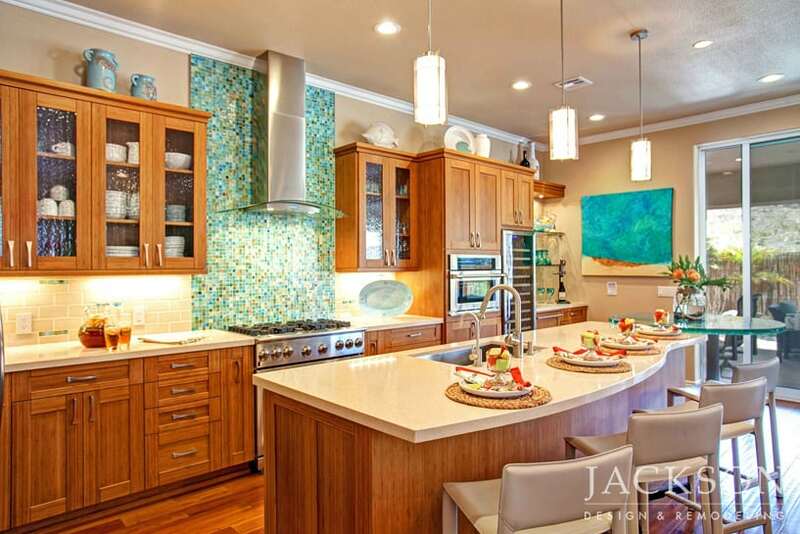 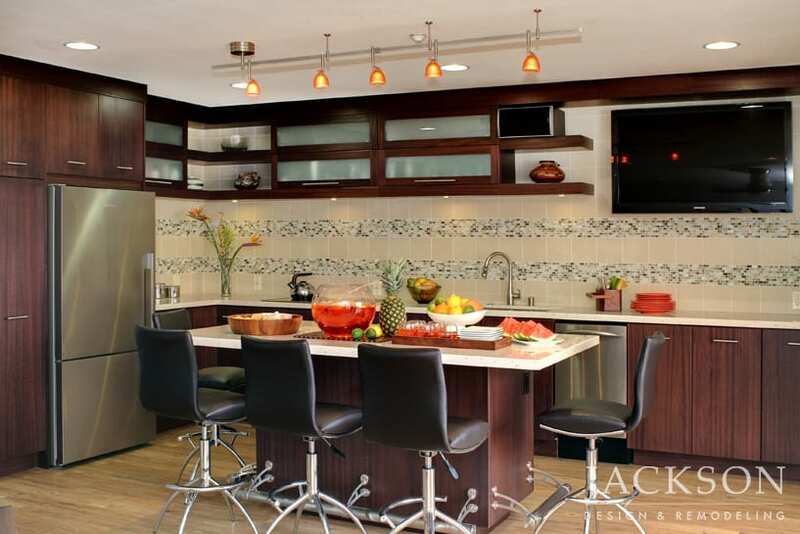 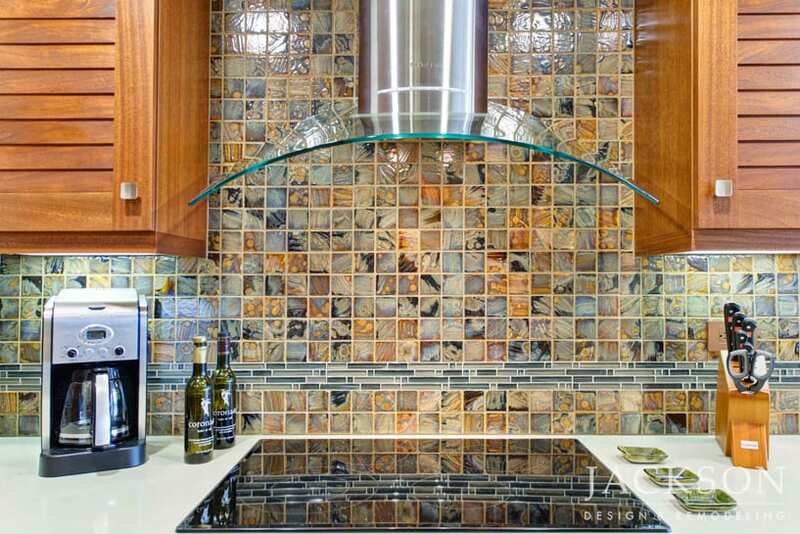 Colors and textures evocative of sunsets over the nearby ocean vibrate in this artistic kitchen. 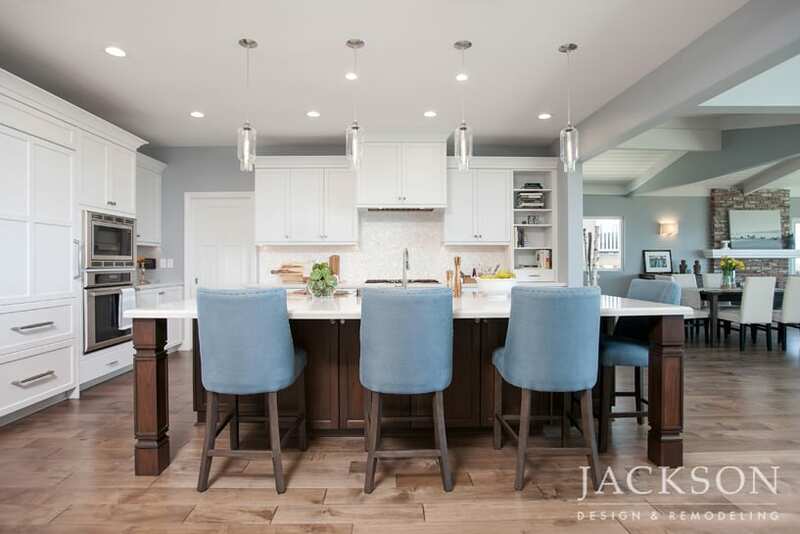 An open space designed for a family who loves to cook and spend time together, the kitchen balances a sense of ease and comfort along with a bold style that’s unafraid to stand out. 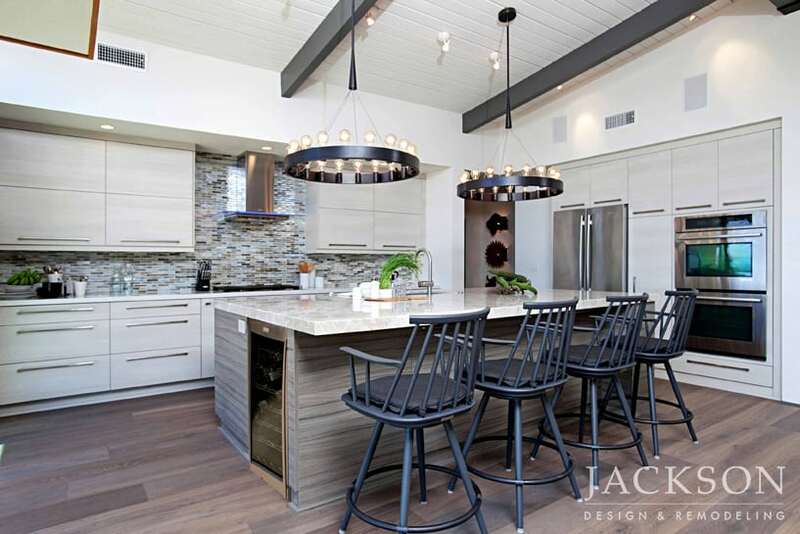 A couple with three teenagers wanted the kitchen in their Carmel Valley home to communicate their sense of style and to accommodate their love for cooking and entertaining. 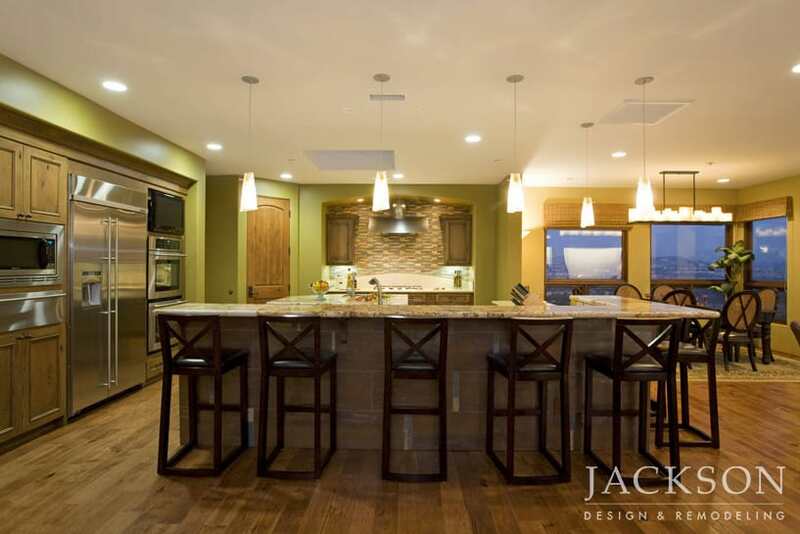 The design now encompasses the family room and a new bar. 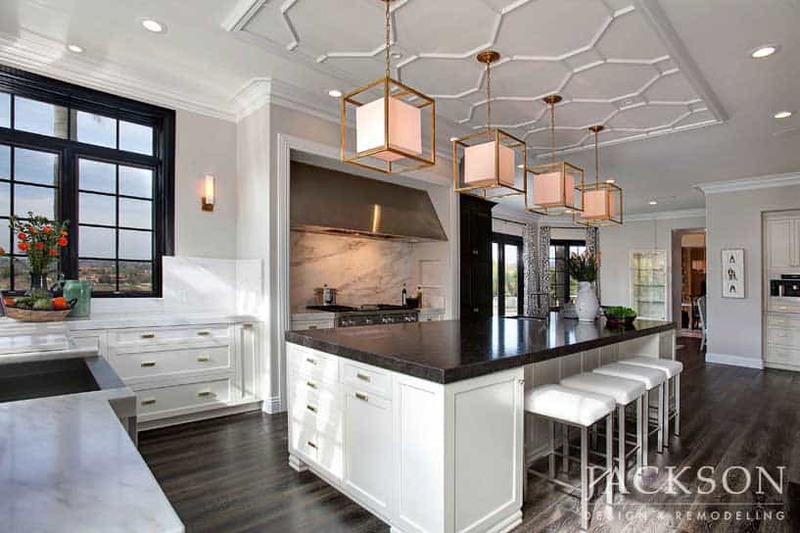 Dramatic coffered ceilings add definition and bring human scale to the magnificence of the surroundings. 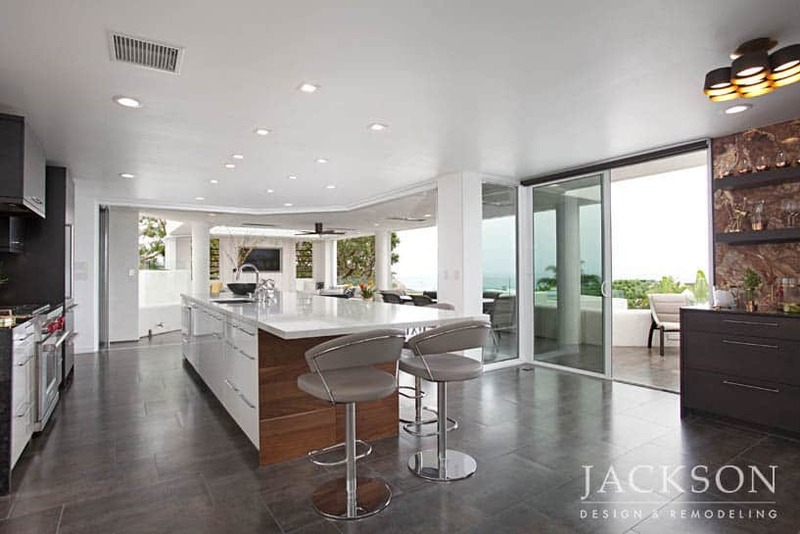 The kitchen in this contemporary home with significant architectural integrity was re-imagined as a space not constricted by the typical elements of a “kitchen.” The new design was intentionally planned with no protrusions to emphasize openness to indoor/outdoor living and make the amazing ocean views a focal point. 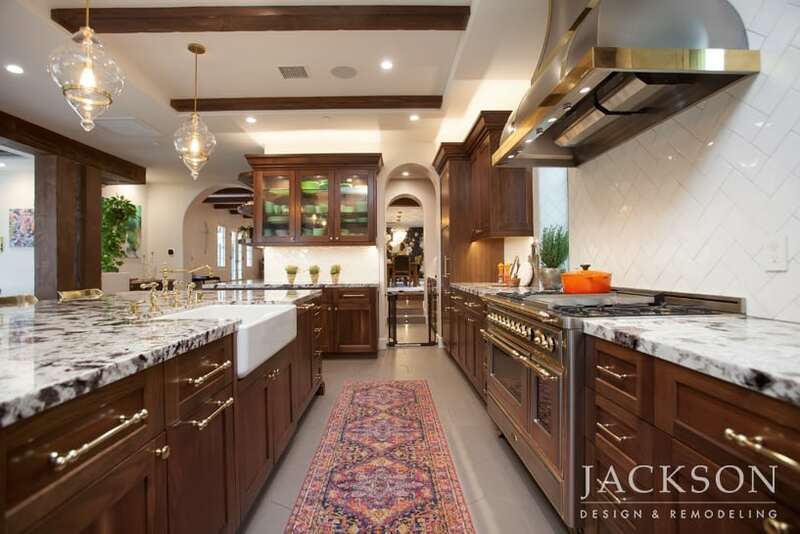 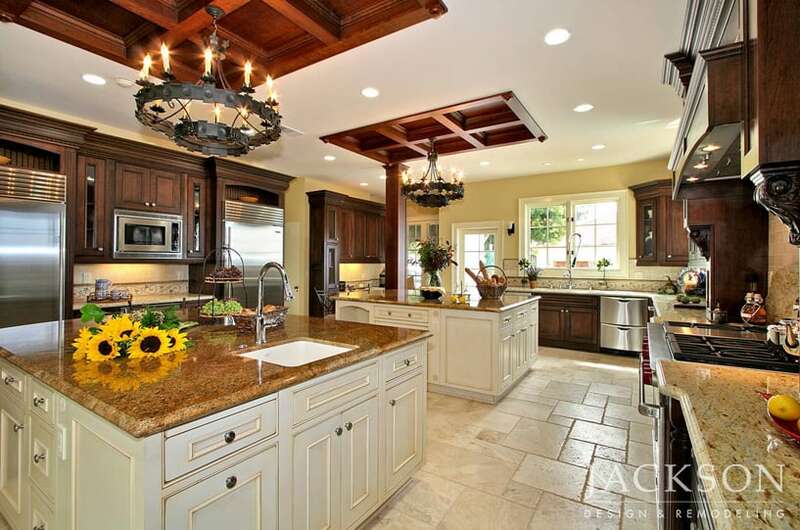 Dramatic in scale and substance, this kitchen with elements of traditional luxury and Tuscan-inspired details is designed to inspire for a lifetime. 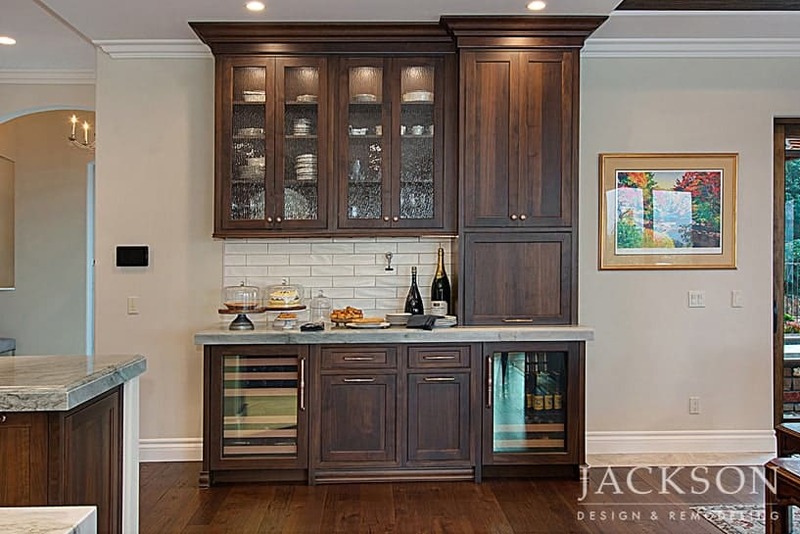 Part of a new home built as the clients’ perfect retirement getaway, the kitchen was meticulously customized to enhance their lives with comfort and beauty. 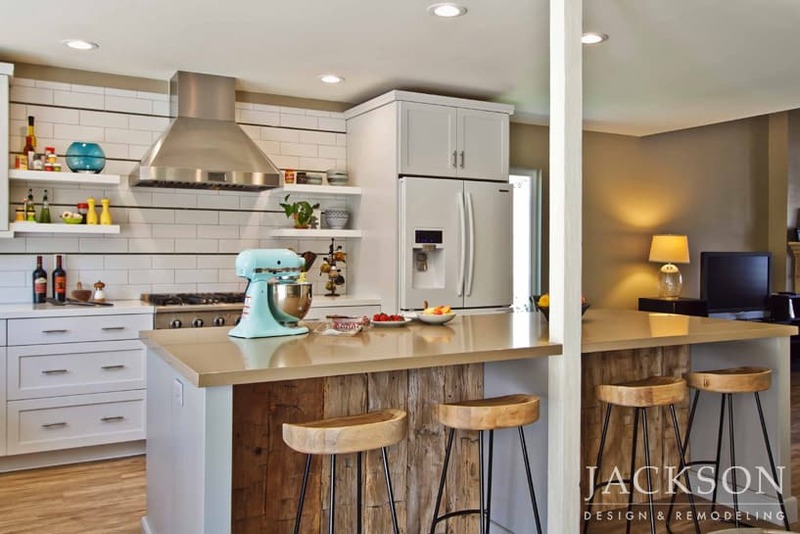 The idea for this appealing space started with a husbands desire to give his wife the kitchen of her dreams, a welcoming and highly functional space for an enthusiastic cook. 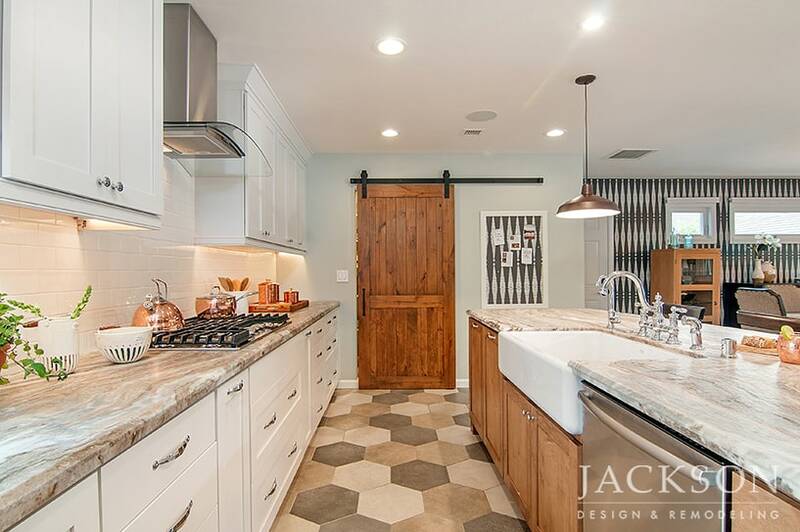 Now open to the living and dining areas, this modern kitchen delights the senses with natural light, interesting textures, and farmhouse details. 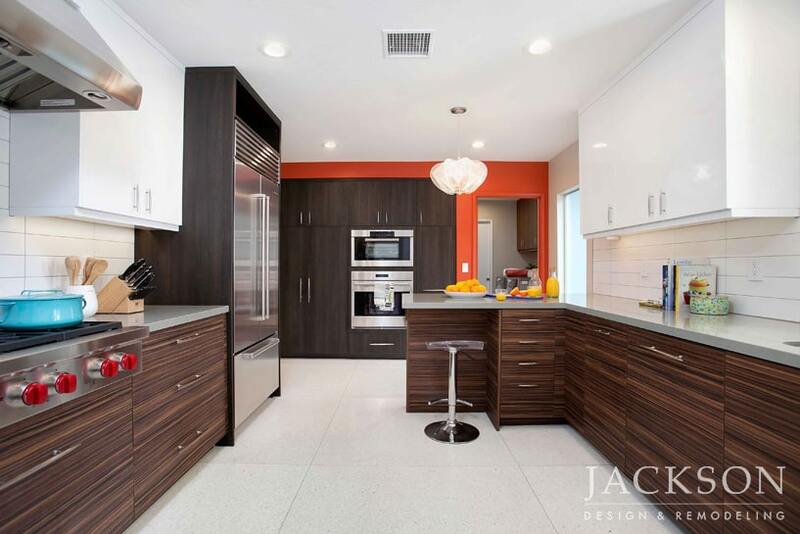 The family living in this house listed on the San Diego Historical Registry of Homes wanted to experience modern convenience while retaining their home’s design integrity. 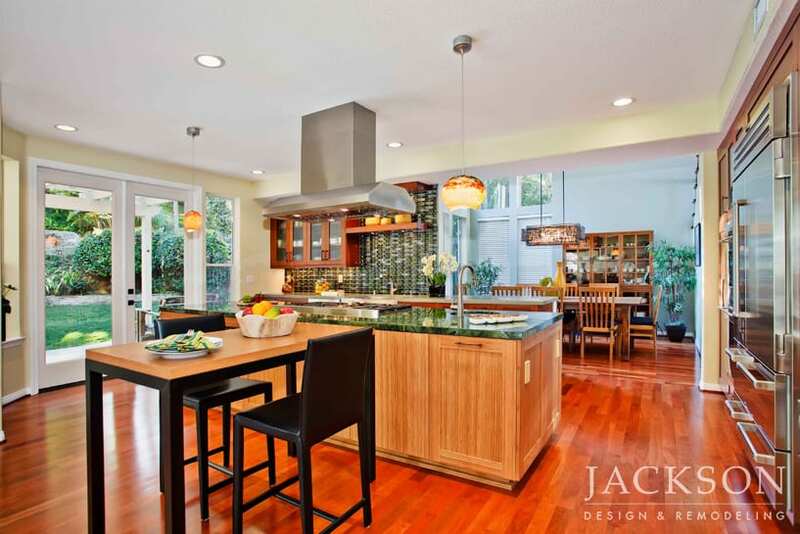 This multiple award-winning kitchen achieves those goals with enduring style. 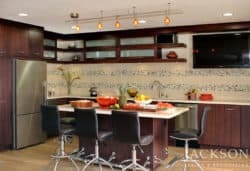 The clients for this remodel were a young couple with three children. 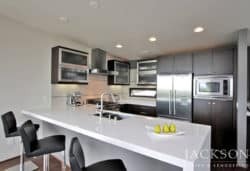 The husband has been in a wheelchair for most of his life. 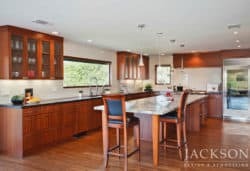 This multiple award-winning kitchen includes many universal design features while carefully avoiding a clinical appearance. 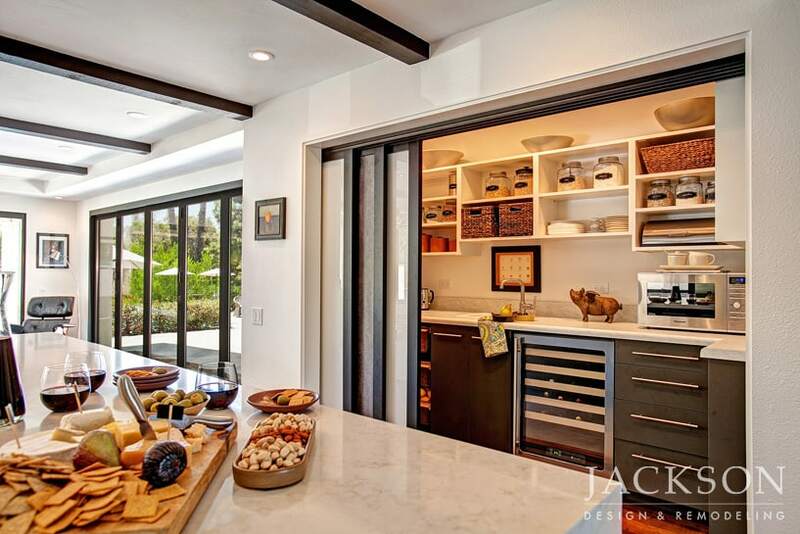 With an exterior hallway removed, this kitchen is full of light and circulation and is now naturally connected to a courtyard and outdoor kitchen. 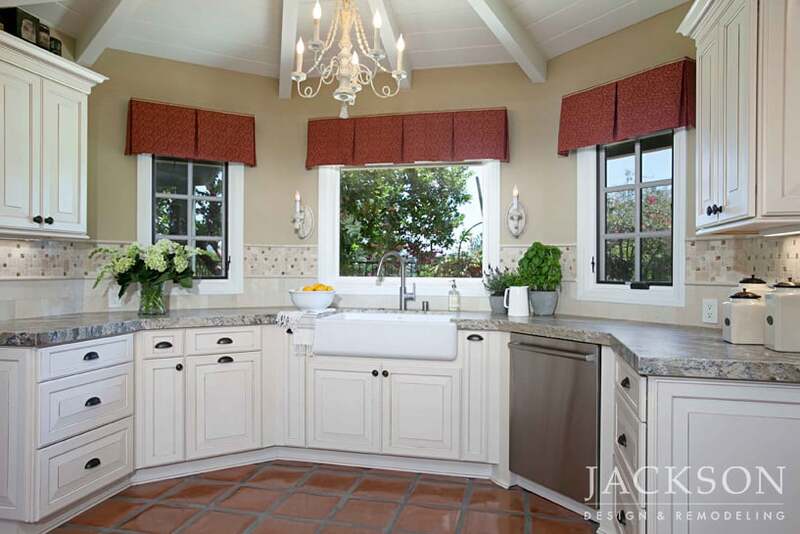 The design is exquisitely simple and clean, while retaining a strong sense of tradition. 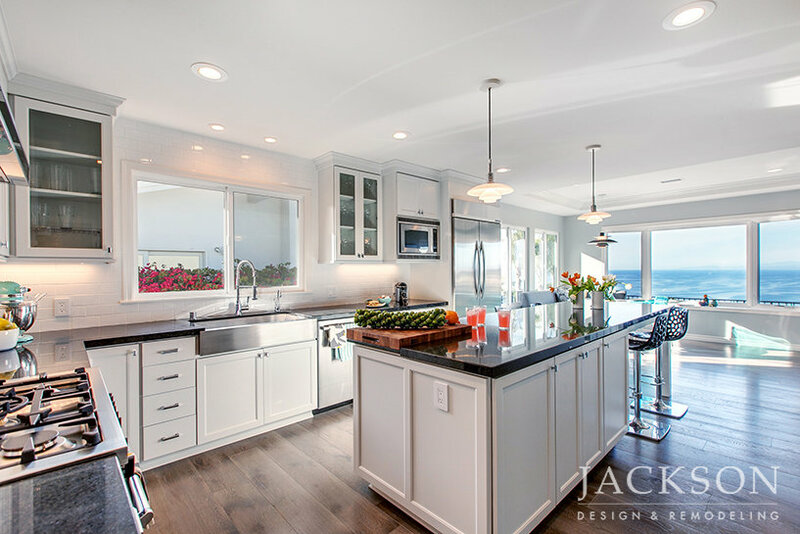 After removing upper cabinetry and completely redesigning the space planning of this kitchen in a beachside home, unobstructed ocean views now create a sense of fresh expansiveness. 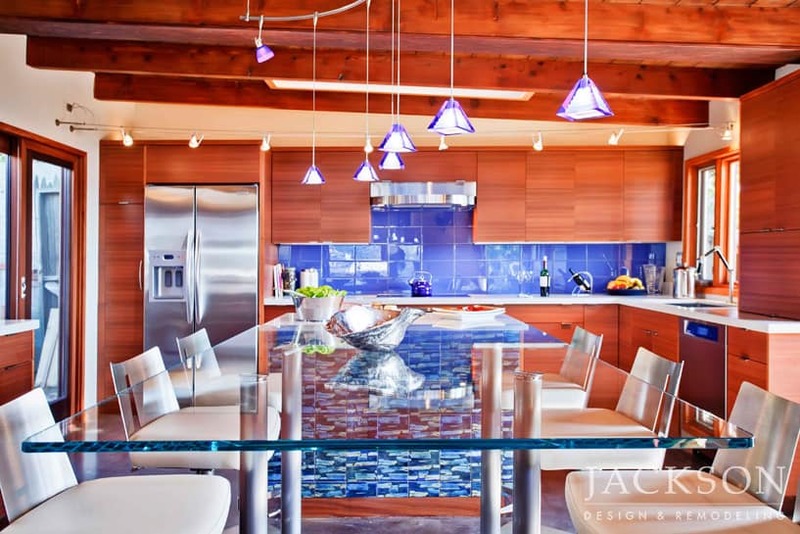 Rich natural woods, gleaming white surfaces, and vividly colored elements are skillfully balanced. 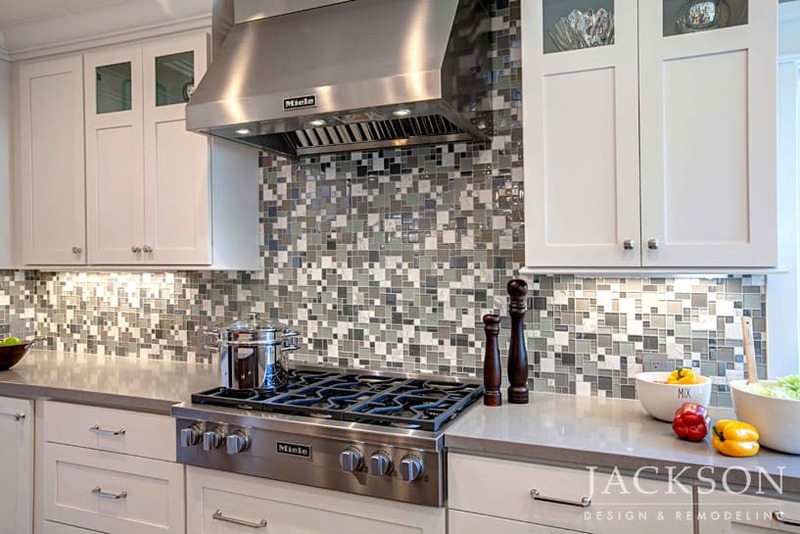 The meticulously custom designed tile backsplash is a truly one-of-a-kind idea that was a joyful collaboration between designer and client. 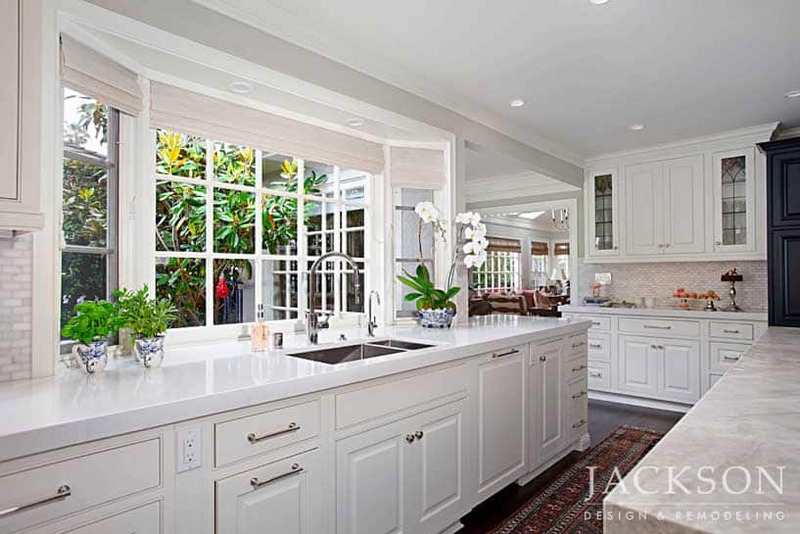 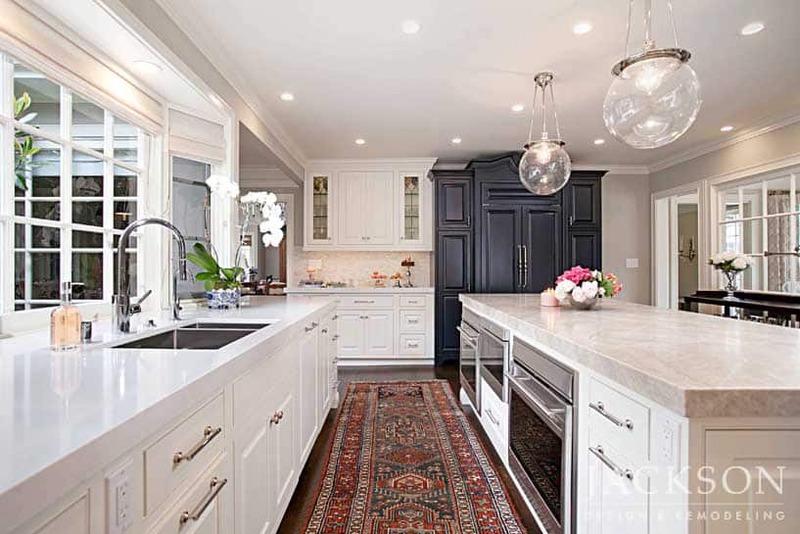 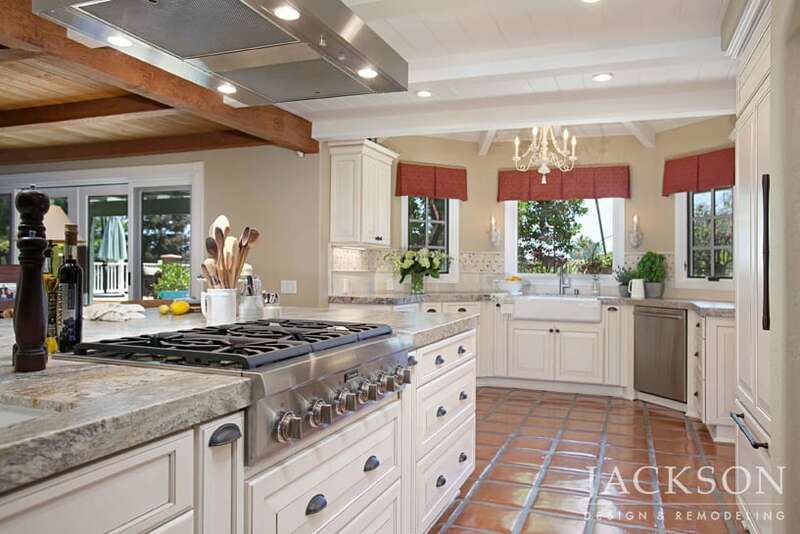 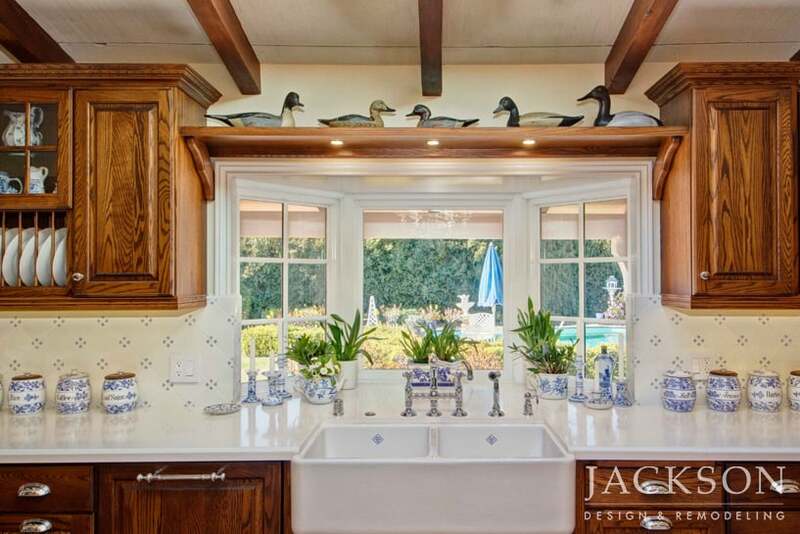 Along with several other awards, this refreshing interpretation of Colonial style on the California coast was named Best Kitchen by the readers of Architectural Digest in their 2013 Before + After: Reader Kitchens contest. 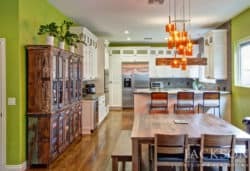 Accustomed to a European way of life, a couple who moved to a San Diego neighborhood with their two children wanted to dramatically change their suburban kitchen while retaining a sense of place. 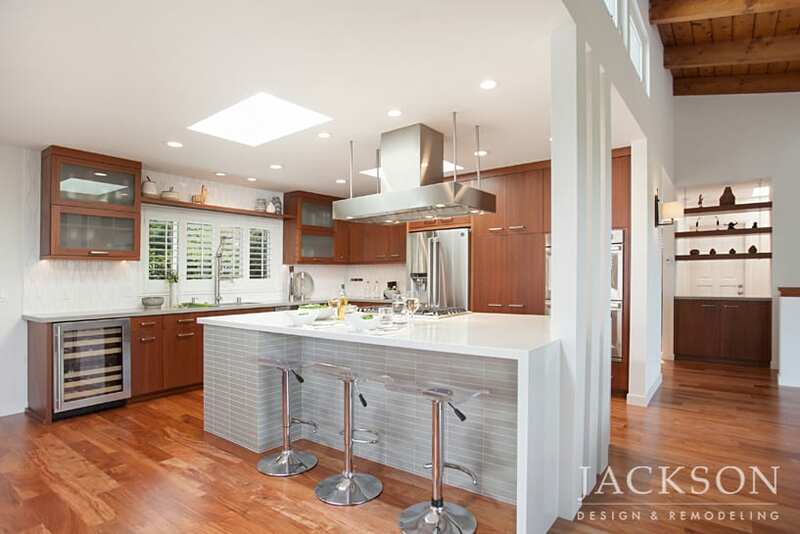 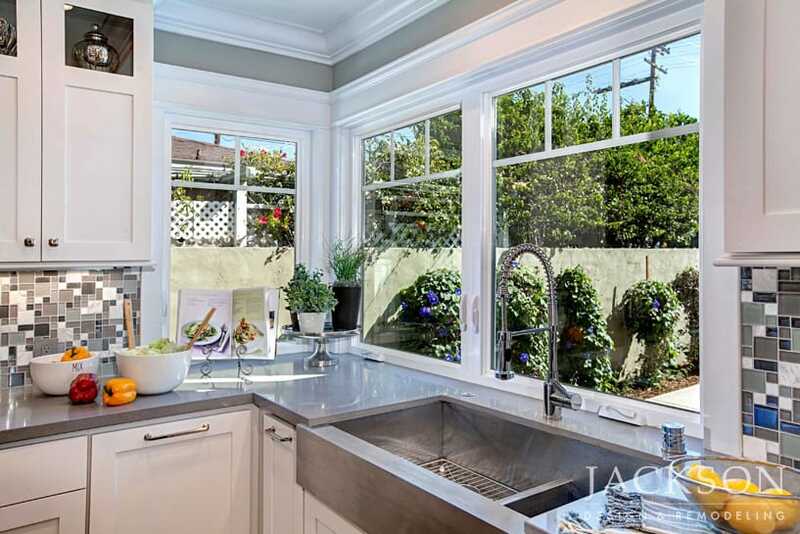 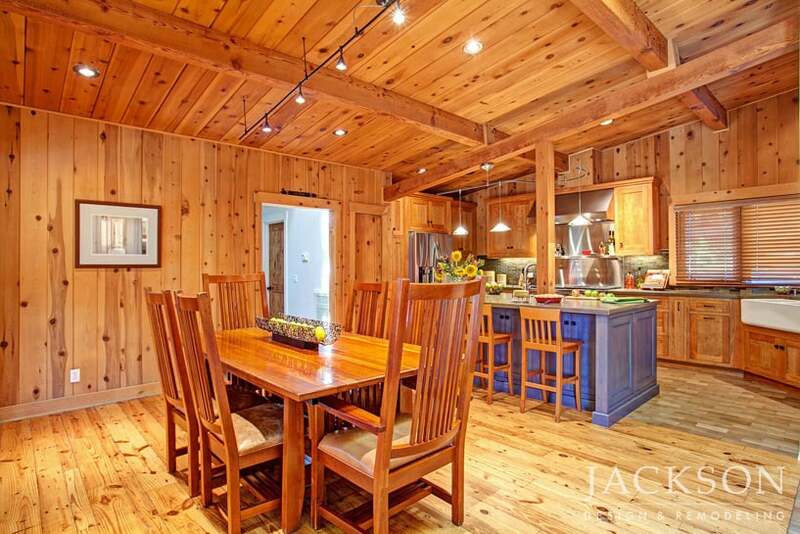 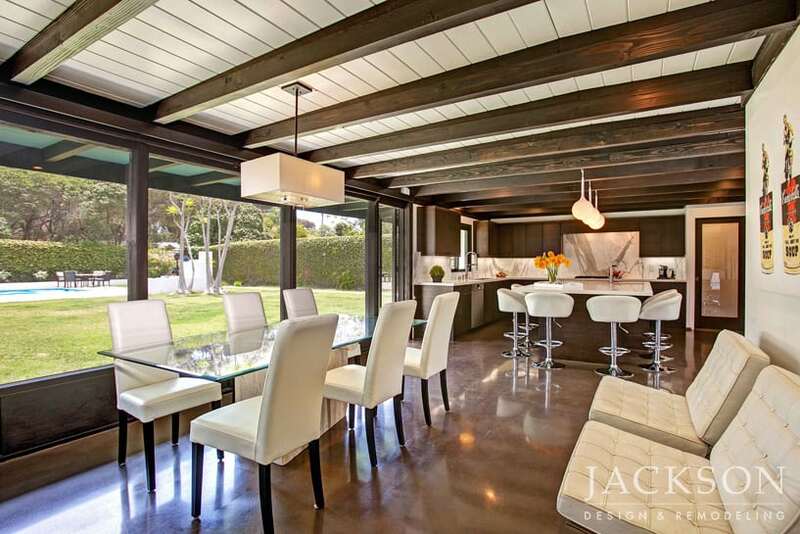 Now open and full of light, this kitchen and living space beautifully inhabits its surroundings. 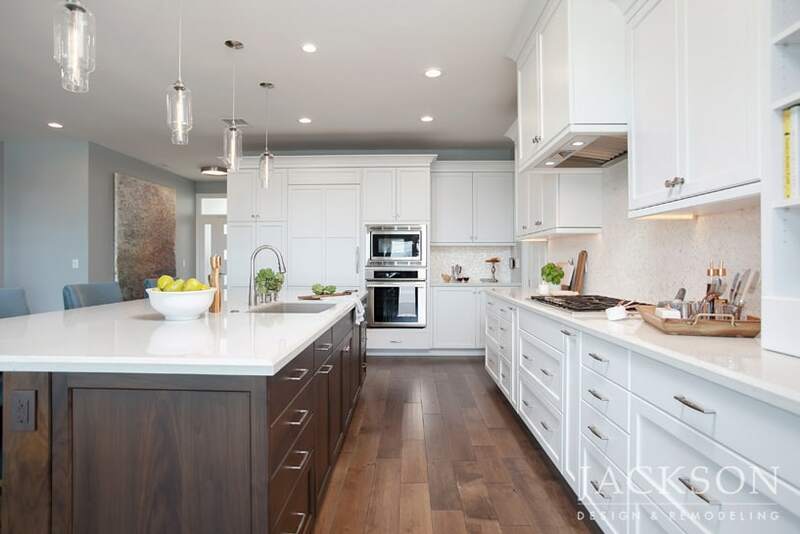 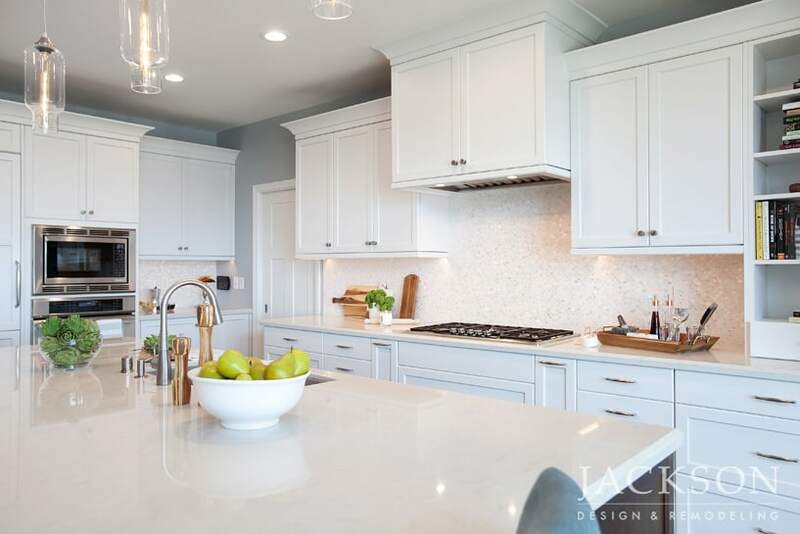 Now open to an expansive living space, this kitchen in a seaside home is a dazzling combination of modern and traditional elements with an emphasis on clean and simple harmony. 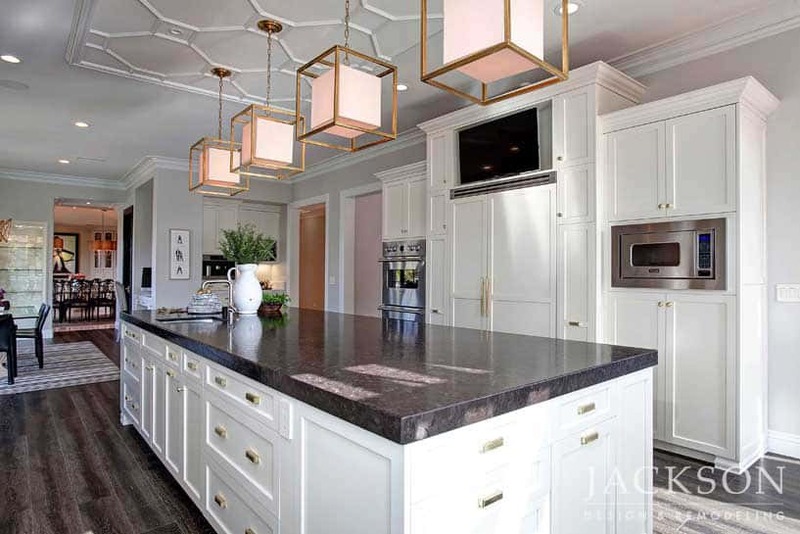 In the kitchen of a historical home, timeless Shaker style cabinetry is balanced with gleaming antique brass and formal details for a combination of rich warmth and elegance. 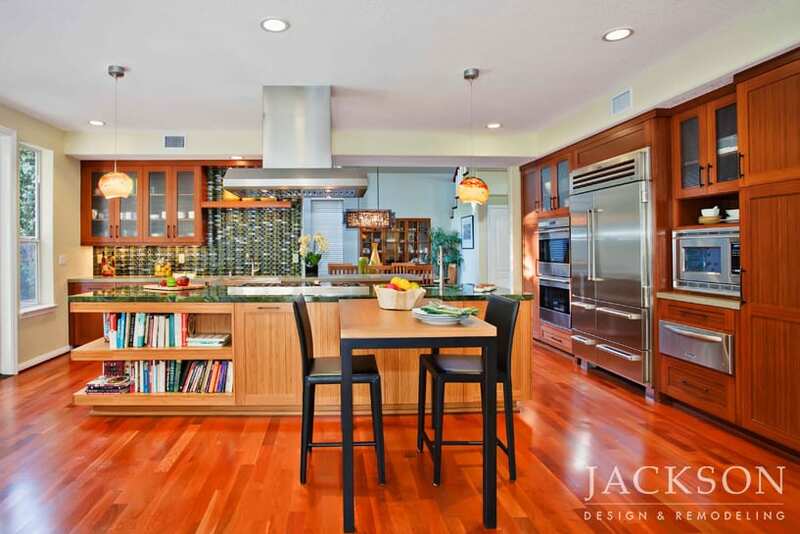 A compelling composition of Asian and contemporary themes gives this kitchen its memorable style. 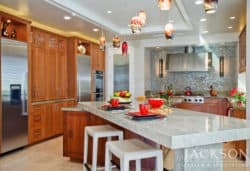 The meticulous blend of visual and textural elements creates an elegant, welcoming atmosphere rich with sophistication. 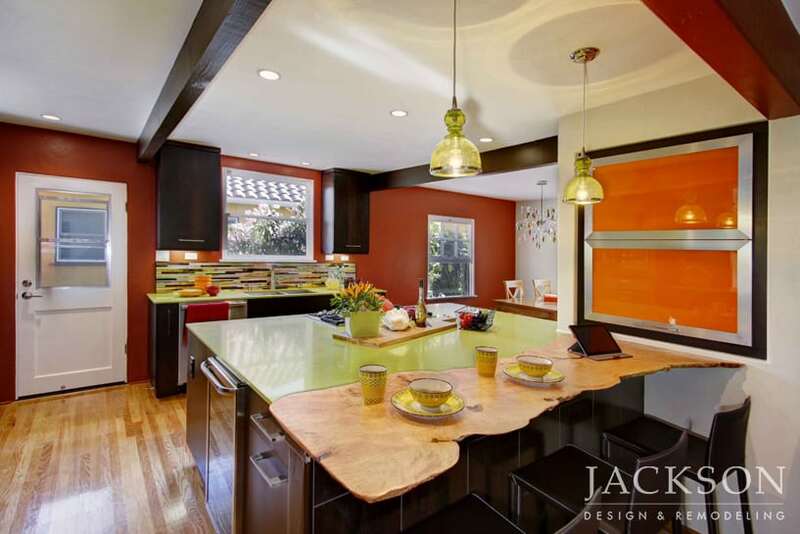 This historic Kensington home is graced with a Spanish design influence. 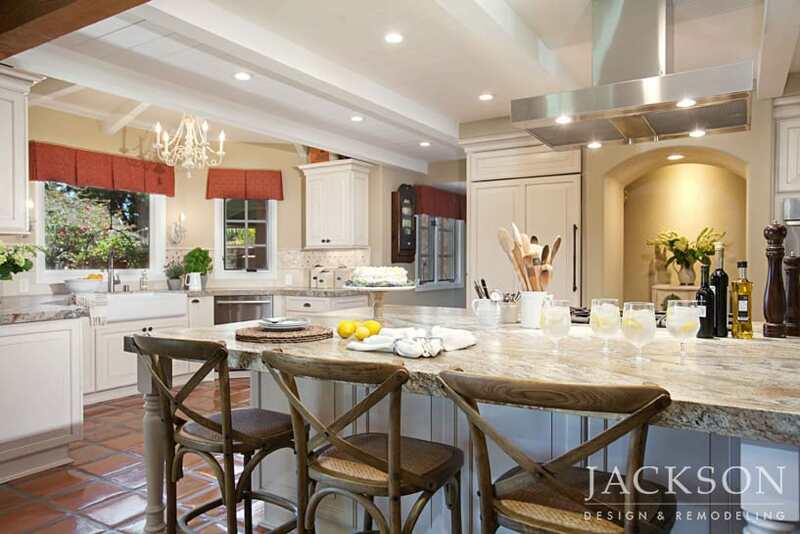 The clients wanted to transform their kitchen while honoring their home’s character. 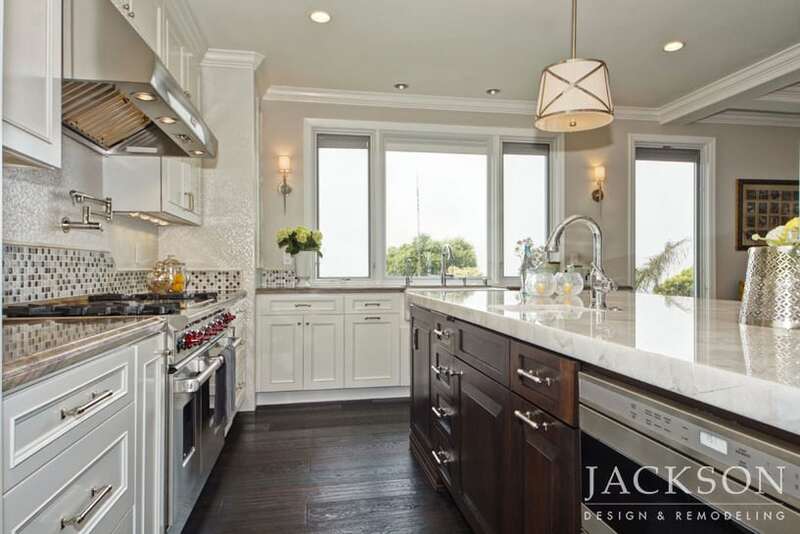 The design blends hints of European charm with a modern sensibility. 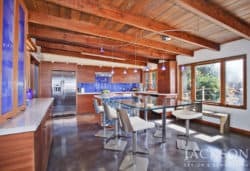 Panoramic views of Mission Bay and the Pacific Ocean from a hilltop home built in the 1960s are central in this magnificent Mid-Century modern kitchen. 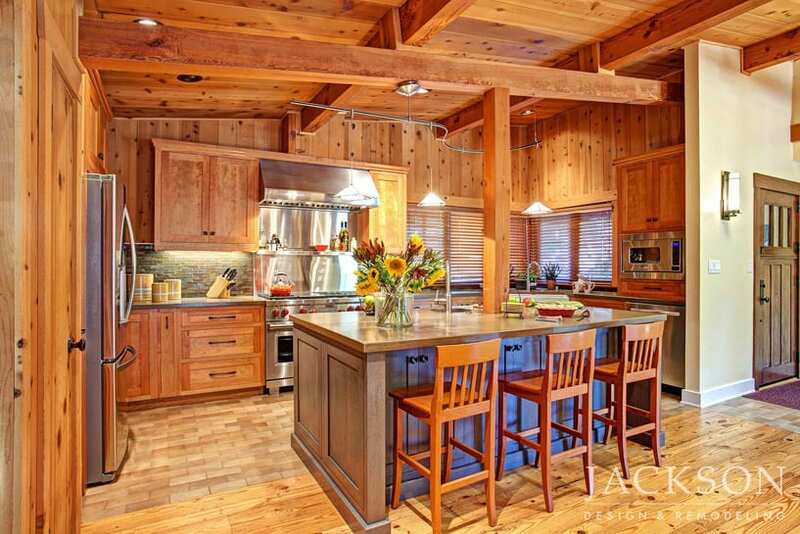 Bold scale and compelling rustic elements define the kitchen in an airy expanse. 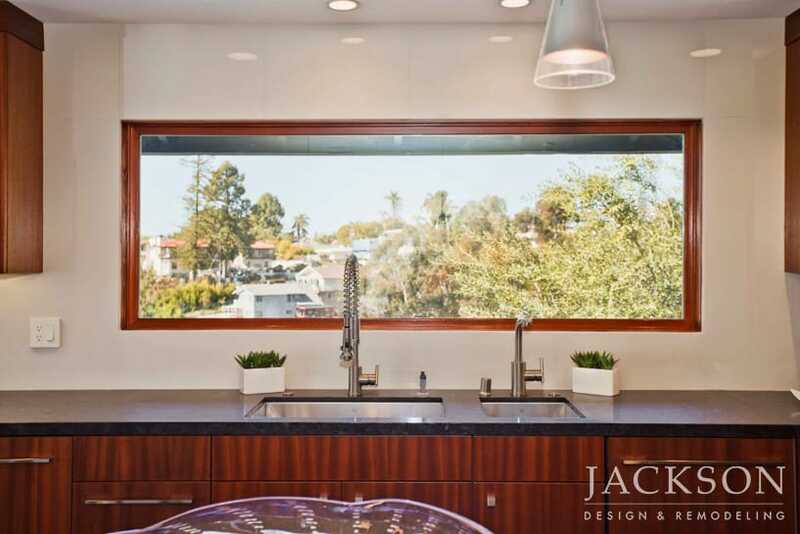 The design maximizes and frames the view from every vantage point. 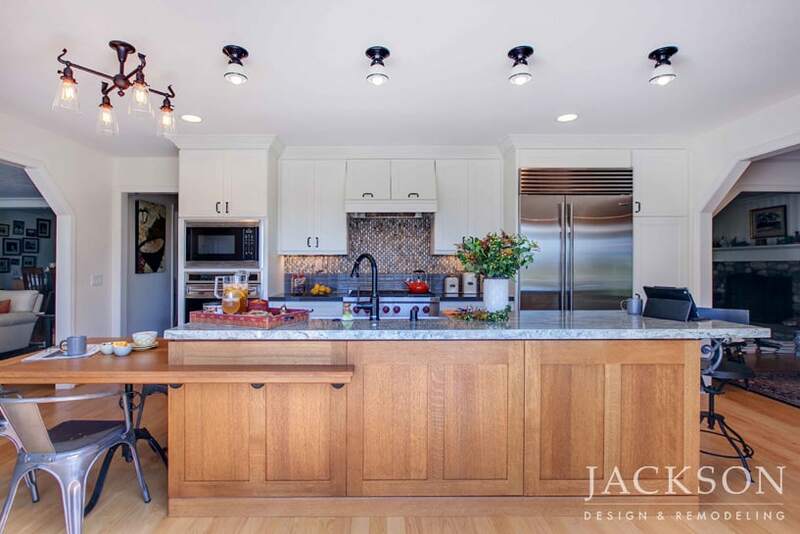 Thoughtful architectural planning dramatically opened the space in this 1930’s home to encompass the kitchen, dining and living areas into one unified expanse. 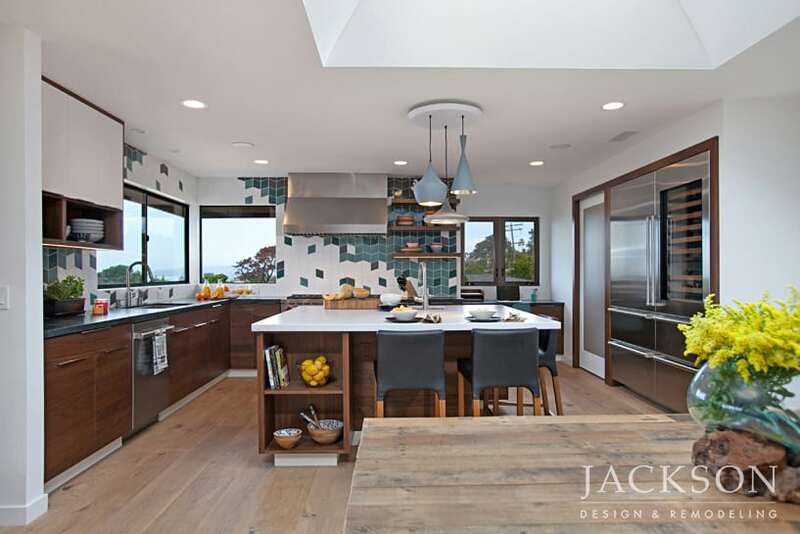 Designed to promote family togetherness in an expansive space, this award-winning design is an artful interpretation of California Coastal aesthetics, combined with contemporary notes and softer elements inspired by the Arts and Crafts movement. 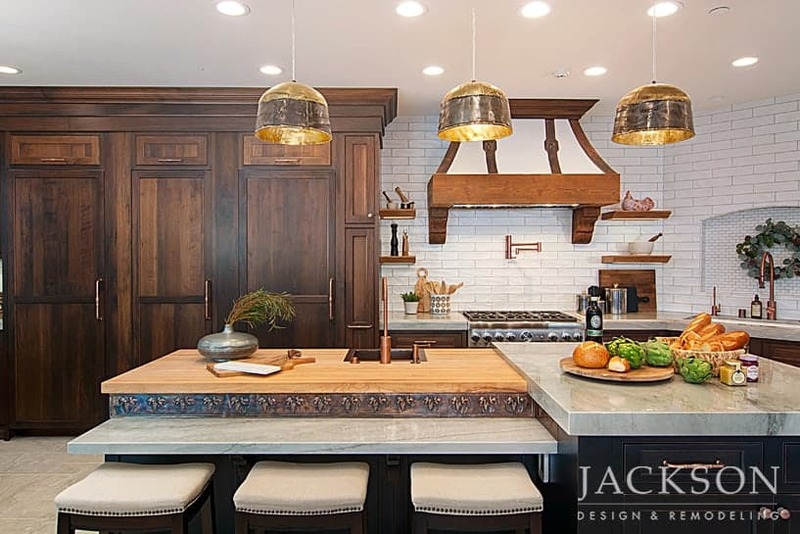 A tongue and groove ceiling with exposed distressed wood beams sets the stage for this stunning kitchen where rustic design elements meet modern functionality. 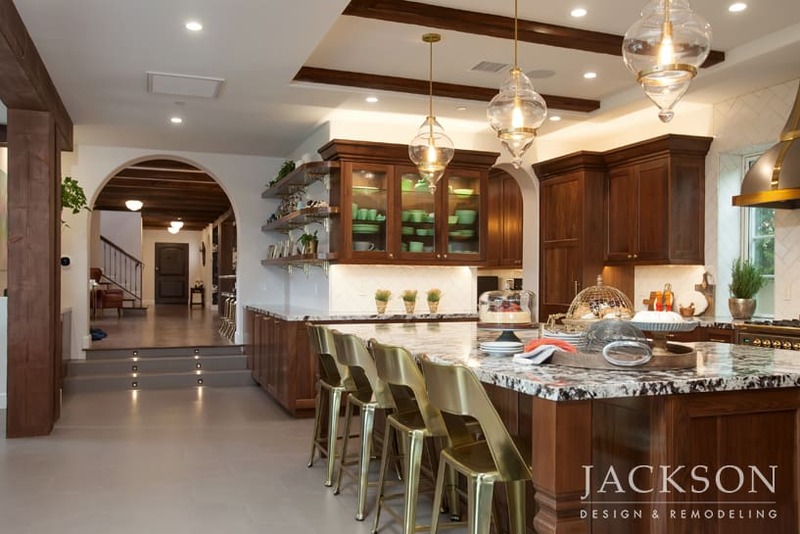 Stacked stone, textured woods, hand-painted tiles and wrought iron chandeliers create a welcoming, luxurious space inspired by Sicilian villas. 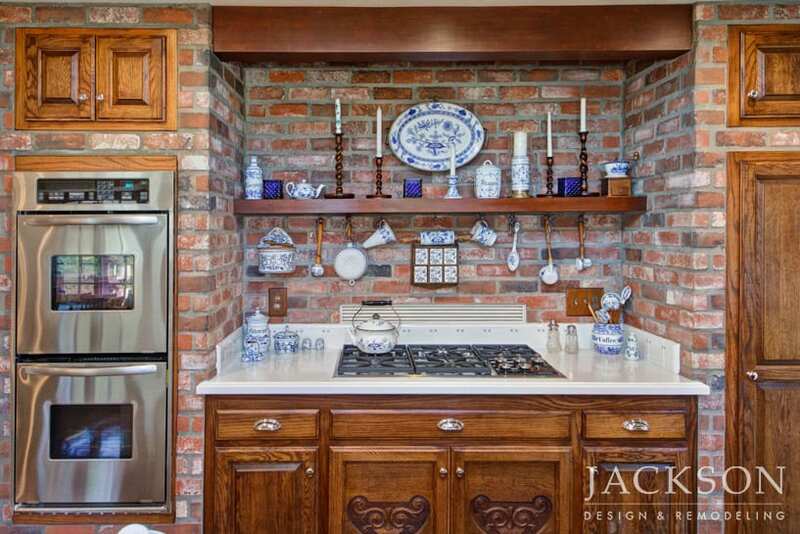 A couple with four older children needed to update their rustic kitchen. 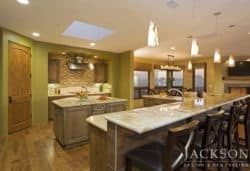 The new design achieves modern functionality while retaining elements the couple love about their cabin-like home, especially the distinctive blonde cedar. 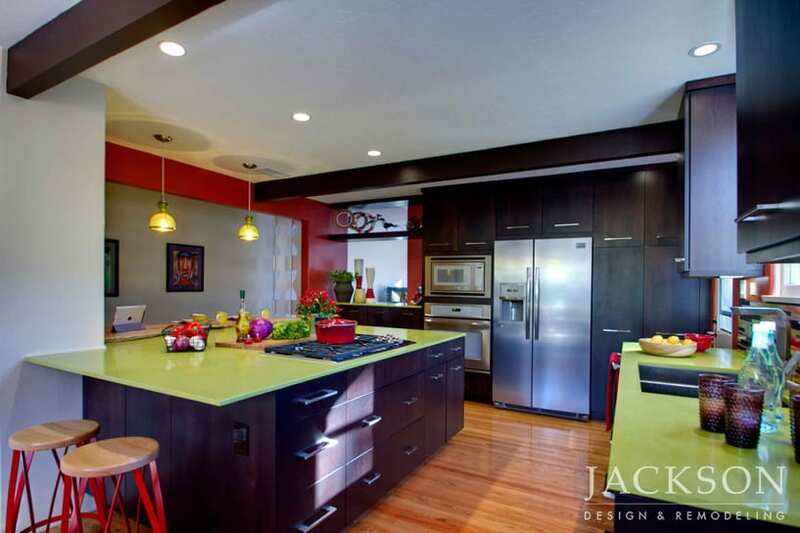 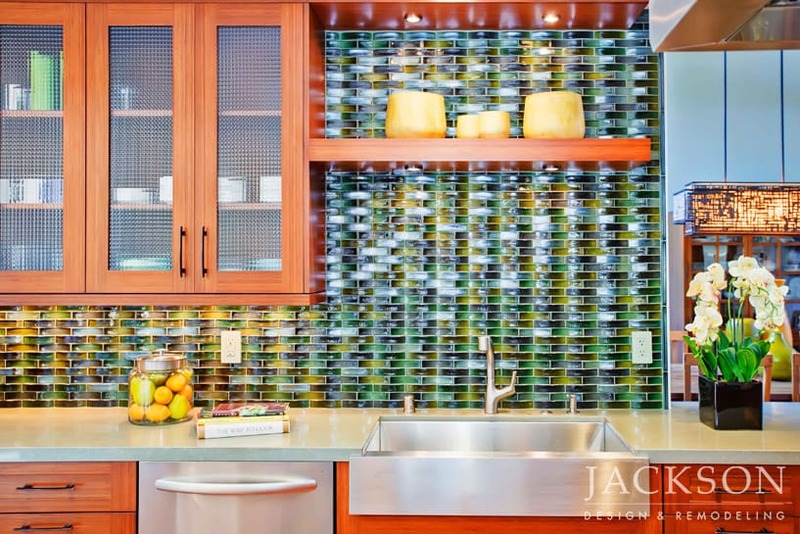 This kitchen vibrates with exciting shades of orange, green and turquoise. 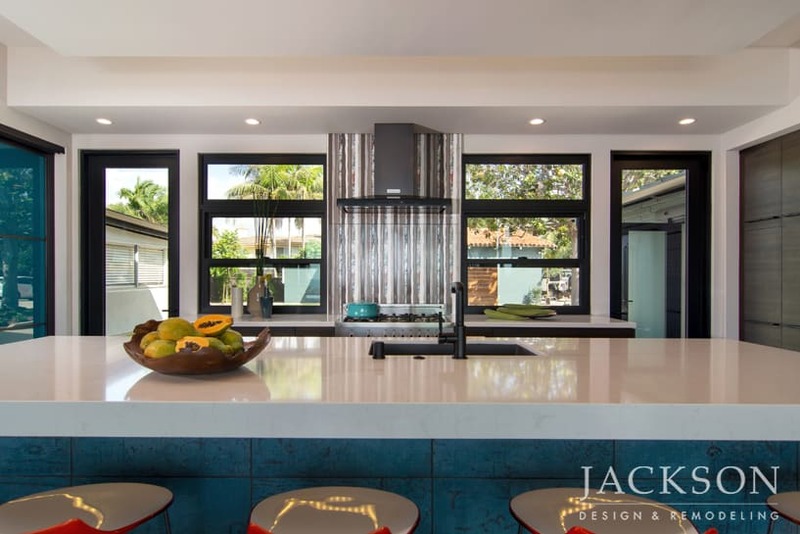 The unexpected juxtaposition of colors and textures inspires while providing ultra-modern function and style, including the reflective cooktop hood in the ceiling. 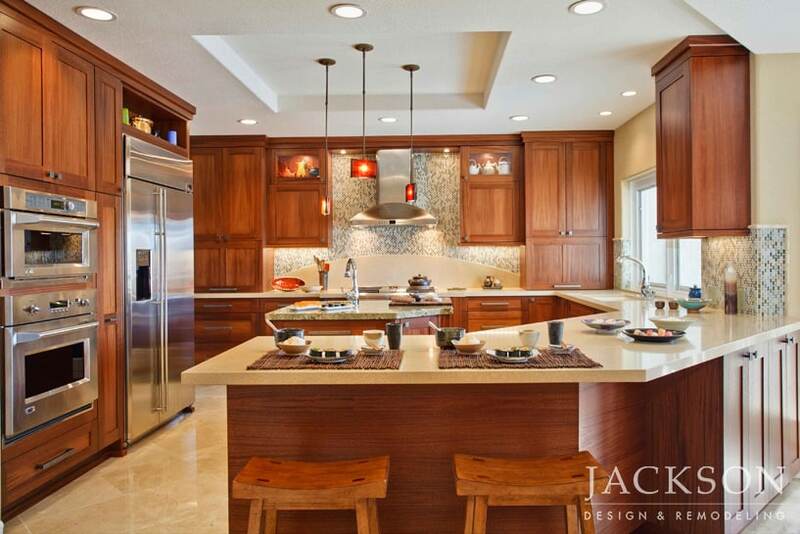 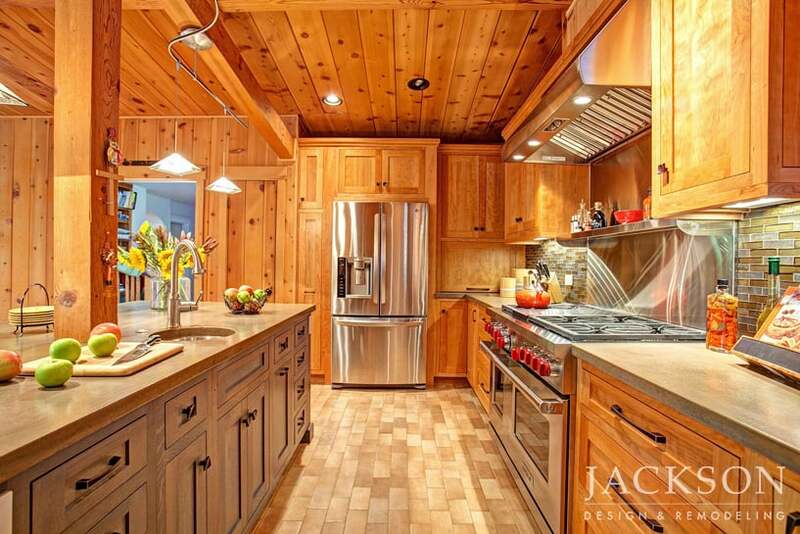 Warm wood tones act as an earthy foundation in this spacious, light filled kitchen. 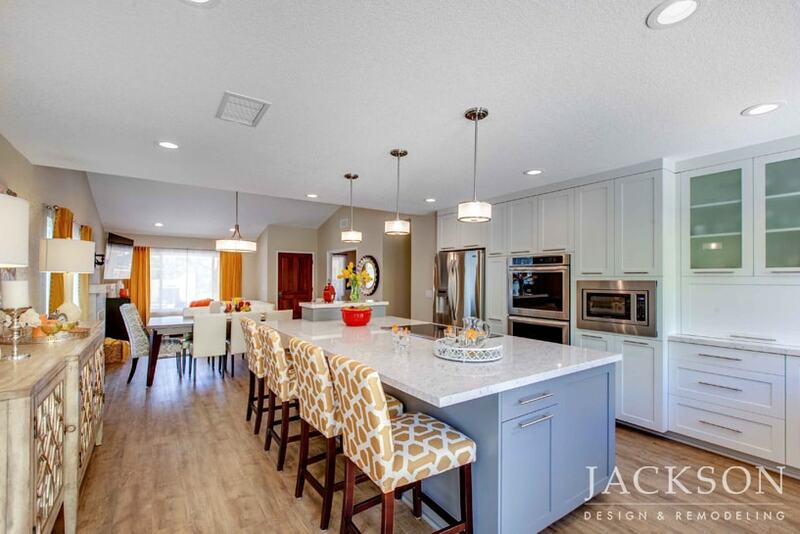 Wood vinyl flooring is the ideal choice for a home with an active pet. 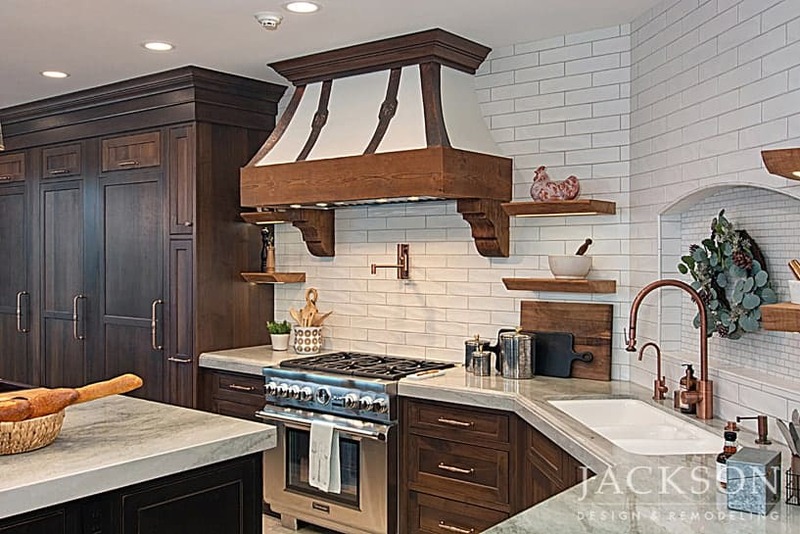 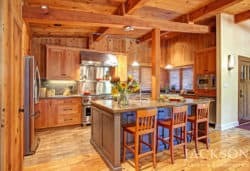 Embracing an alliance of modern and rustic sensibilities, this kitchen has earned multiple awards. 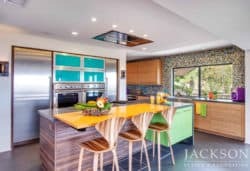 This remodel of a La Jolla Farms home designed in the 1960s by noted architect Dale Naegle imaginatively updates a masterly Mid-Century Modern kitchen. 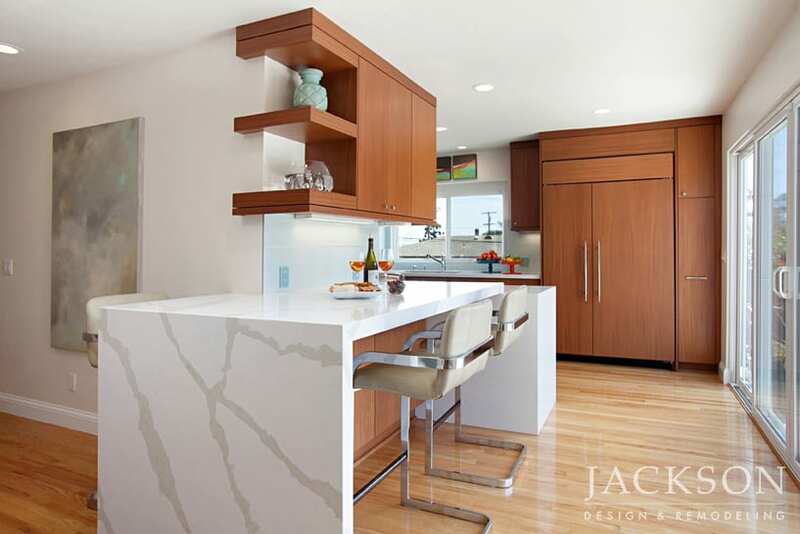 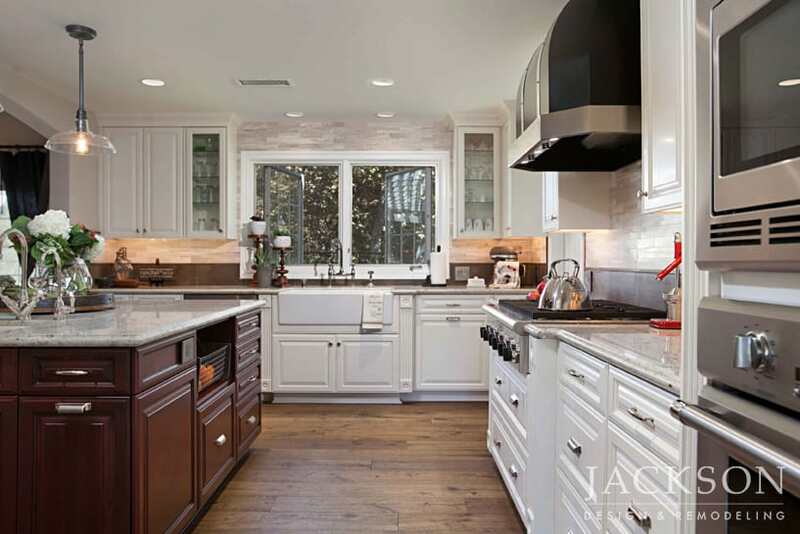 A stunning backsplash of Italian Calacatta marble wraps the award-winning kitchen in luxury. 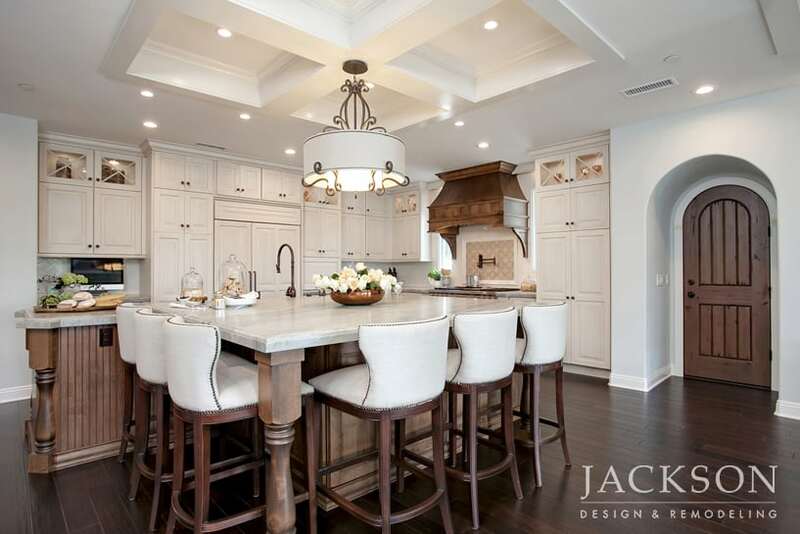 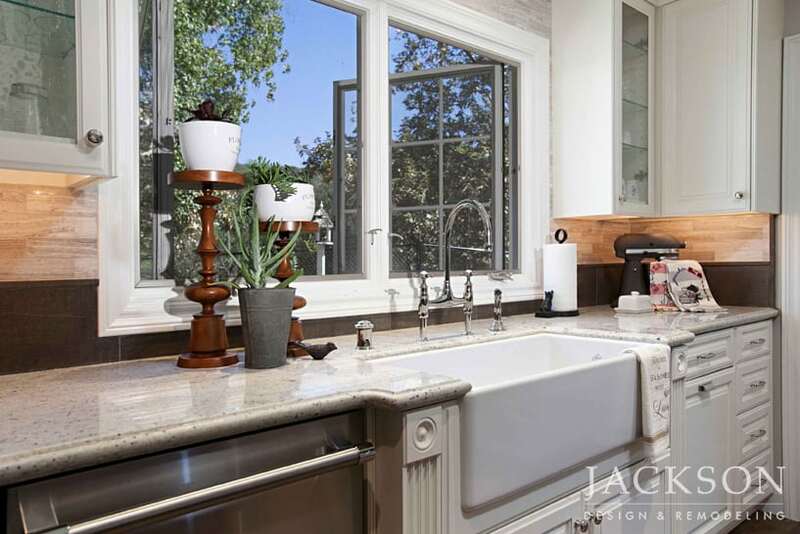 This expansive kitchen balances French Country elements with thoughtful space planning to create an environment ideal for both large gatherings and comfortable family meals. 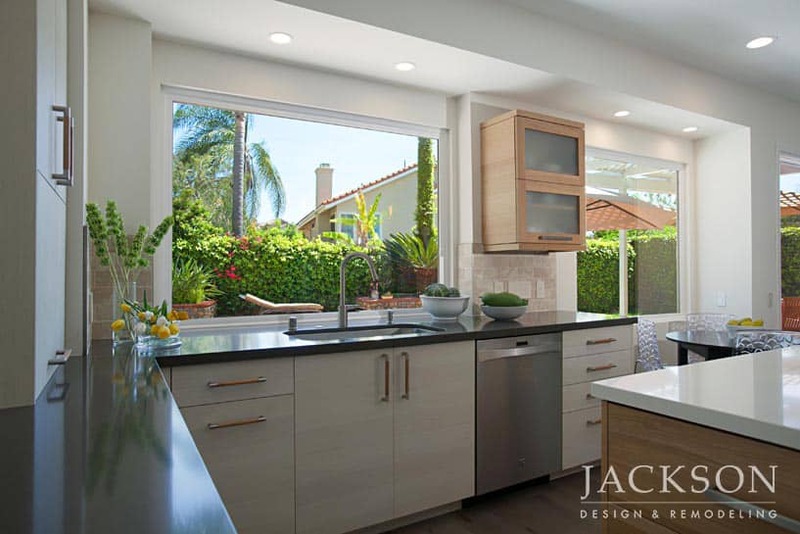 The gorgeous backyard is now a focal point in an open space filled with natural light. 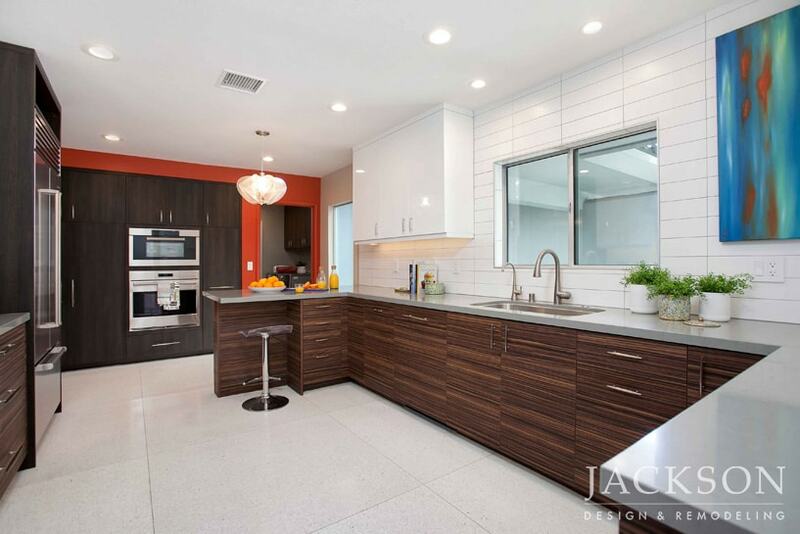 Sharing a strong affinity for Mid-Century Modern design, a young professional couple wanted their kitchen to reflect their love for an authentic expression of the style. 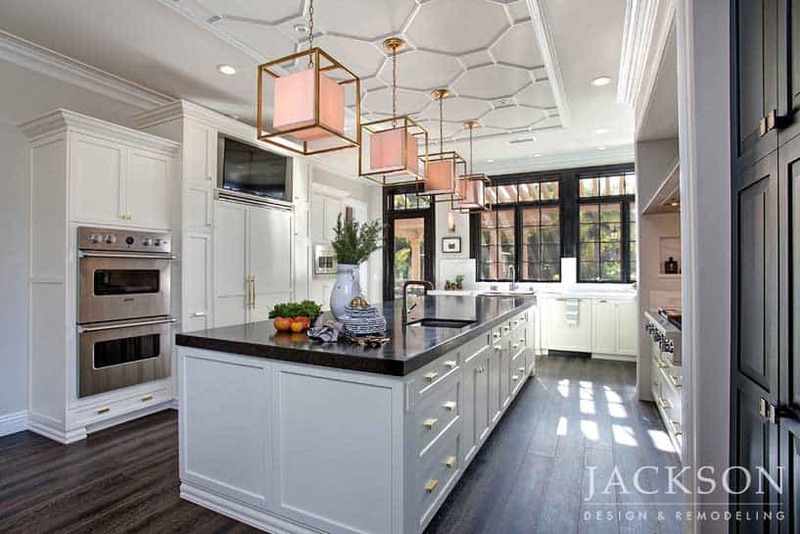 New cabinetry stands out for its bold juxtaposition of three colors and textures while a vintage 1960s pendant light brings character to the space. 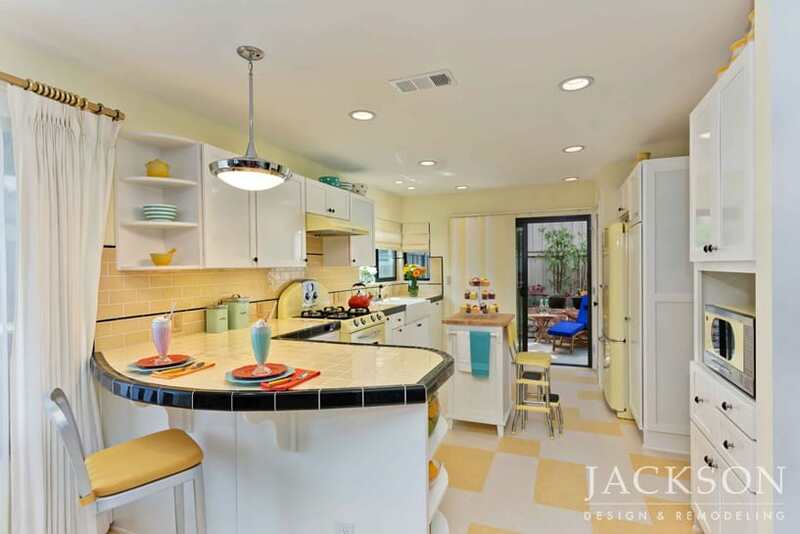 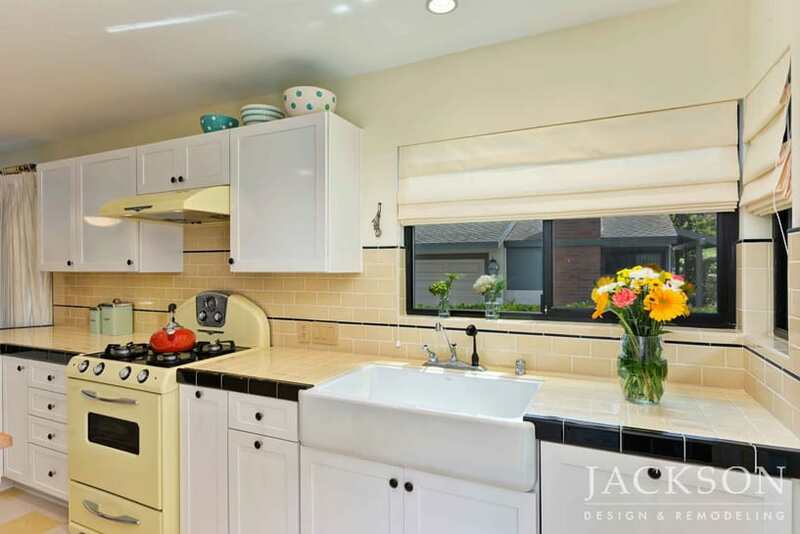 This striking kitchen is now an energetic rendition of a Mid-Century classic. 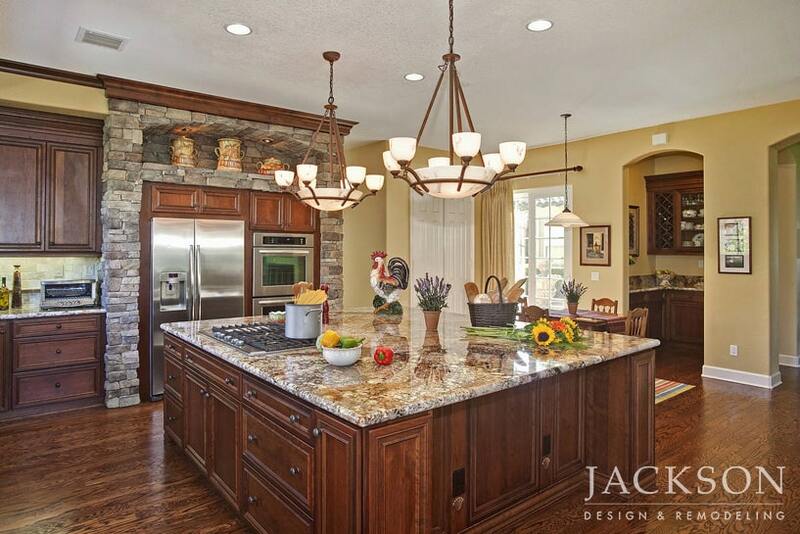 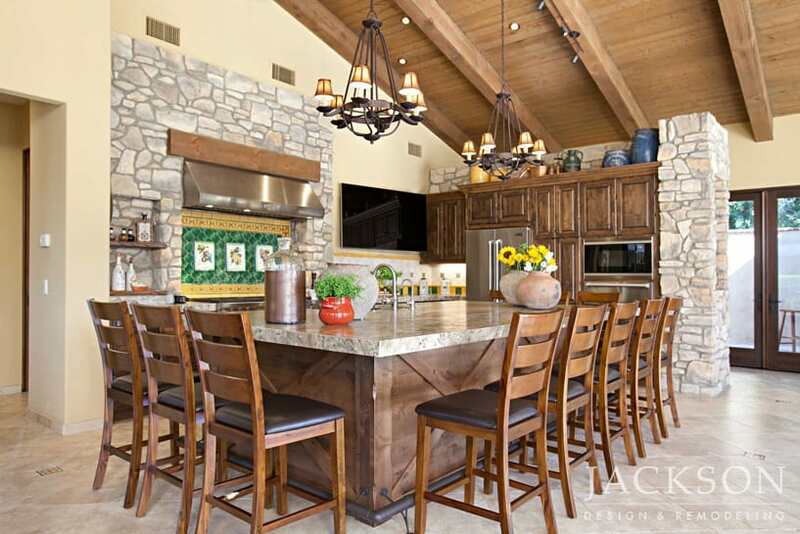 The open floor plan of this kitchen was designed for clients who frequently host large family gatherings. 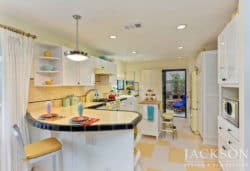 Blending modern and classic elements, along with cheerful pops of goldenrod, this bright kitchen holds timeless appeal. 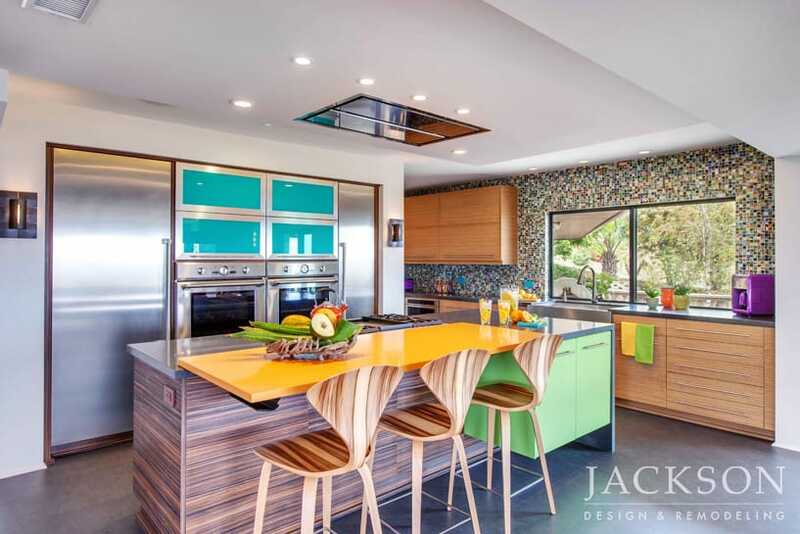 This 100-year-old Spanish home was transformed to enhance a passion for Mid-Century Modern collectibles. 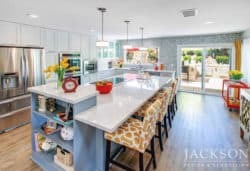 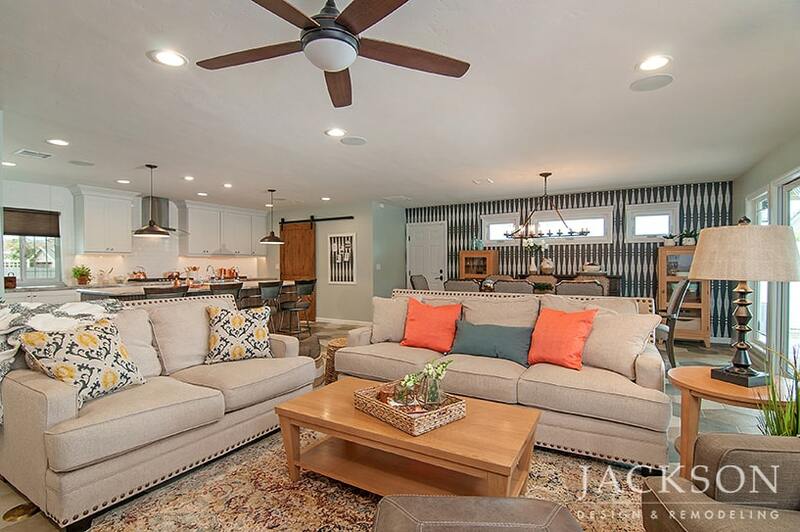 The new design takes a whimsical approach to achieving a more open and functional space with pops of bright color balanced with layers of texture and pattern. 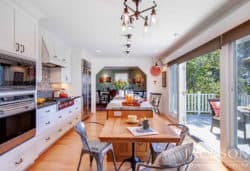 Open to an intimate dining area and a large deck surrounded by greenery, this white kitchen with an ocean view, vintage inspiration, and colorful textural details is a welcoming space for family time and entertaining. Designed for a couple who lived in Japan for two decades, this kitchen balances the beauty of treasured memories with a modern, functional space for a family with young children. 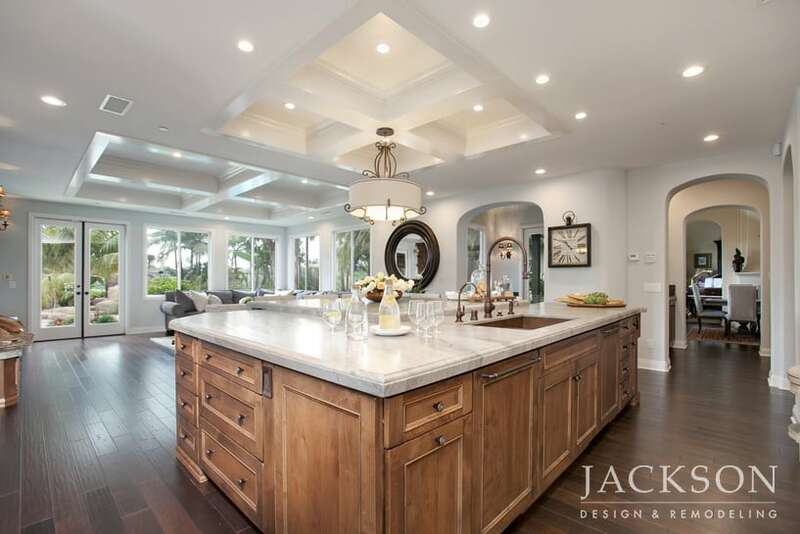 The striking layered island makes a statement of stylish simplicity. 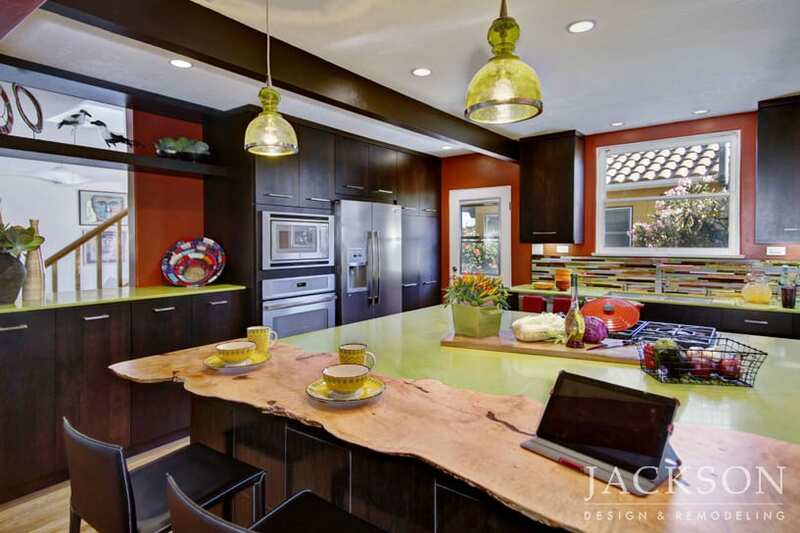 This kitchen is a luminous space in visual unity with its surroundings in an open layout. 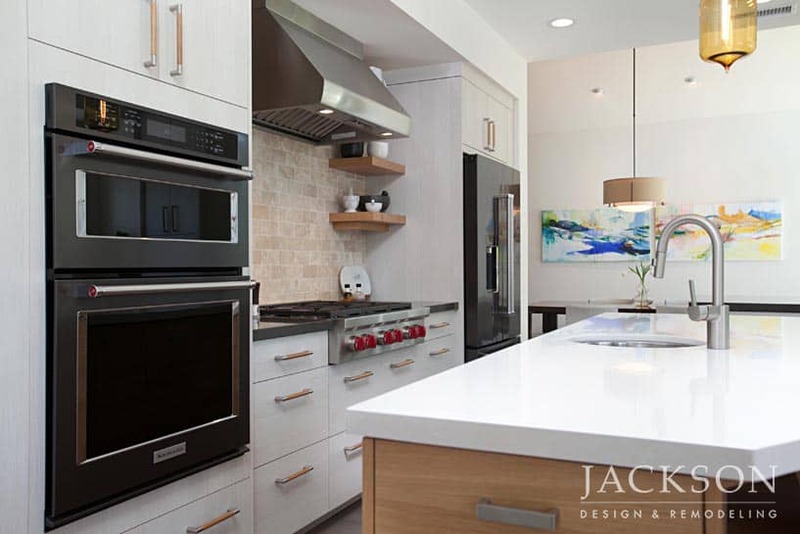 Refreshed white cabinetry outfitted with interesting hardware rejuvenates the countertops and stainless steel appliances. 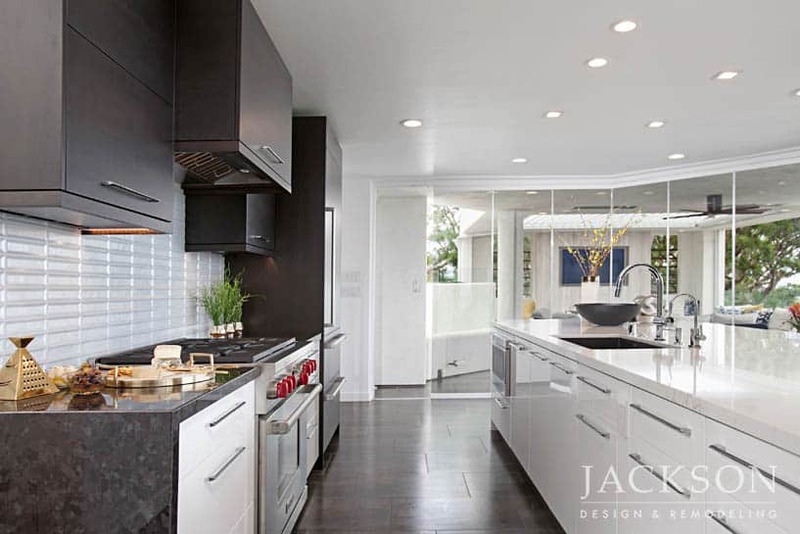 Gray walls further emphasize the invigorated look by lending distinct contrast. 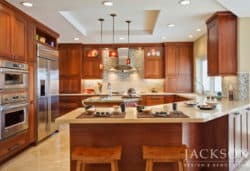 A professional couple with an appetite for glamorous entertaining wanted a more inviting kitchen. 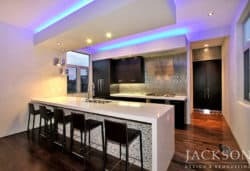 In an expansive award-winning new area defined by sweeping vaulted ceilings, the room glitters with purple, silver and charcoal hues. 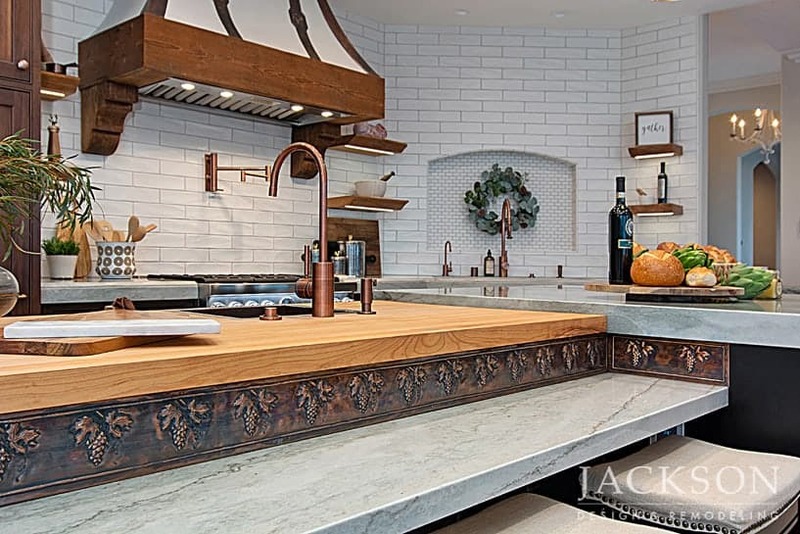 An eclectic interpretation of French Country style, this design expresses the client’s desire for a kitchen with modern functionality grounded in a classic approach. 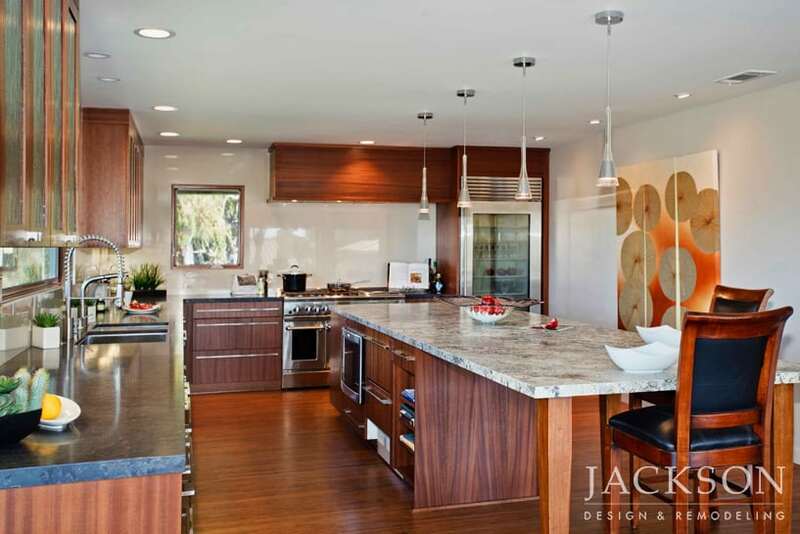 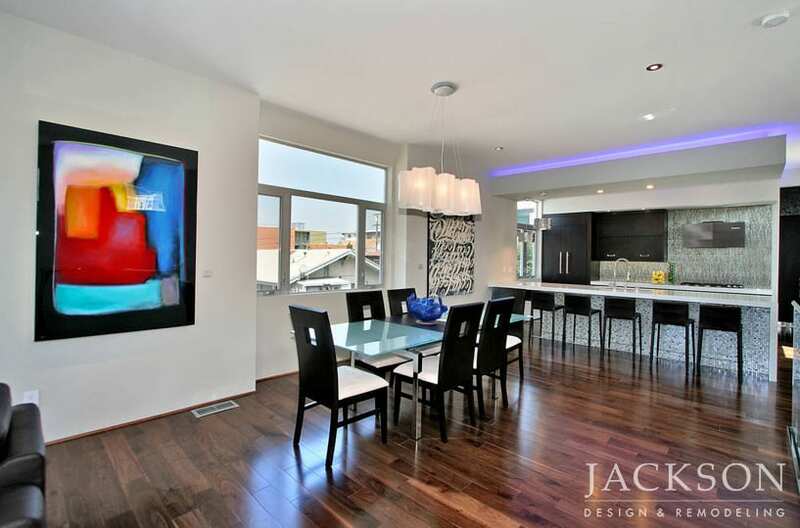 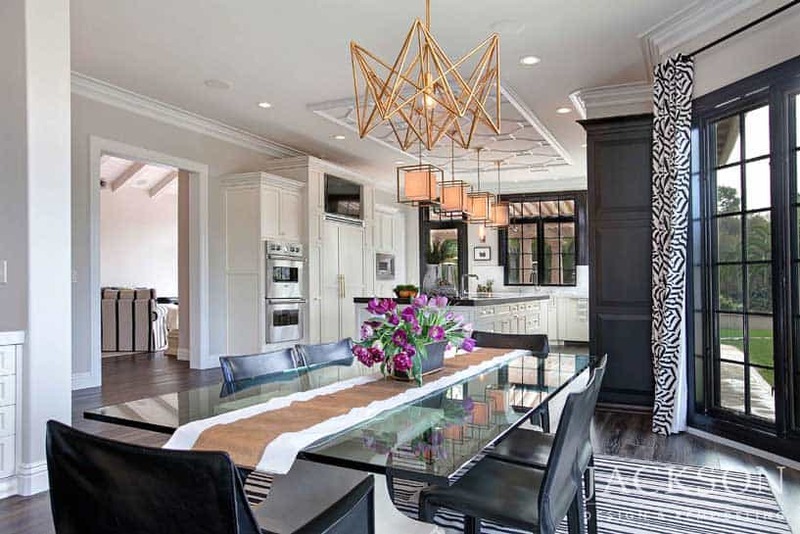 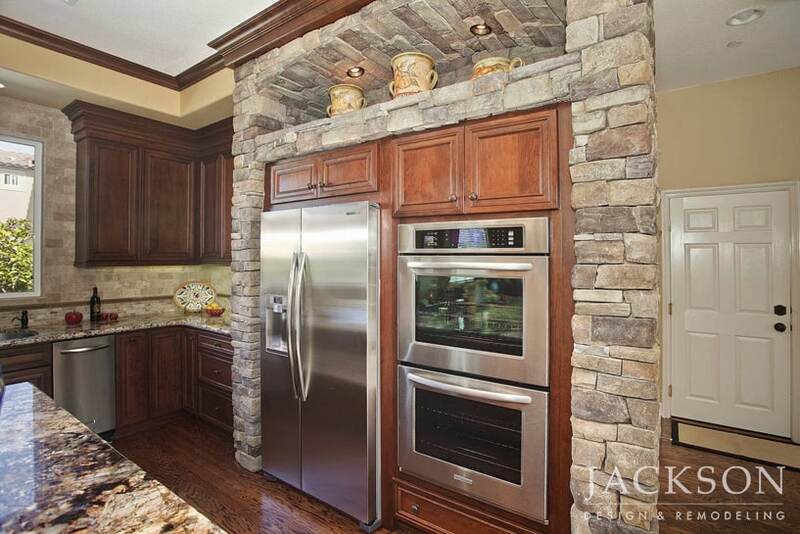 The layout was carefully reconfigured to accommodate the substantial centerpiece island. 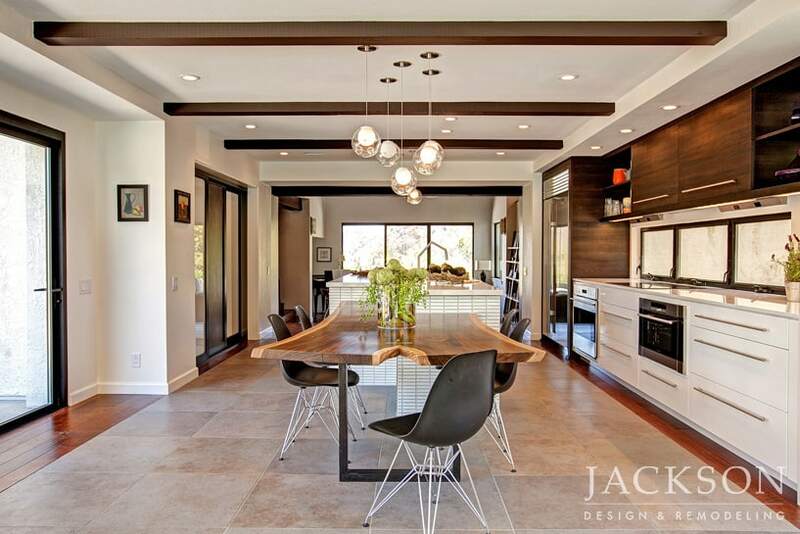 In this dynamic contemporary space, gleaming surfaces balance with a bold linear layout and natural earth tones for a dramatic effect. 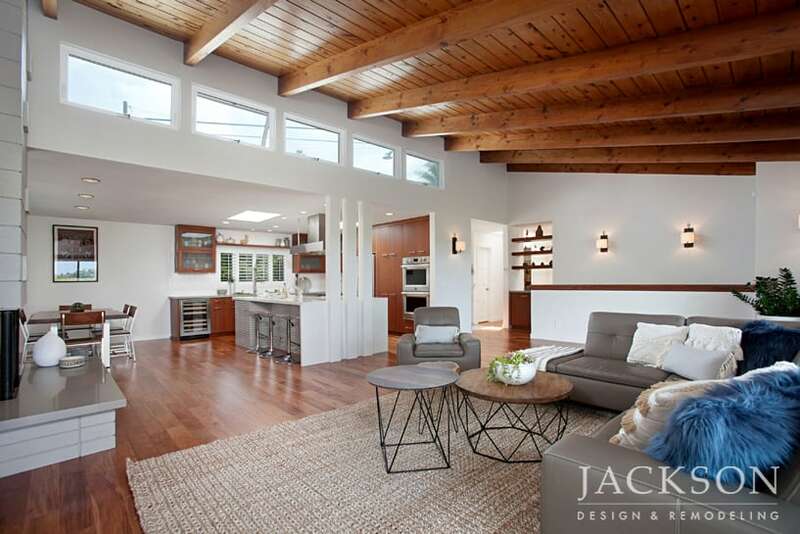 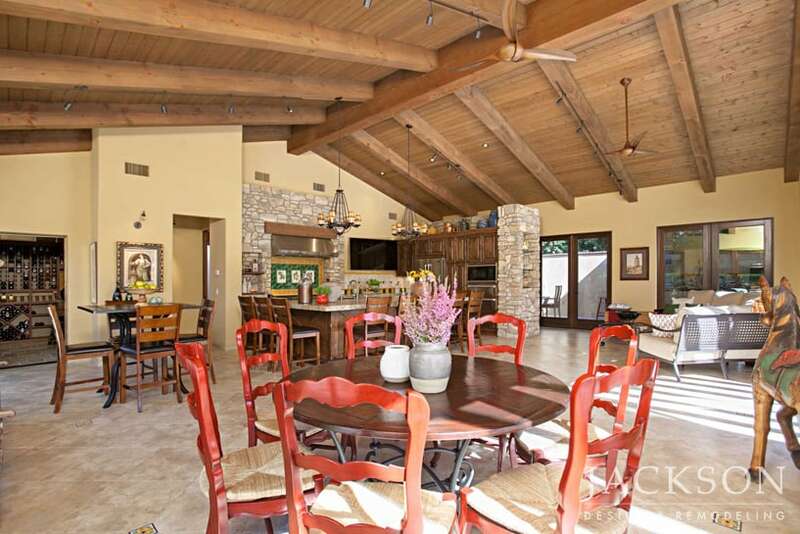 High ceilings and bountiful light add a sense of appealing openness. 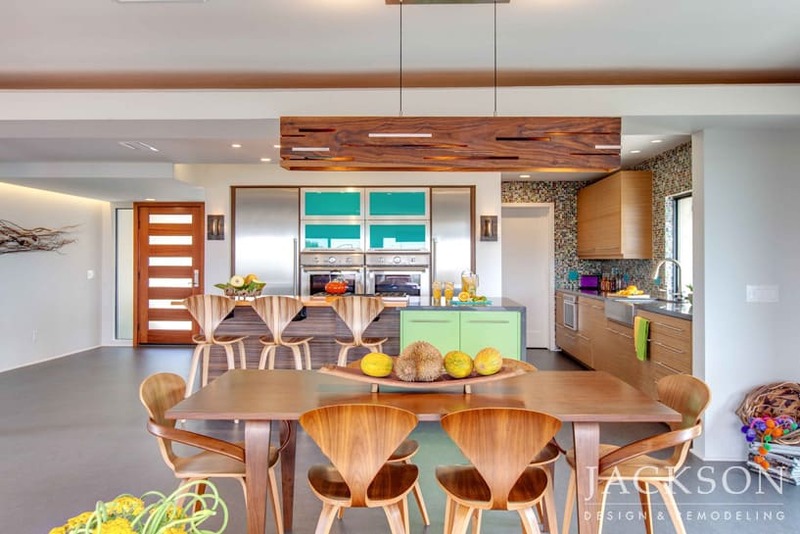 Awash in colors reminiscent of sea and sand, this kitchen celebrates the beach life with fresh style and lively bursts of aqua. 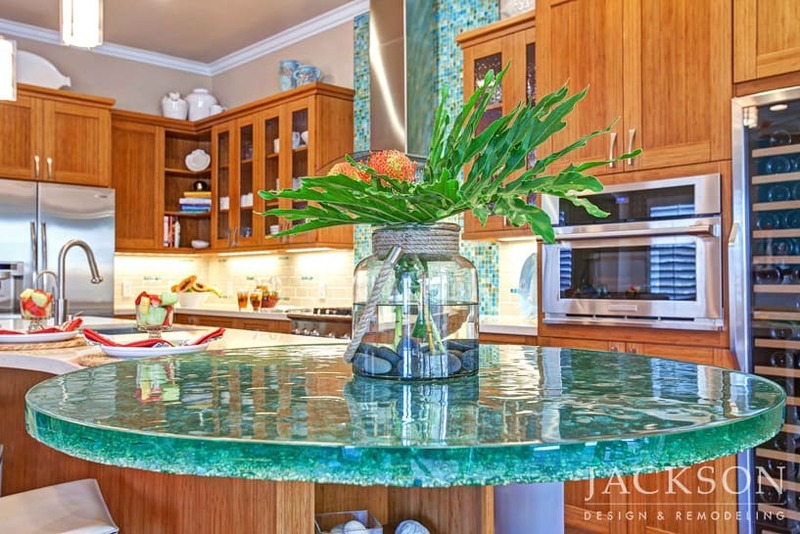 A meticulously handcrafted circular table at the island resembles the ocean floor. 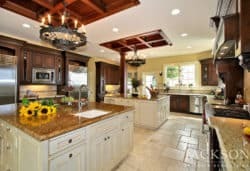 A couple’s shared love for Italy is expressed in this charming kitchen, with a design reminiscent of Old World Tuscany. 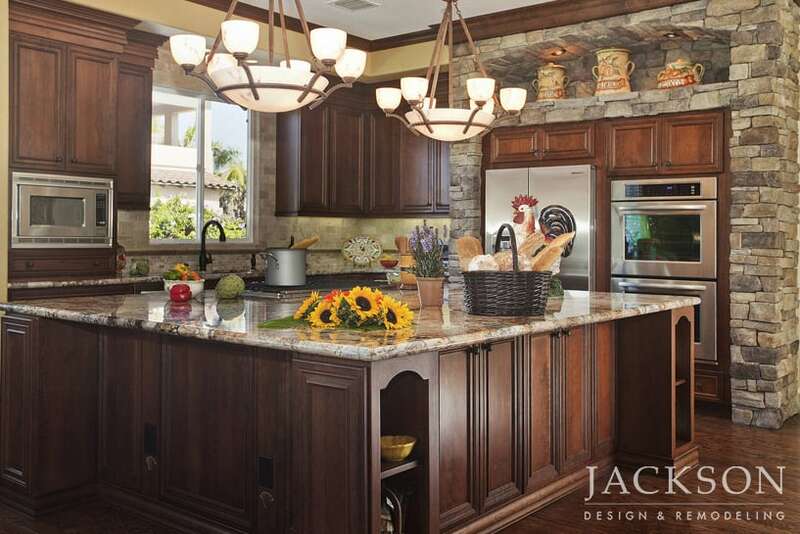 This award-winning kitchen evokes the Old World while providing all the modern conveniences of contemporary life. 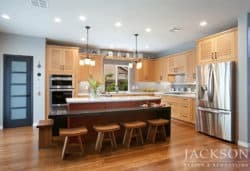 A red island and black custom hood are bold accents of color in this fresh Modern Farmhouse kitchen. 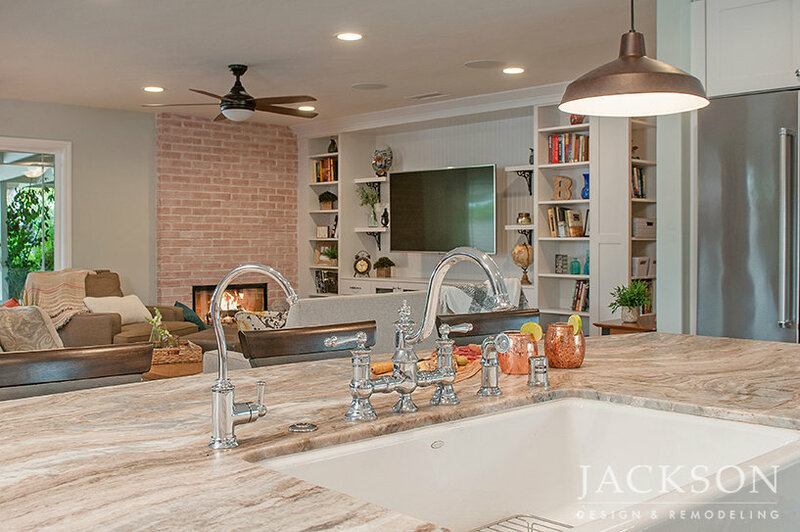 New windows lend abundant natural light a classic farmhouse sink and vintage-inspired pendant lighting add elements of rustic and industrial style. 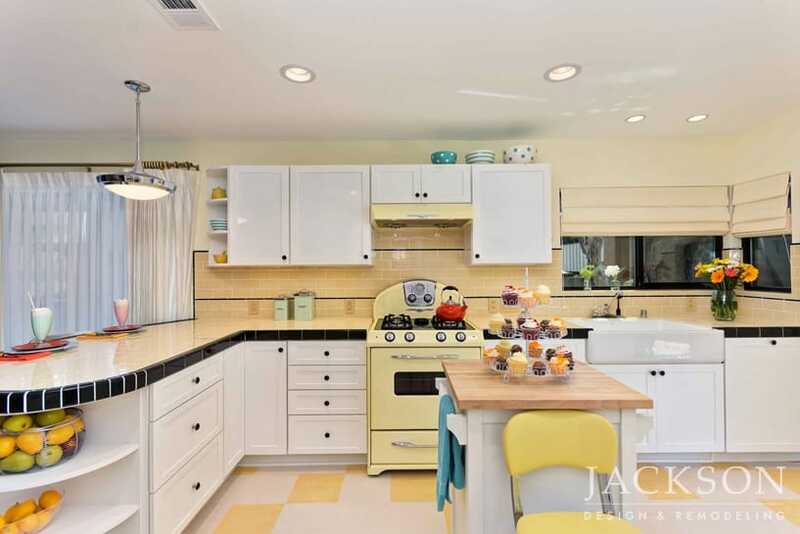 For a client enthusiastic about retro design, this award-winning space is a sunny ode to kitchens of the past and a cheerful retreat for today. 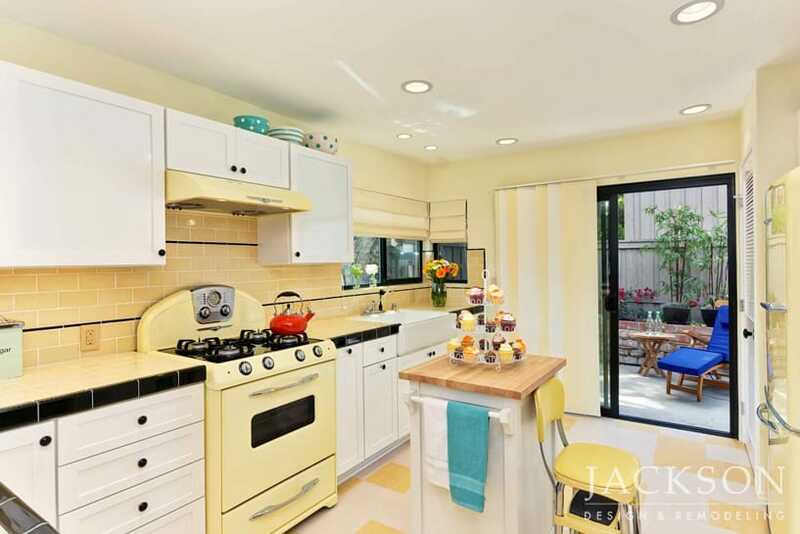 Yellow retro-inspired appliances set the tone in this classic kitchen with an original point of view. 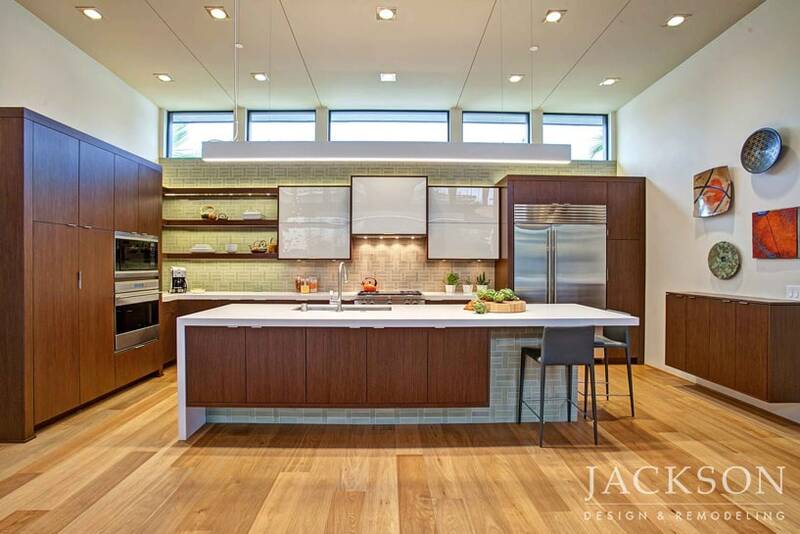 White cabinetry pops against a vibrant green backdrop in this kitchen for a creative young couple in Solana Beach. 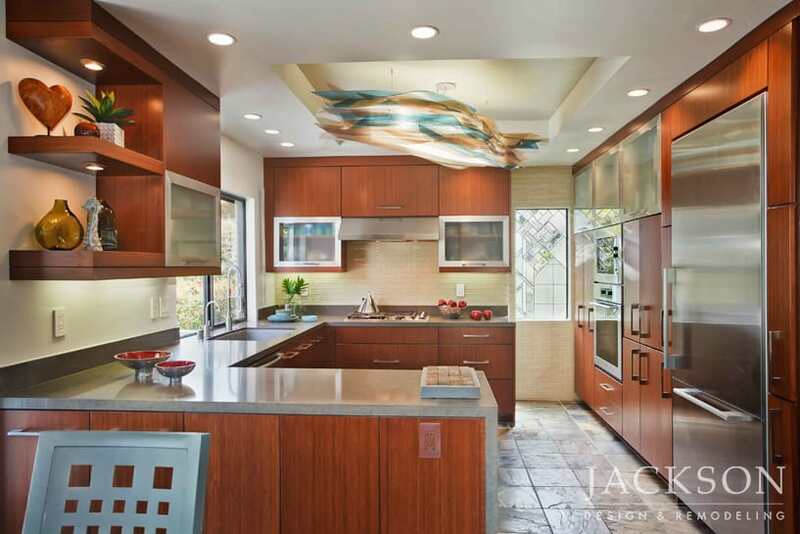 A cabinet crafted from Indonesian boats adds an intriguing note of character. 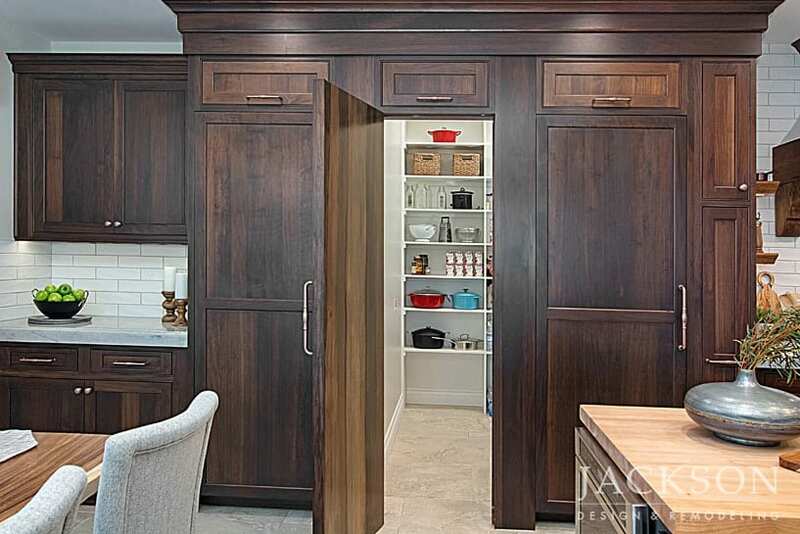 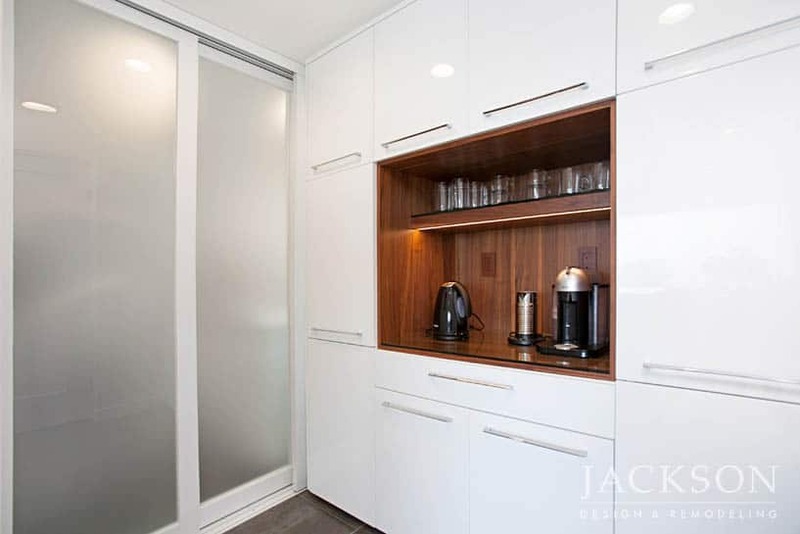 This waterfront condo kitchen stays within the building’s structural restrictions while attaining significantly more storage, counter space and visual appeal. 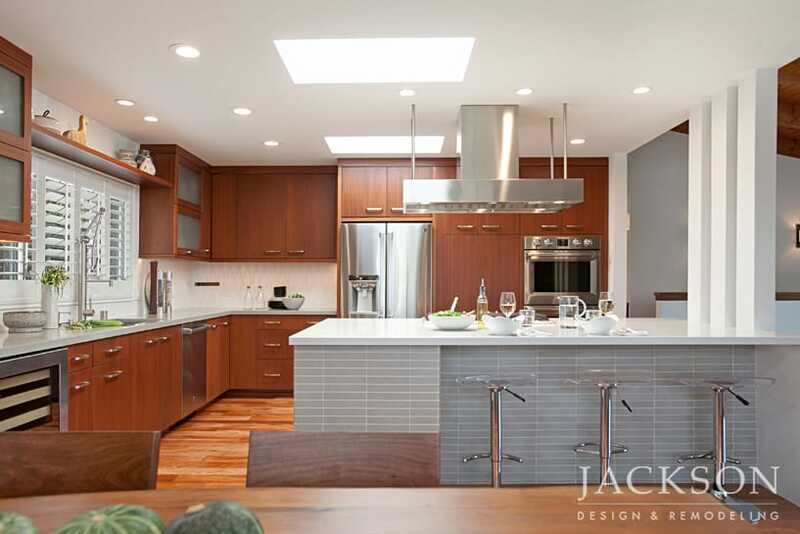 A sleek electric cooktop doubles as counter space, a smart strategy in a smaller kitchen. 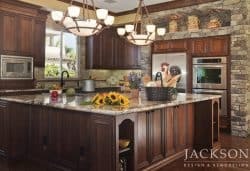 An active retired couple with a shared appreciation for early American art wanted their kitchen to better accommodate family time with children and grandchildren. 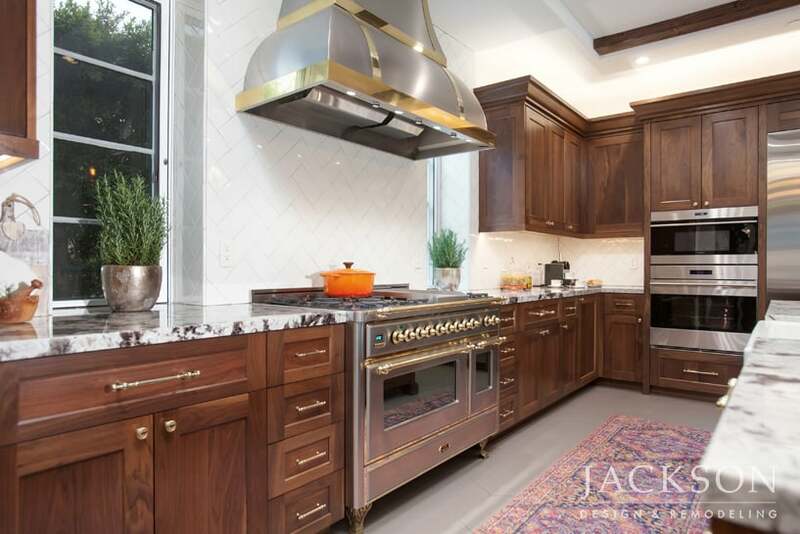 The new kitchen honors the design of early America in an expansive, light-filled space. A retired couple with a shared love for art wanted a new kitchen in their architect-designed home. 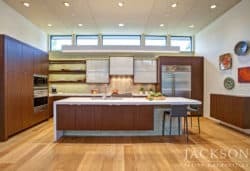 Their award-winning new kitchen is full of light and life in a space designed with careful attention to balance and symmetry. 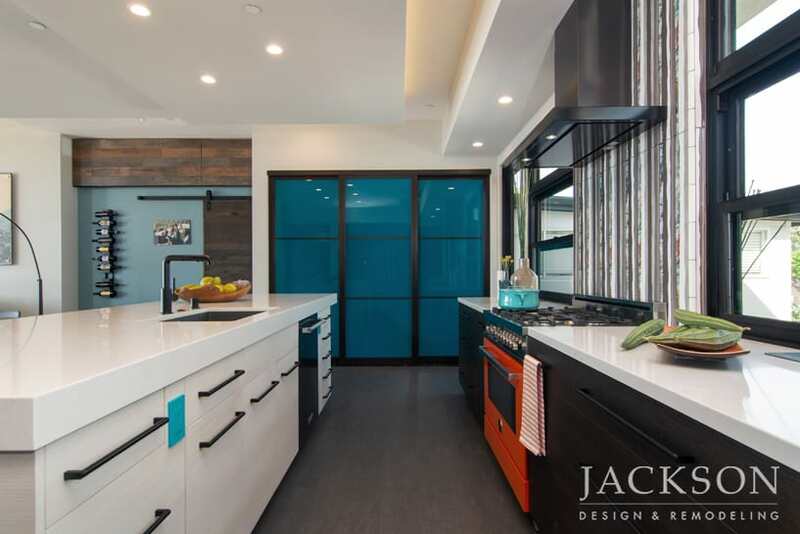 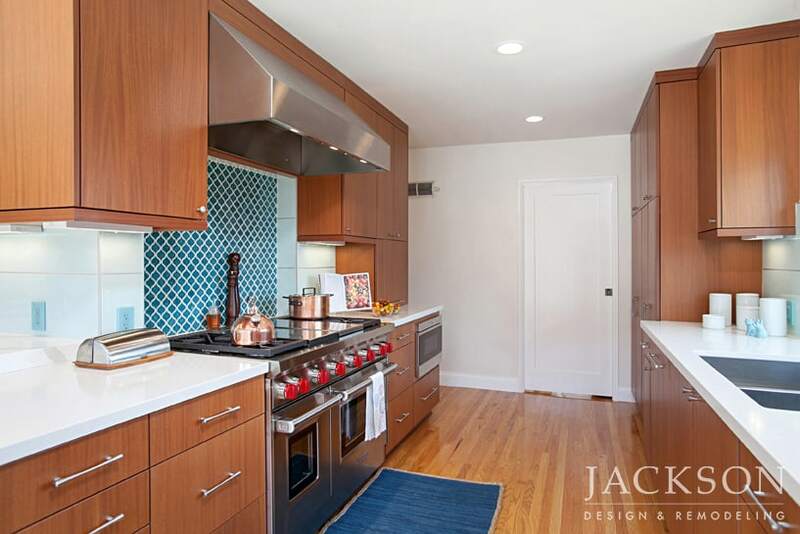 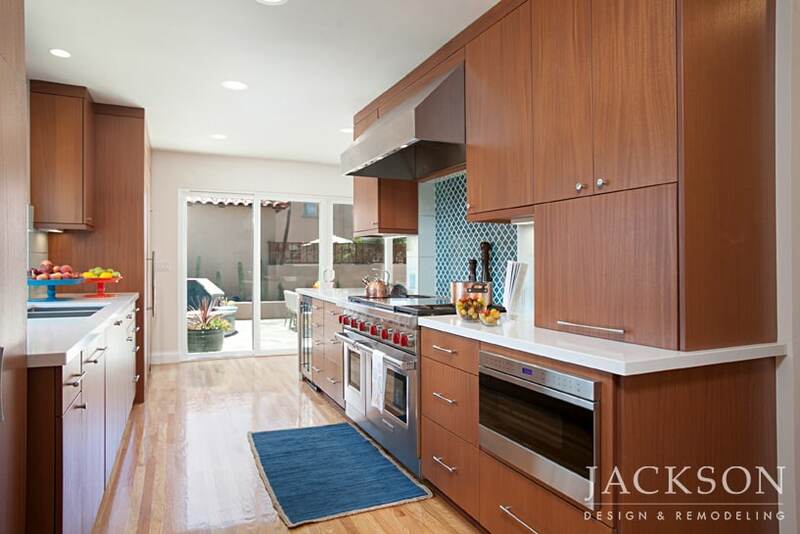 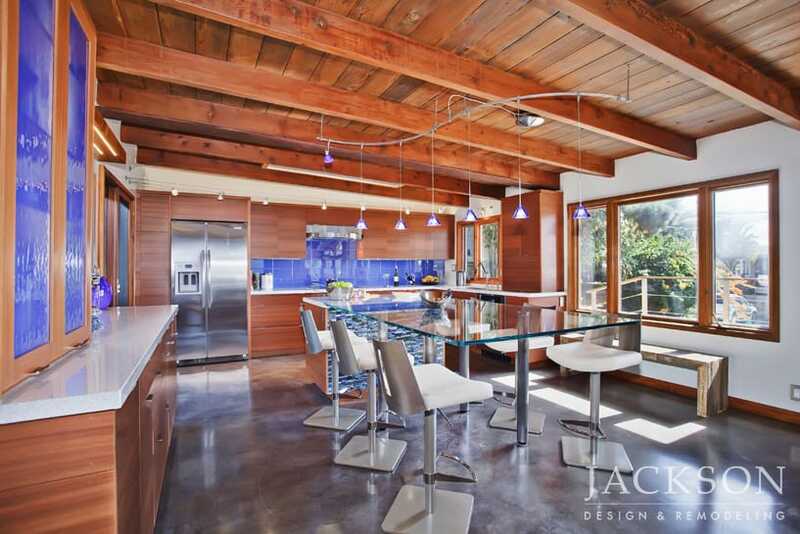 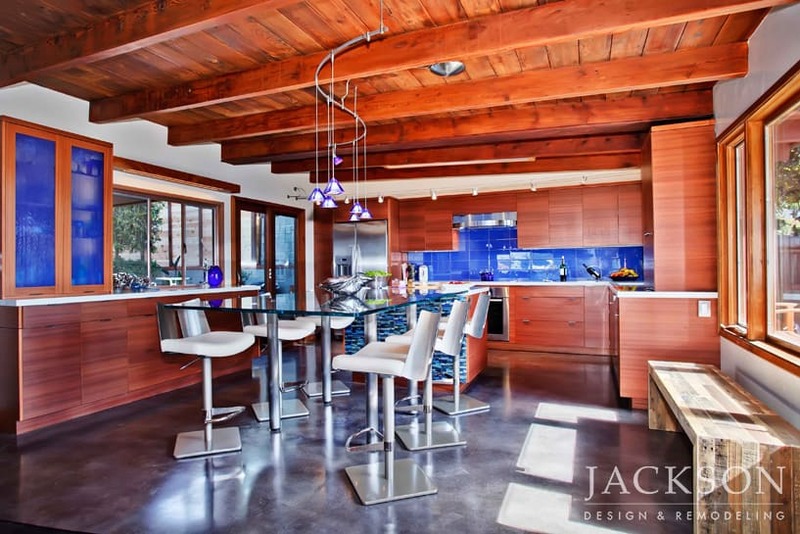 This bold award-winning kitchen delights the eye with vivid blue details and warm wood tones while honoring the vision of the notable local architect, Loch Crane, who built the original home in 1952. 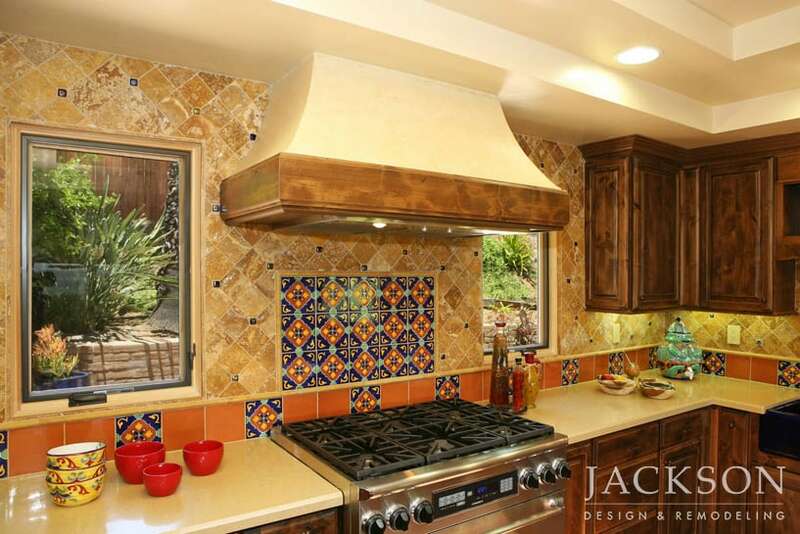 A creative couple wanted a kitchen with modern functionality that honored the character of their 1920s Spanish-style home. Their award-winning new kitchen stimulates the senses, expresses the clients’ diverse cultural interests and embodies their independent spirits. 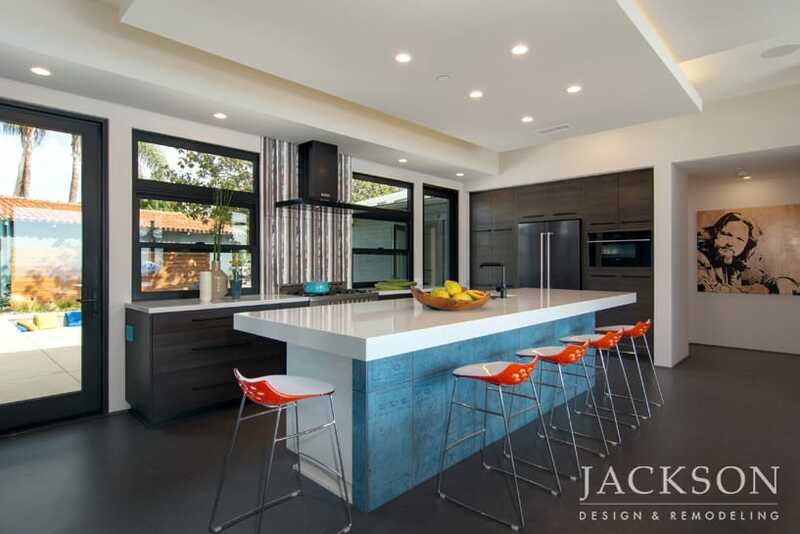 This kitchen in a newly constructed home was the 2009 CaesarStone National Dream Design Contest Winner. 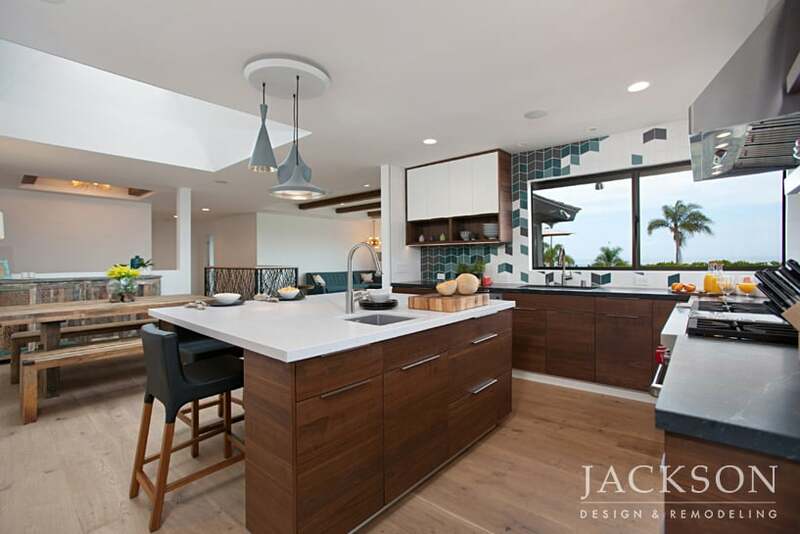 Modern, unusual elements bring the space to life, including gleaming island pendants, a futuristic faucet, and an abstract paneled range hood. 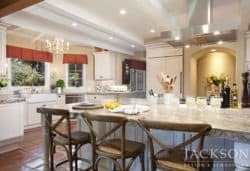 A professional “empty nest” couple with eclectic tastes decided it was time to update the kitchen and bar in their elegant estate. 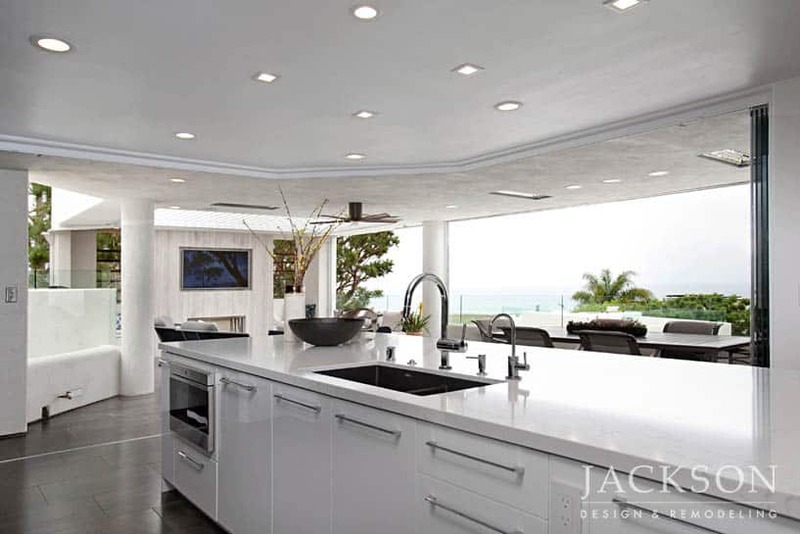 The new design synchronizes function with style and dramatically increases a feeling of spaciousness. 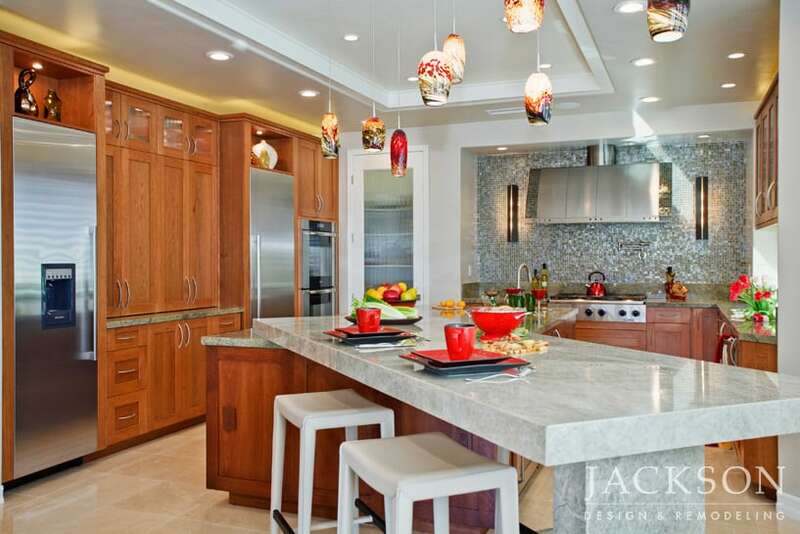 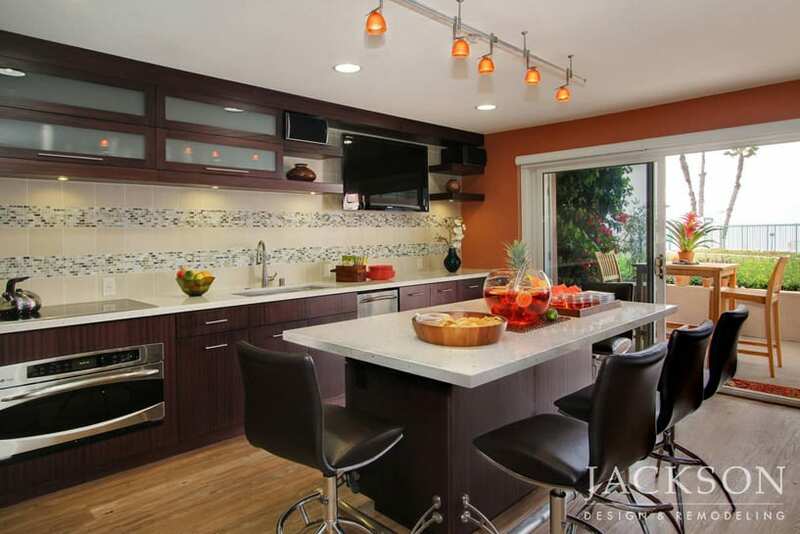 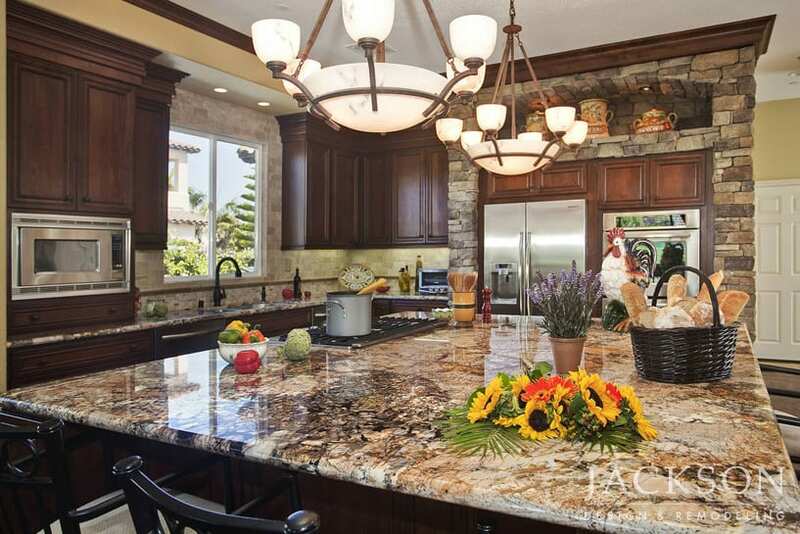 This kitchen for KFMB-TV (CBS 8) news anchor Larry Himmel and his wife Joan melds warm lighting with rich materials and vibrant color to create a memorable, welcoming environment. 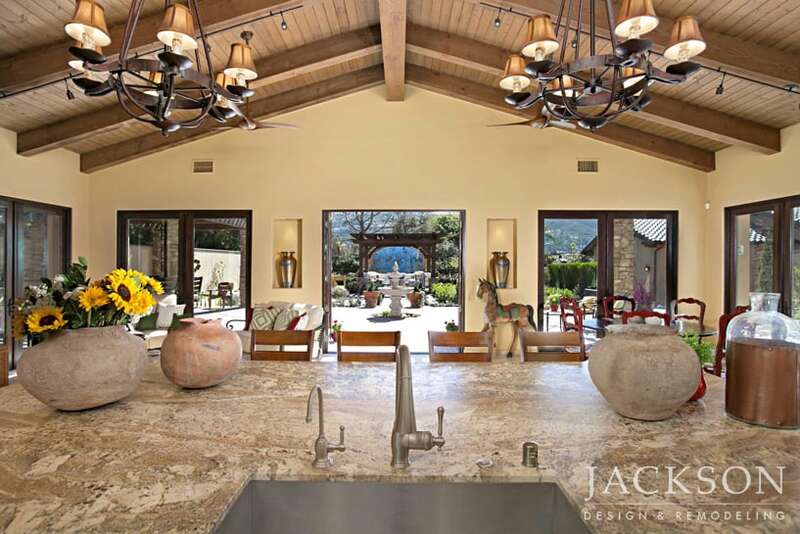 This secluded weekend getaway, an expansive adobe home in the mountains, is a couple’s future retirement home. 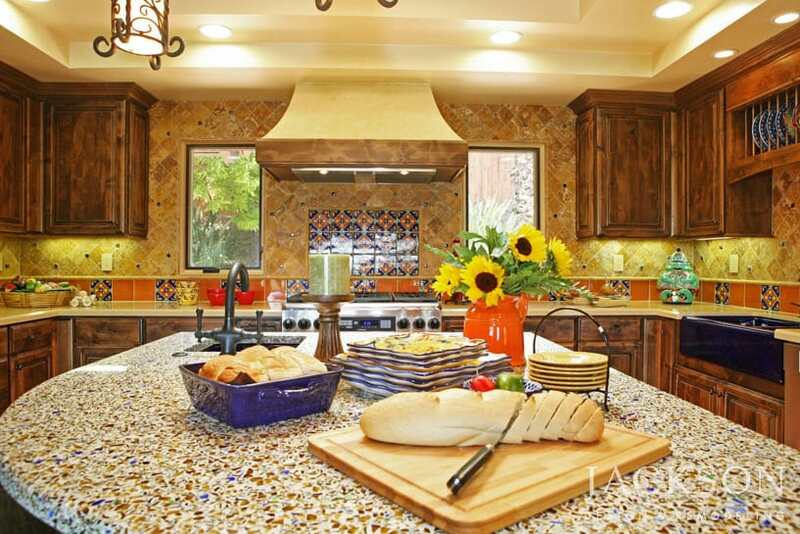 Their new kitchen is now a light-filled centerpiece with lively colors and authentic Mexican elements. 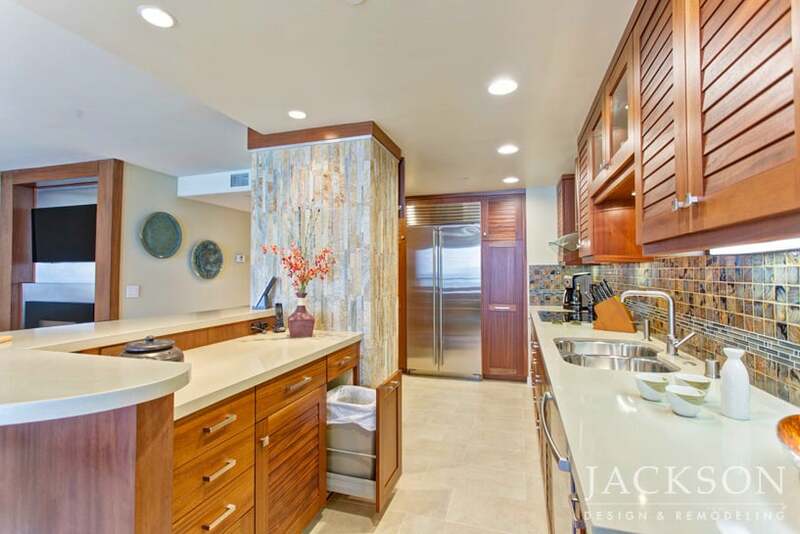 This condo near the beach is a weekend and summer getaway for a professional couple. 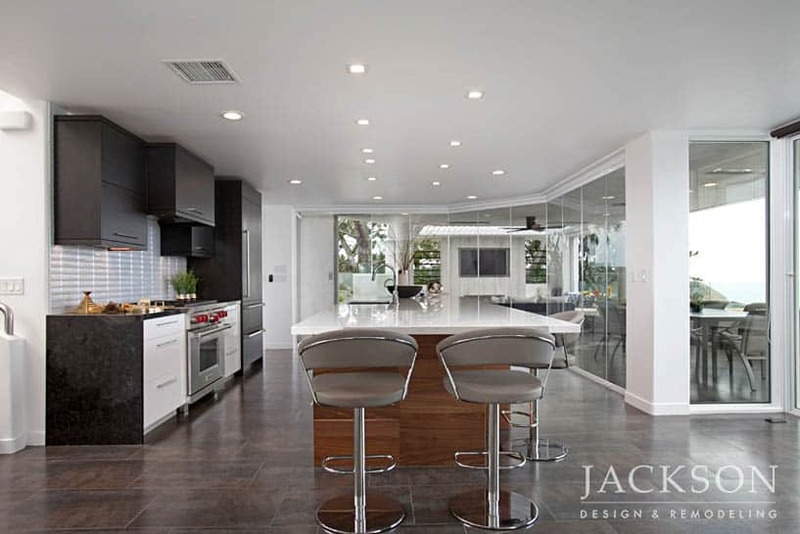 The new kitchen’s fresh, modern and uncomplicated point of view earned the design multiple awards. 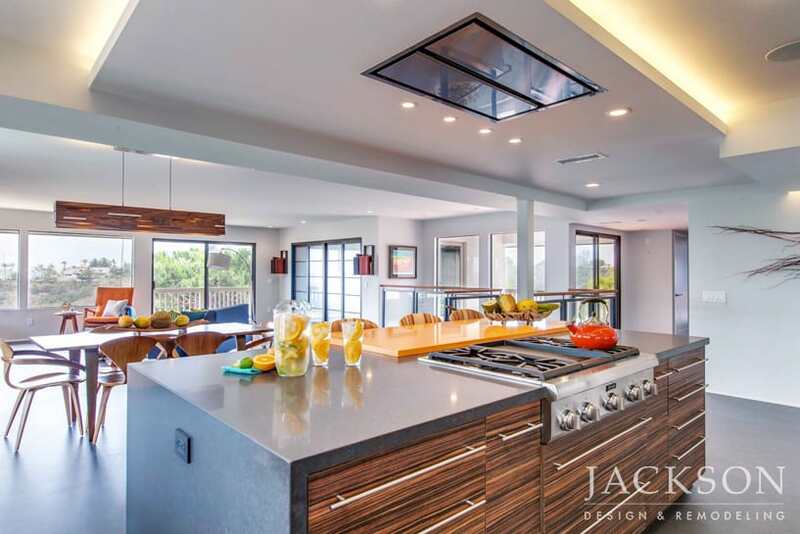 Placed on a new third level, this kitchen was designed with a welcoming, functional, ultra-clean layout and integrated with the living and dining area to accommodate entertaining friends and appreciating panoramic views. 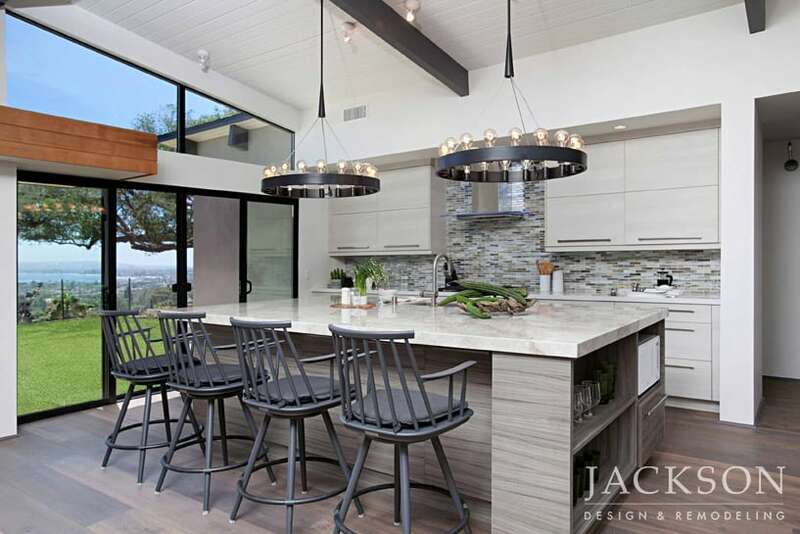 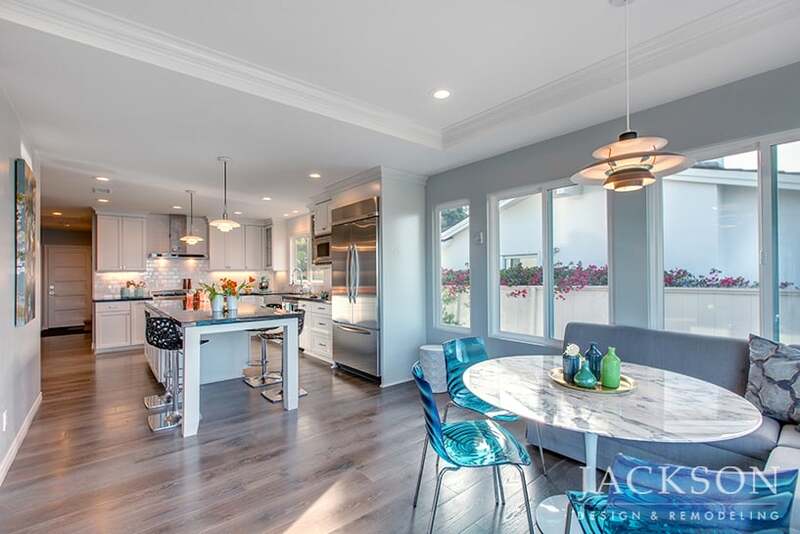 Designed for a chef with a recently published cookbook, this sleek restaurant-style kitchen in a Mission Hills home gracefully combines epic proportions with elegant lines. 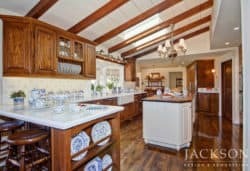 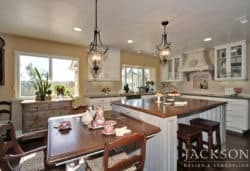 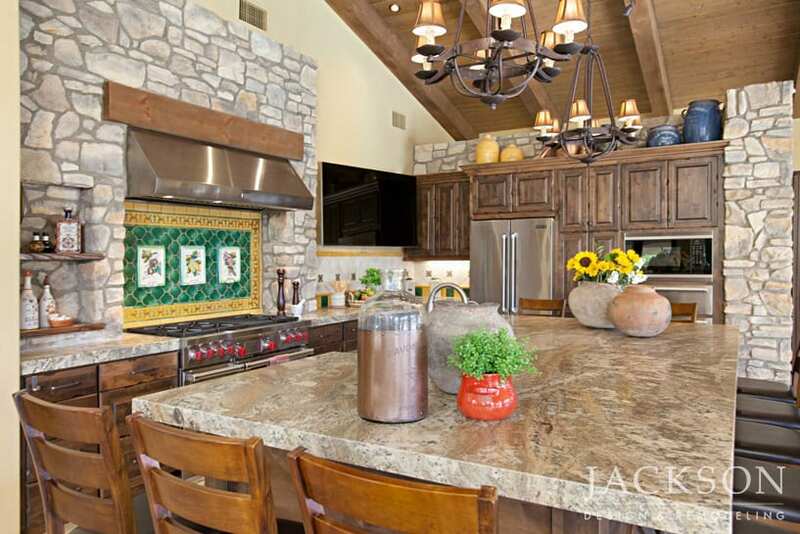 Named “2012 Kitchen of the Year“ by Ranch & Coast Magazine, this kitchen remodel was designed for enthusiastic members of a wine club who love to entertain at home. 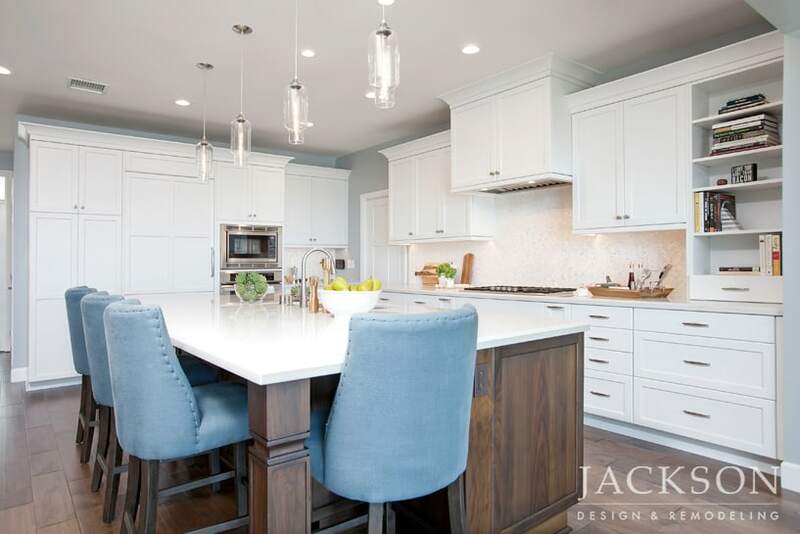 When you’re planning a custom kitchen in your whole home remodel, the most important decisions revolve around how you want your space to function for your lifestyle today and in the future.